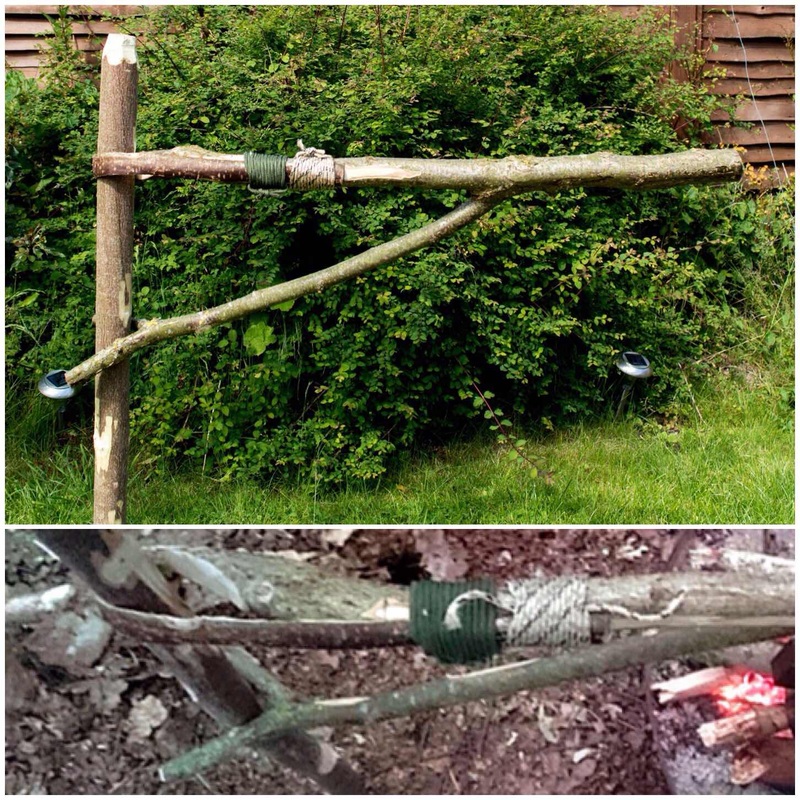 I had a great time constructing contraptions to use around the campfire last year so I thought a little summary post of them all was in order. This post is not about how to construct any of the contraptions themselves (I will link to the relevant How To…. guides in the title of each section) but my personal thoughts on them. 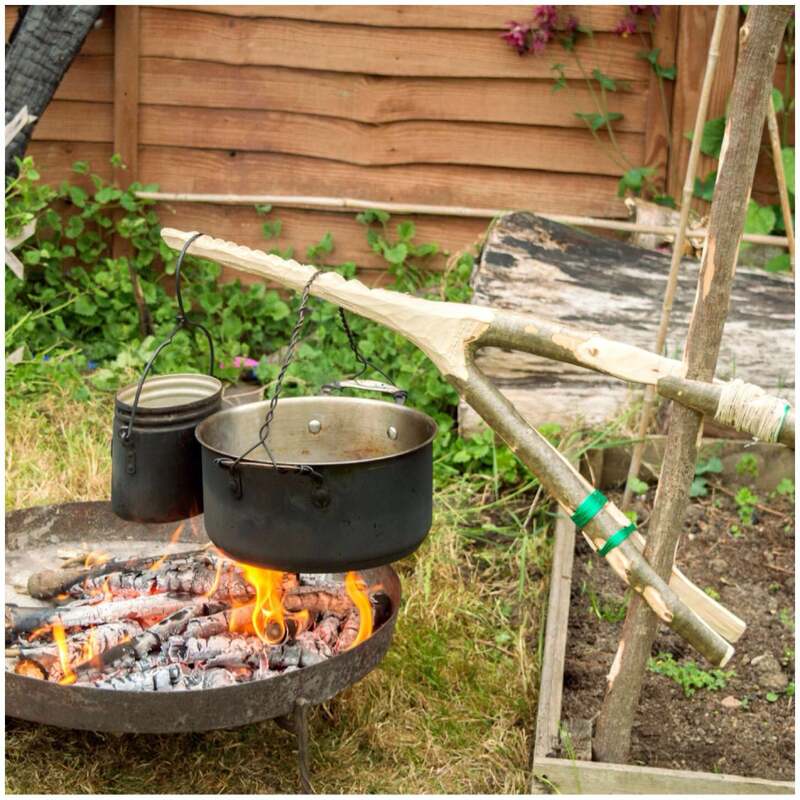 I appreciate campfire gadgets are not for everyone and they may be seen as overcomplicating the cooking process however I think they are great fun to construct. Before building any gadgets it is good to have an actual fire. 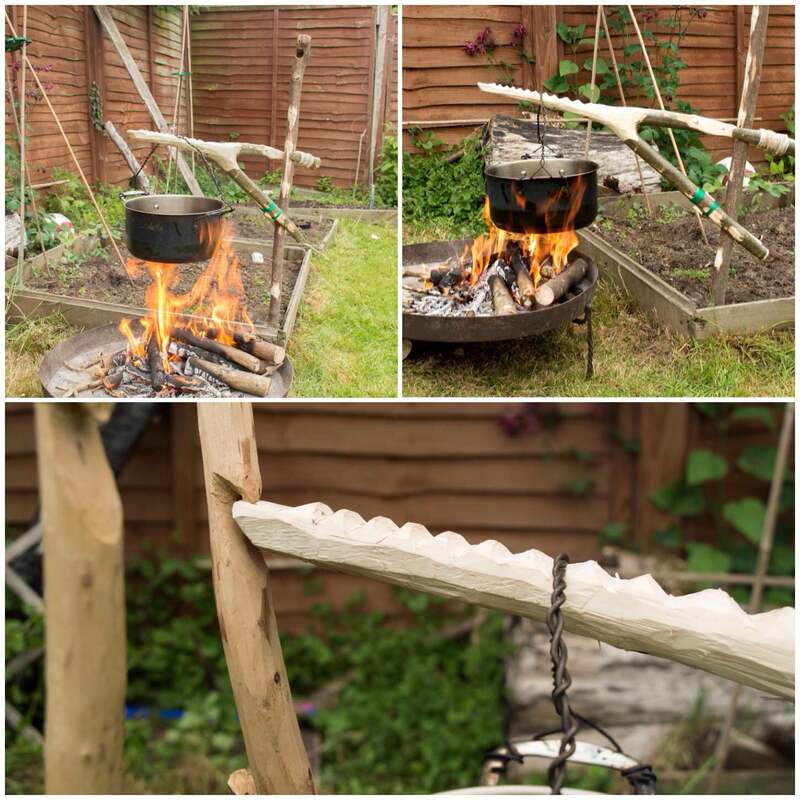 I was asked to help build a raised firepit/platform by my friend John Rhyder at the Woodcraft School training area. 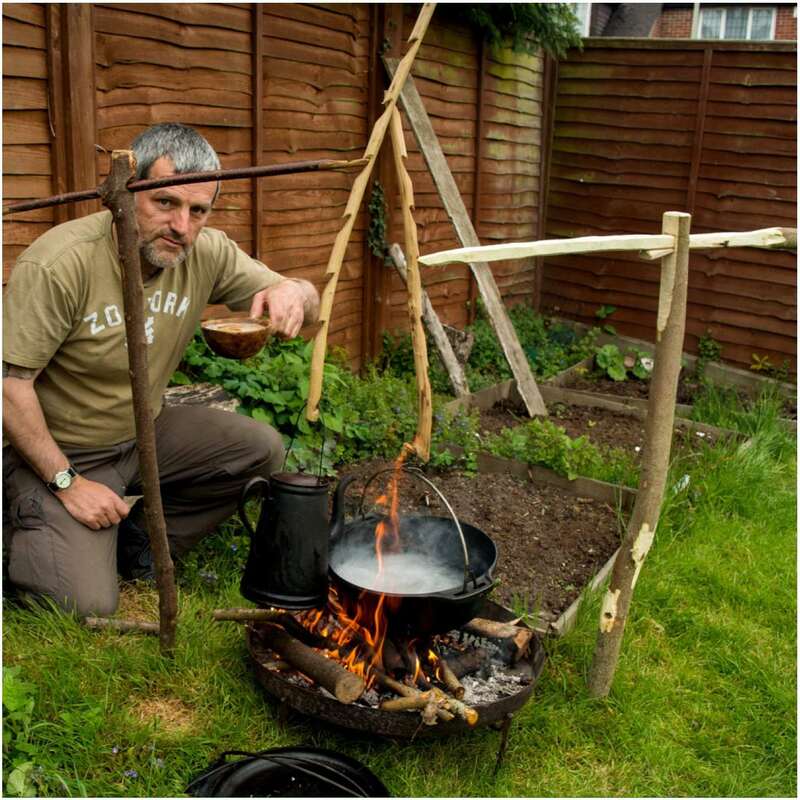 John wanted a dedicated area for his students to cook on without having to bend down too far. After a lot of discussion with his wife Caron we opted for a rectangular shape instead of a square. 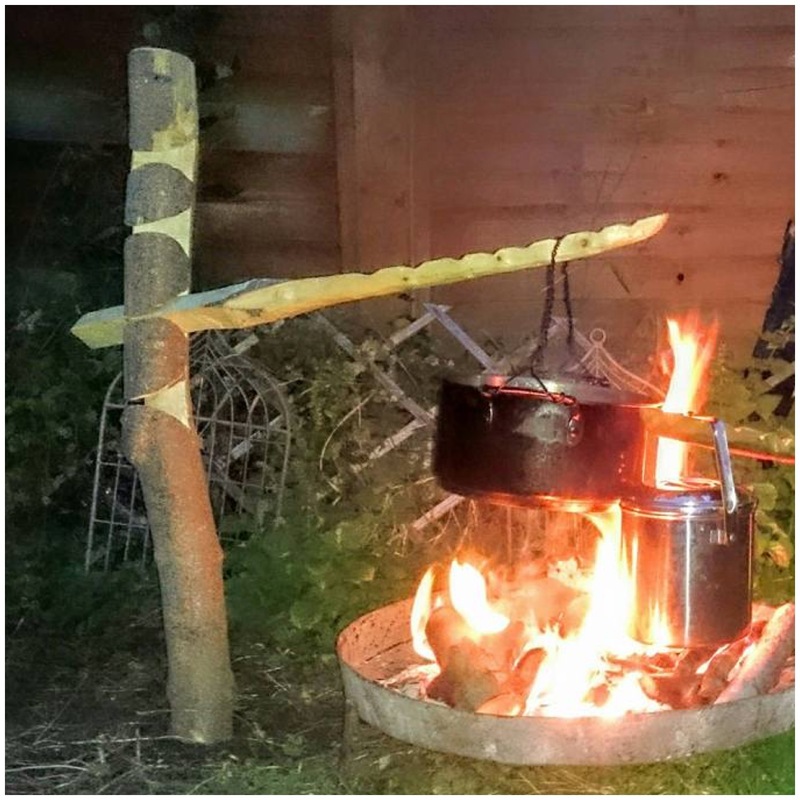 Caron argued that this shape would give a large cooking area but would be safer than a square, as the students would not have to stretch too far to reach the centre of the fire. This is an ideal construction for a fixed-base camp, with plenty of room to cook on and to sit around. 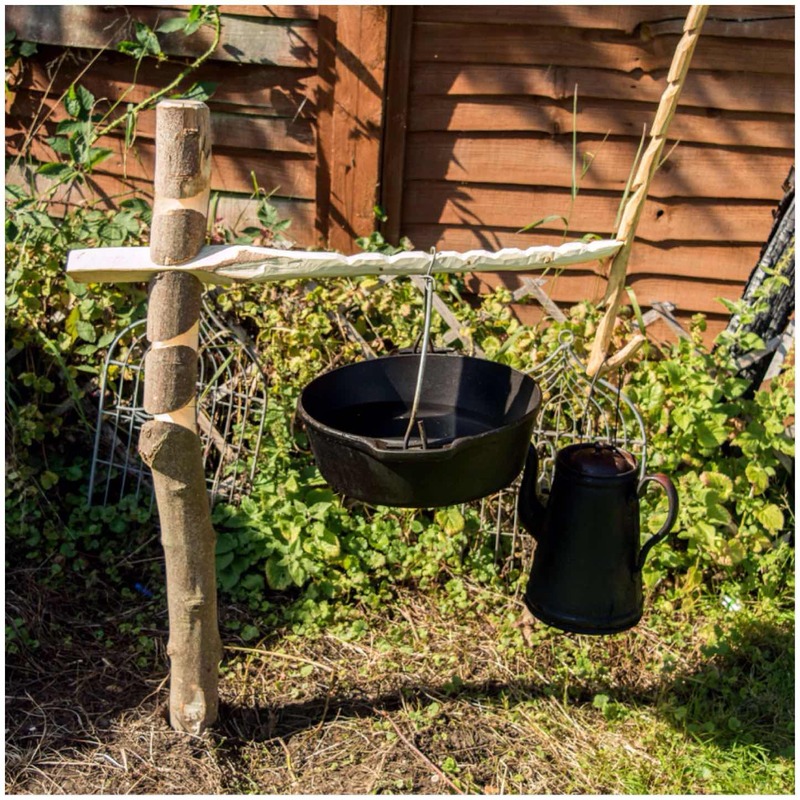 I love little wooden contraptions and these little collapsible pot hangers are ideal for the lightweight bushcrafter. They can be made in numerous different ways and are easily broken down to be stored inside your pot. 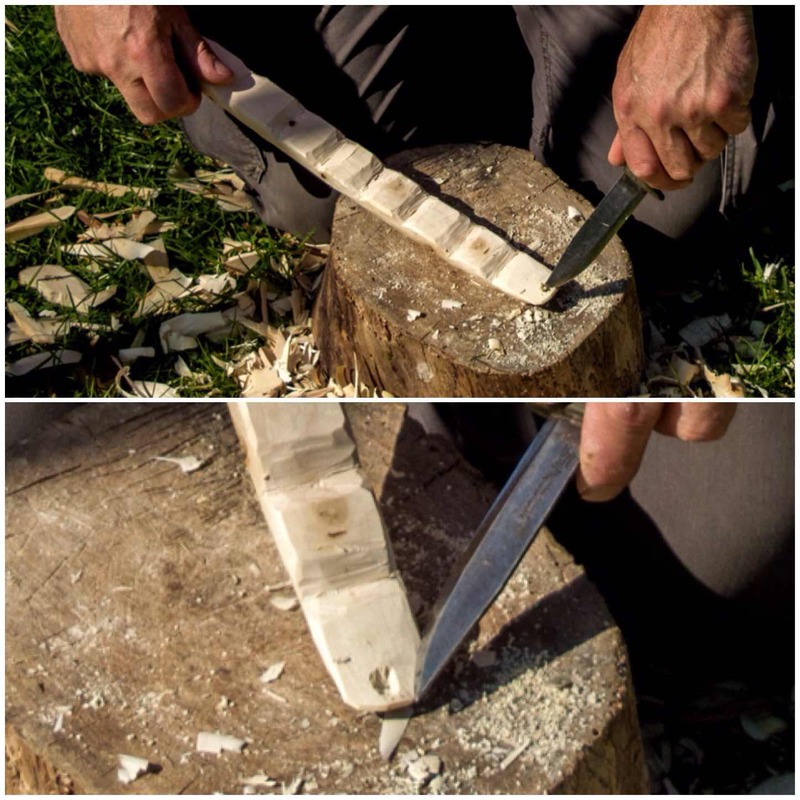 One of the things I like about carving them is that the joints that hold them together are generally simple but need to be carved perfectly if the hanger is to take the weight of a heavy pot without coming apart. 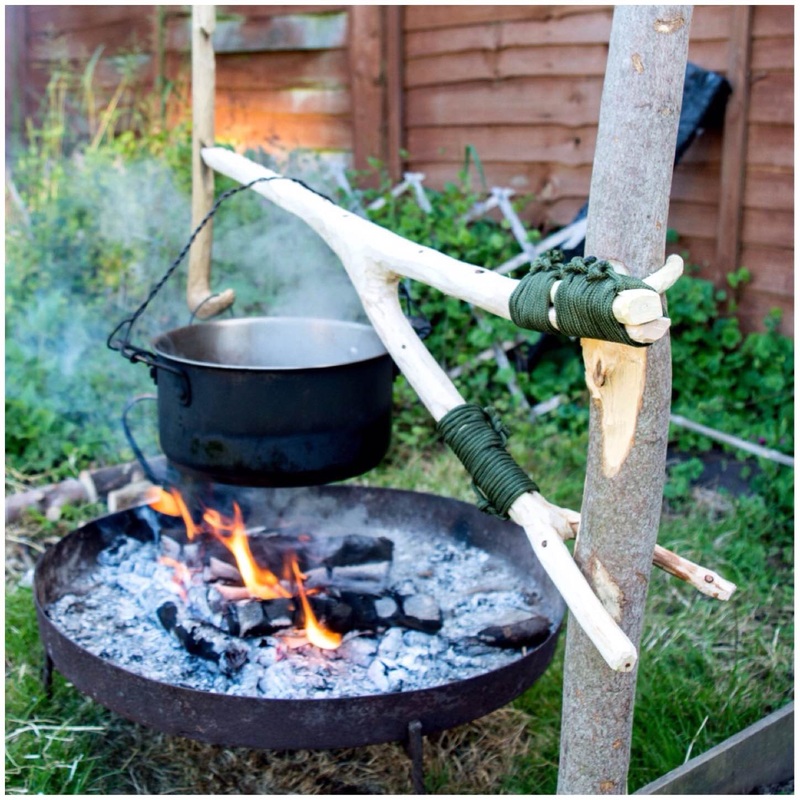 This is an excellent cooking rig for bushcraft beginners to learn. It has lots of different parts and requires a number of different knife cuts to produce the hanger and the hanging poles. I have heard this set up called many different names from Waygon or Waugan stick and Mors Kochanski refers to it as the Burtonsville rig. 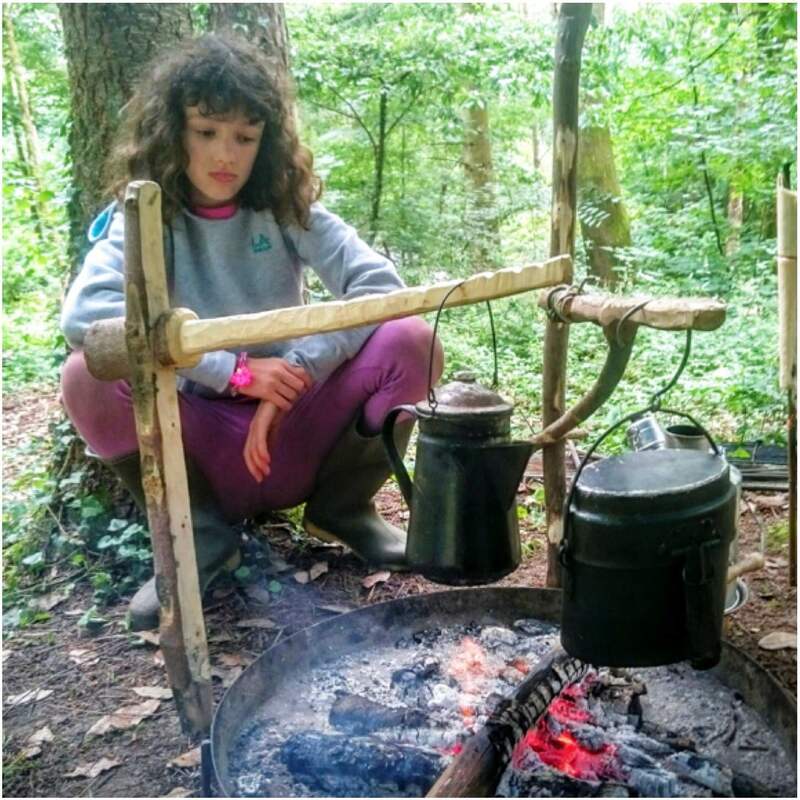 All have their own stories behind them however the common factor is that it a very easy set up and offers the bushcrafter a wide range of cooking heights. 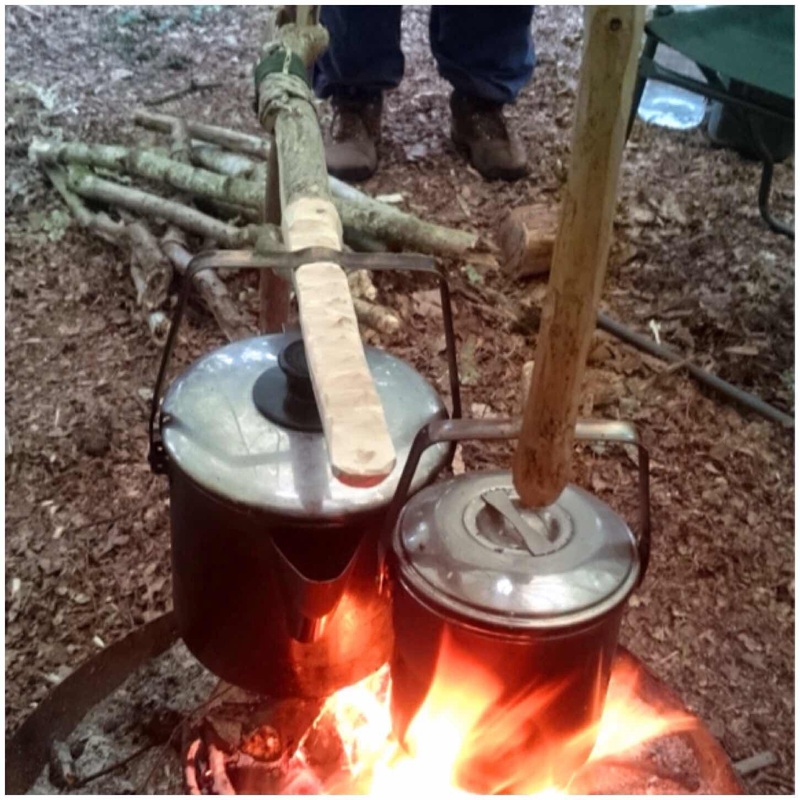 The Double French Windlass is a cracking cooking rig. 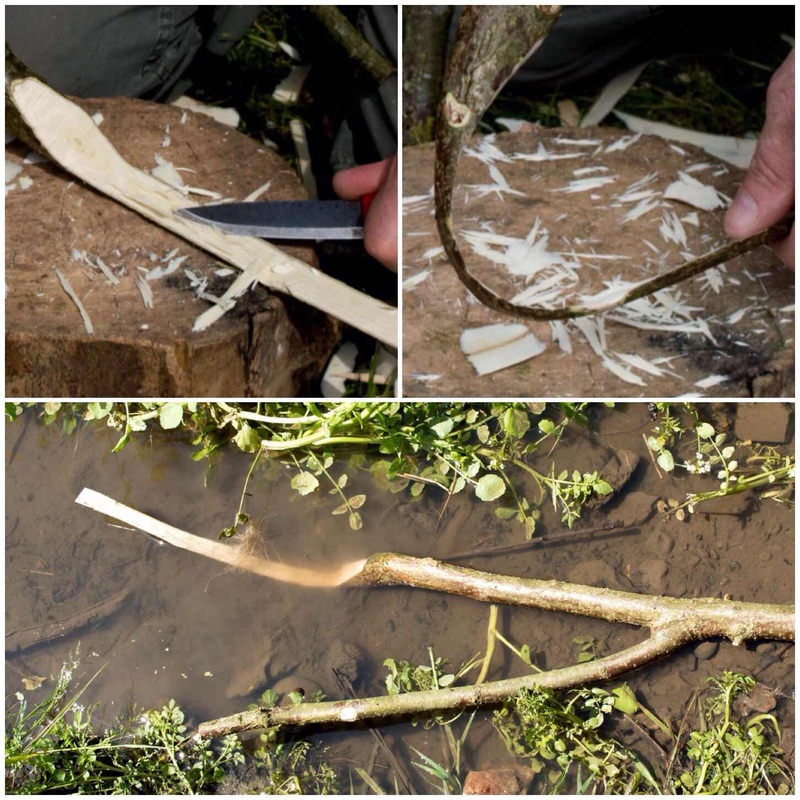 I was taught this by my friend Steve ‘Mesquite’ Harral at the Bushcraft UK Bushmoot a number of years ago. 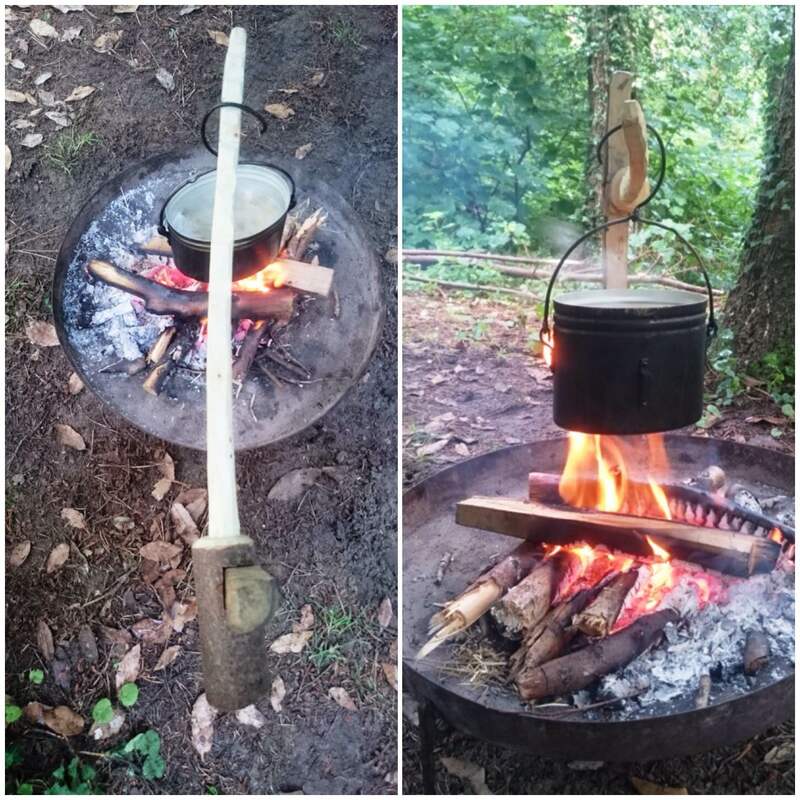 I used it at this year’s Bushmoot for two weeks and it allowed me to cook with a number of different pots at one time with the ability to have them all at different cooking heights. I read in the Wildwood Wisdom book of a type of adjustable crane first documented in the early 20th century by a Scout Master called Victor Aures. 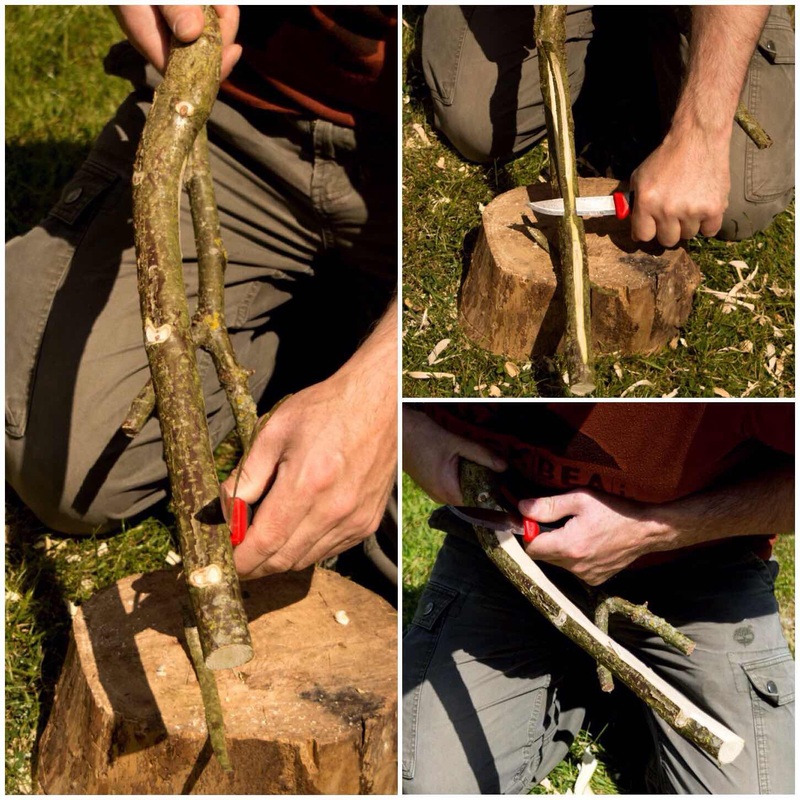 It is a simple device however it is reliant on finding a branch with a specific set of smaller branches off it. 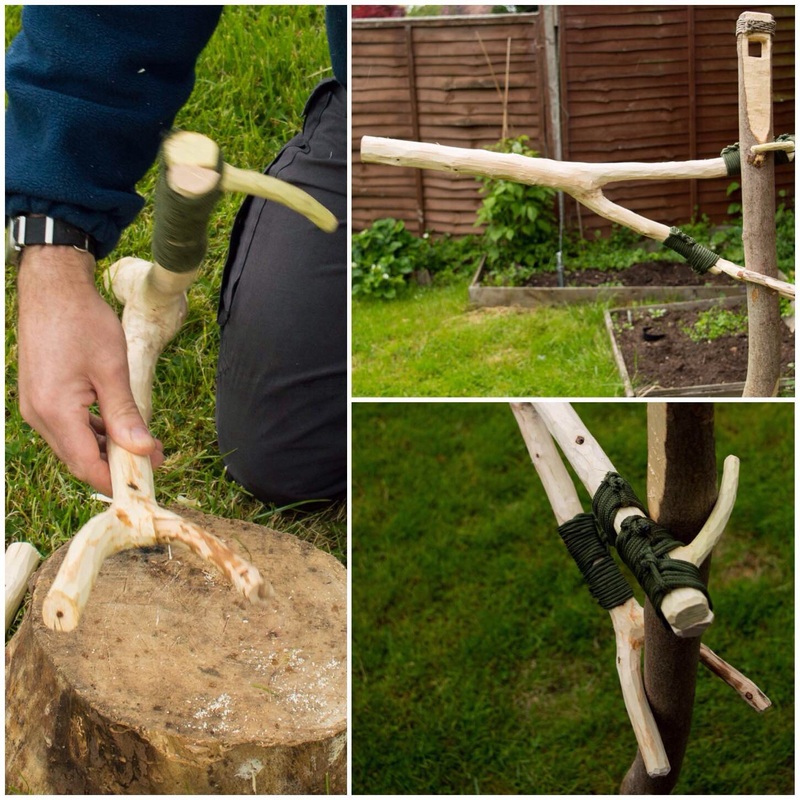 I discovered a variation on this crane a number of years ago that required only a single fork in the branch and after a bit of splitting and splicing you have a fully adjustable crane. 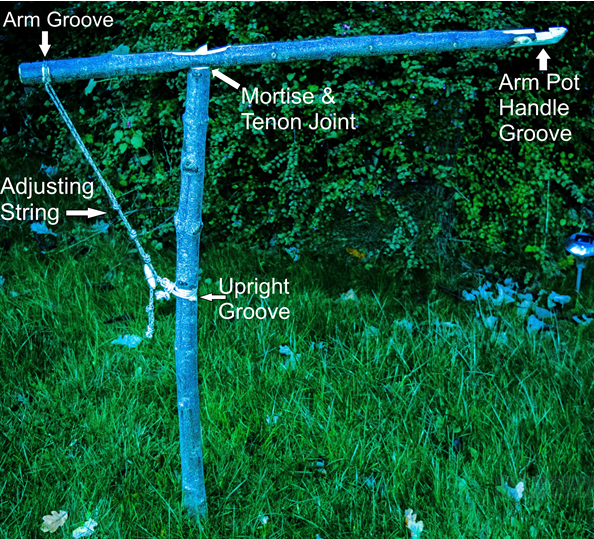 This variation on the Aures crane does not rely on splitting the wood but on the addition of other branches so that the whole thing hangs off your upright pole. 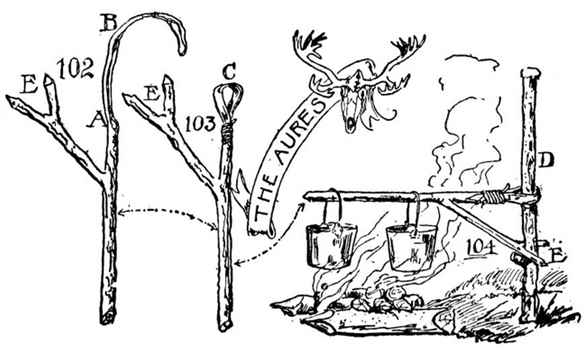 It is easy to find all the parts which is probably why this is the version of the Aures cranes I most commonly see around campfires. It took me a long time to find the perfect combination of branches for this crane. I have never seen another one before except as a drawing in the Wildwood Wisdom book. 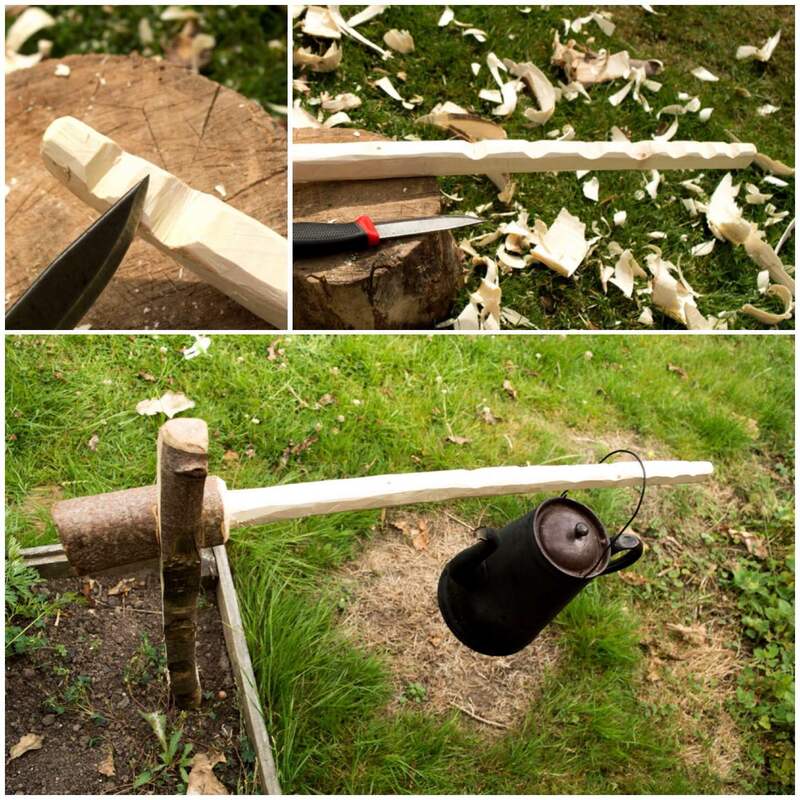 The hardest part in making this crane is the thinning of the wood to create the loop. It is a real challenge but also very enjoyable and satisfying. 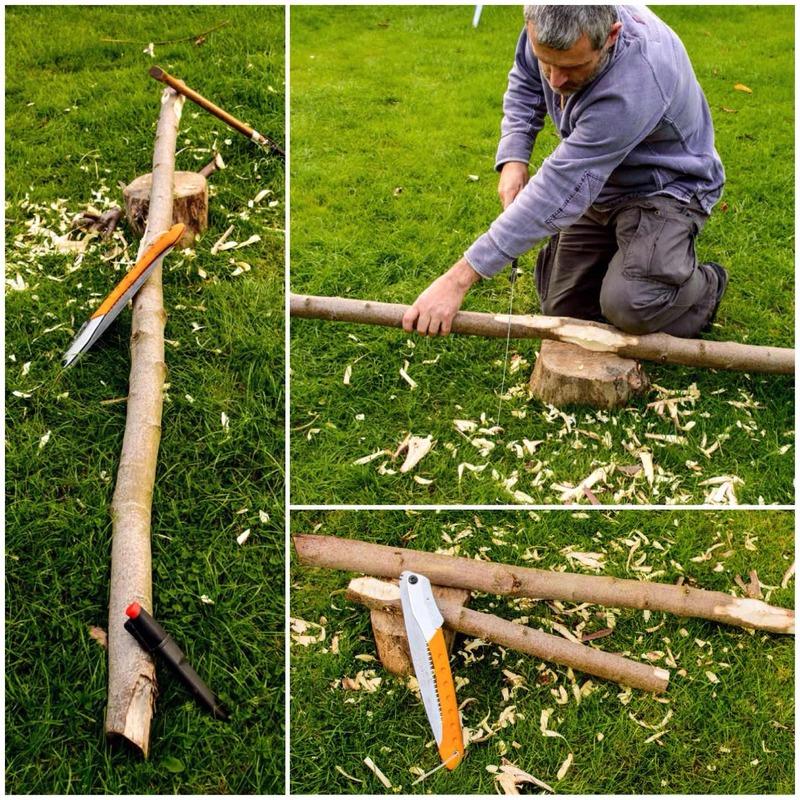 I really liked making these cranes and would encourage you to have a go at them if you like campfire projects. They are not for you if you prefer simply to put your pot on the fire, but if you like to tinker and experiment, have a go. 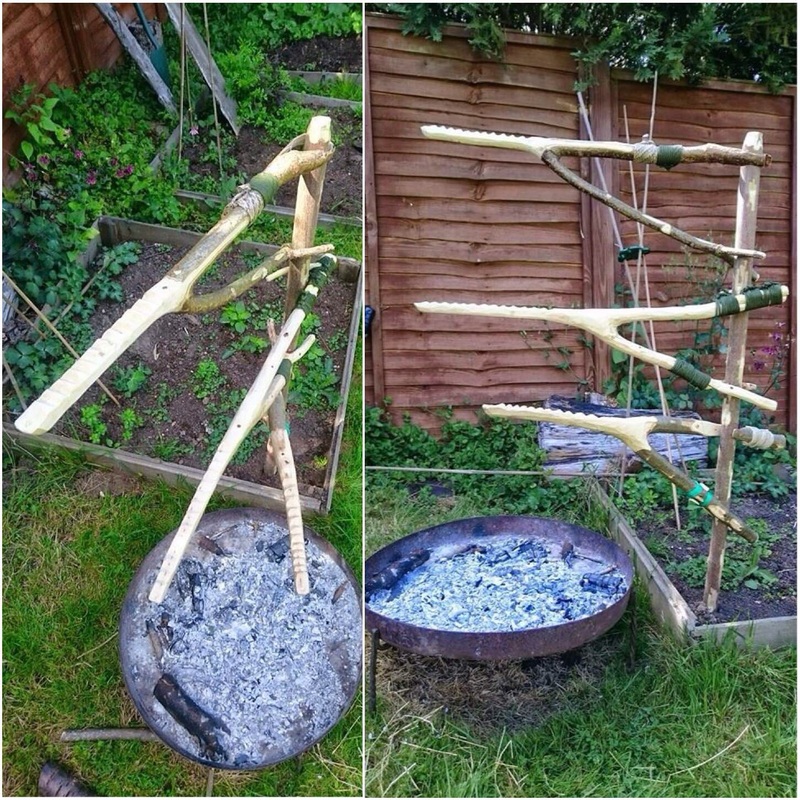 The idea for this crane came to me a number of years ago while making myself up a little squirrel cooker from some metal rods. I have cut the notch out using an auger in the past but nowadays I usually just use my knife. I like this set up as you can make your crane out of one pole. 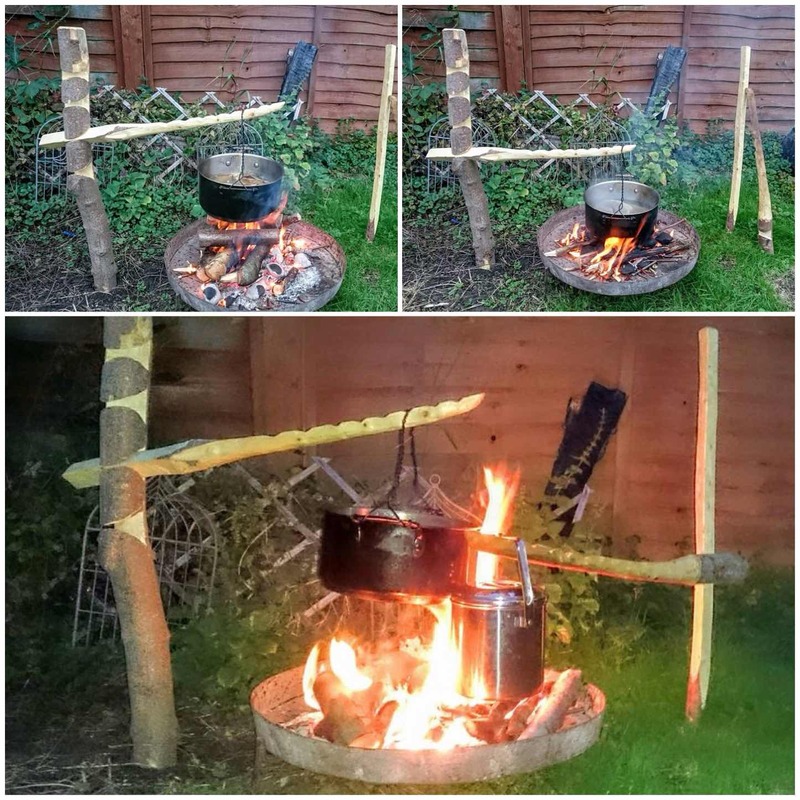 With the addition of an adjustable pot hanger you have a crane that offers a variety of cooking heights without having a bulky tripod set up over the fire. 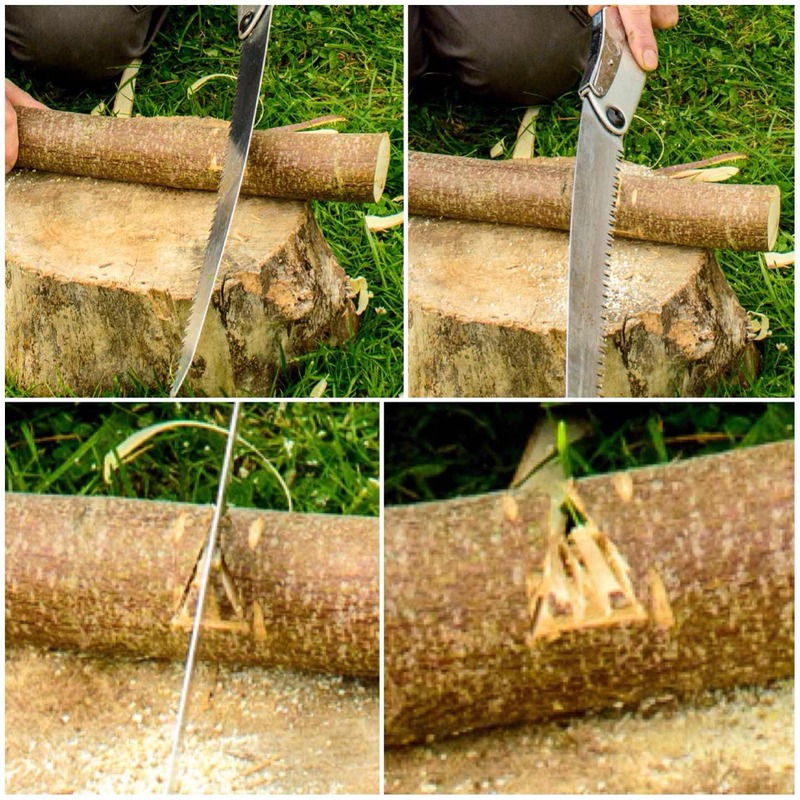 I got this idea from a Scouting page a number of years ago and it is very simple and quick to carve. The part that takes the longest to make is the adjustable pot hanger. I would recommend if you decide to experiment with making these cranes that you start with this one as the dovetail notch is so easy to cut out. Still sticking with the single pole theme, another easy crane to make is the Lap Joint crane. The main thing to remember is to make sure that the squared-off fit of the upright is consistent along its length with the notch in the arm. Once weight (eg a pot) is applied to the end of the arm, everything locks together. I have found that this crane works best when the pot is hung off the very end of the arm. I have experimented with hanging the pot half way along the arm only to find it all collapses. It is a good and simple crane to make – treat this one with respect, though. This is my all-time favourite crane. With the dovetail notch the arm cannot fall off (unlike the Lap Joint crane) and it offers a wide variety of heights to choose from when cooking. The arm is very easy to adjust even when there is a pot attached and will take you no more than an hour to carve. This one came about from an article I spotted in a Scouting site. Some of the Dutch Oven pans I use can be extremley heavy. This crane offers a number of different cooking heights and will not bend in the slightest even with the heaviest pot attached (well, the heaviest I have, at least). I have though learned to take the pot off the arm with this one before changing the height. This was the last crane I worked on last year and the one that is the most technical, I think. 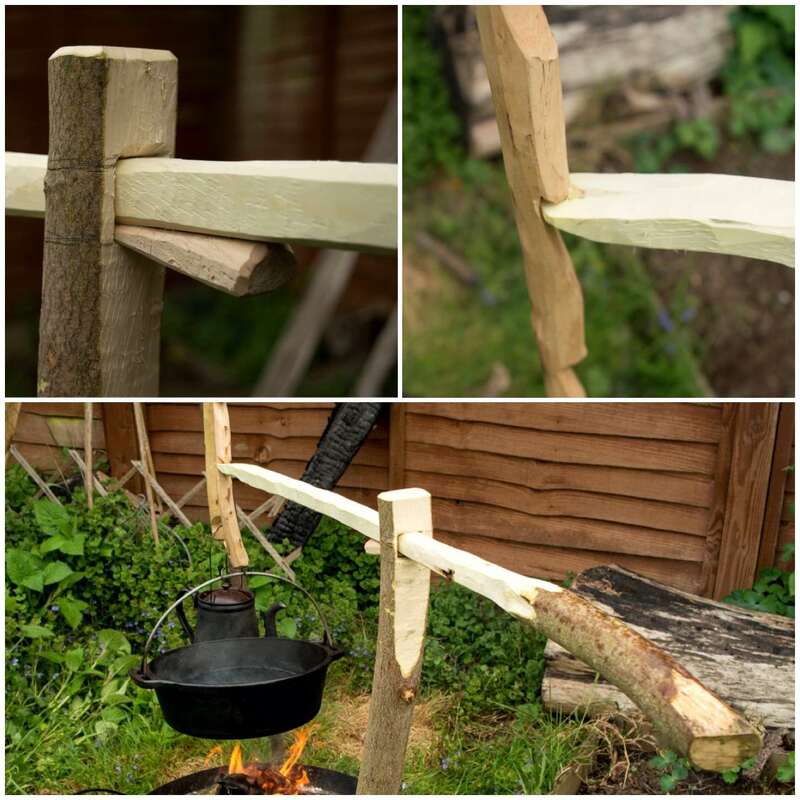 The joint is a simple tenon and mortice set up however there were a lot of angles to consider (I have discussed then in the article) and the string I used to adjust the height could possibly do with further development. It is however an excellent crane with lots of movement up and down and side to side. In time I hope to add a few more How To’s…. to this series as I find the whole subject of campfire contraptions so fascinating. 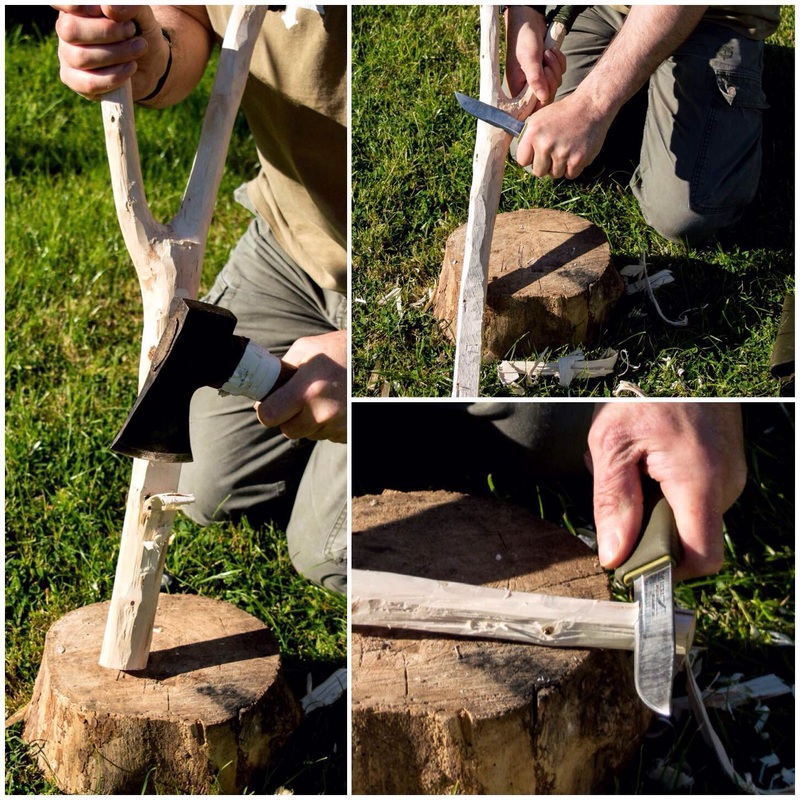 Let me introduce you to what I call the Mortise and Tenon Campfire Crane. This is a crane I made up at the the BCUK Bushmoot this Summer. The idea came about as usual in a discussion around the fire with my good friends Charlie Brookes and Ian Woodham. 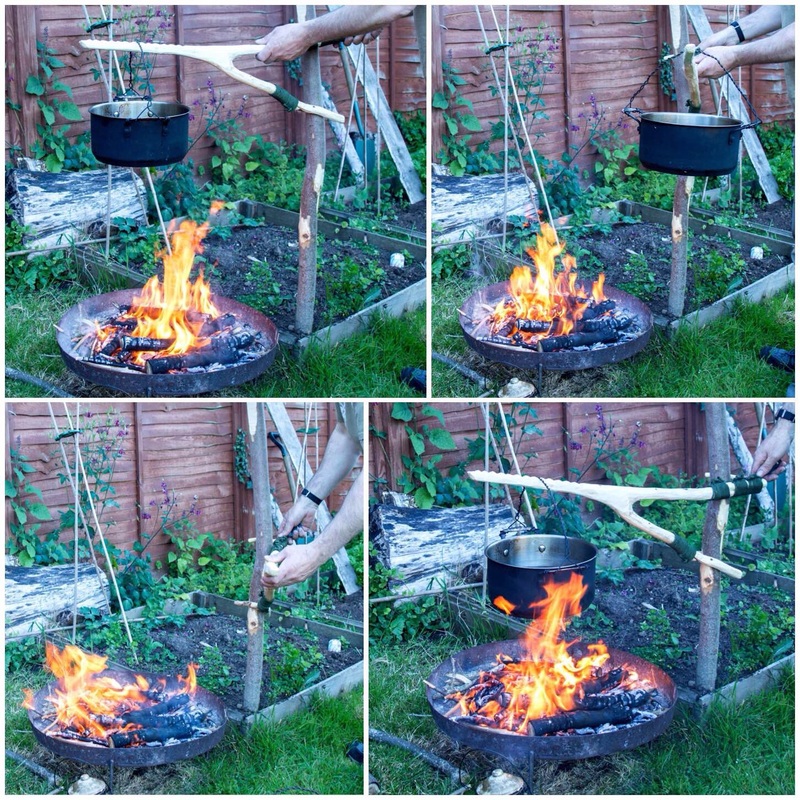 As you can see the arm of the crane can be set high or low (and ranges in between) and if set up correctly the upright can be easily rotated to swing your pot away from the fire. 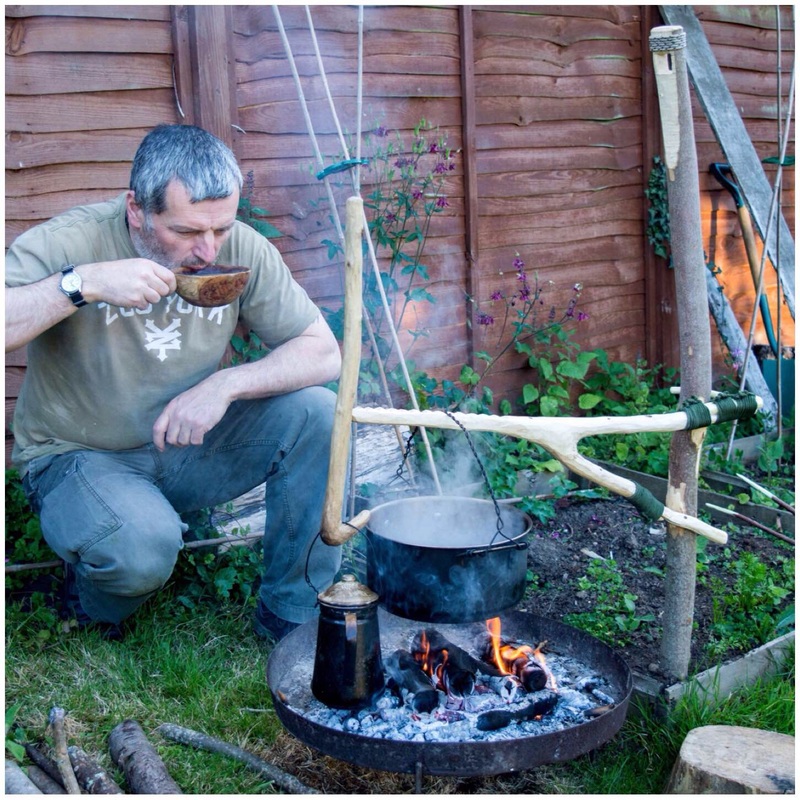 I would classify this one as more Pioneering than my usual constructions as it relies on some string to work. 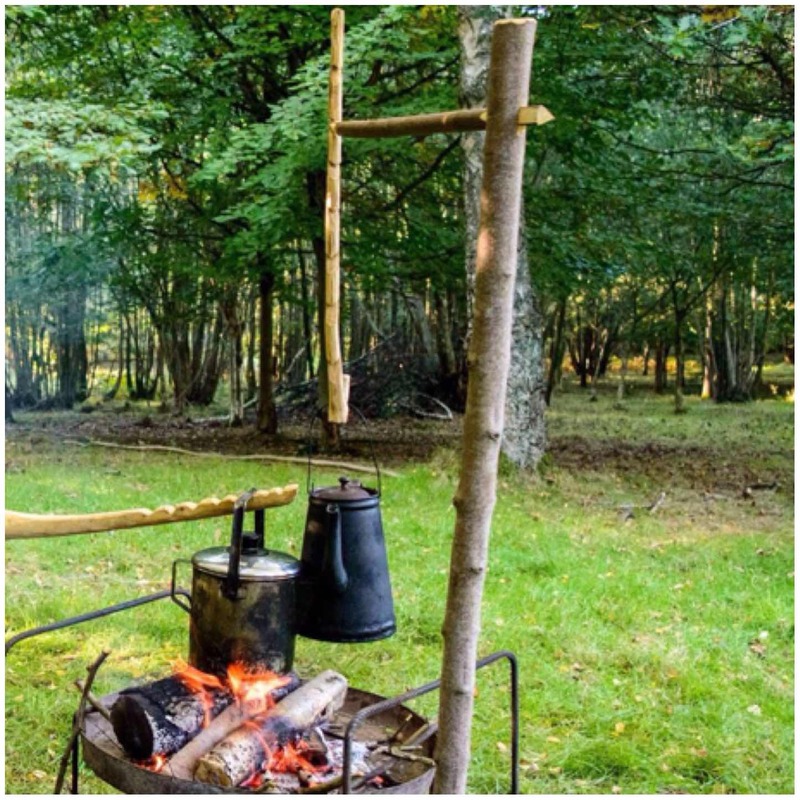 It is one for the long term camp however if you were on an overnighter with a couple of hours spare it would make a good project for an evening. I will be describing the construction of the crane as I go through the post however I thought it would be helpful to have a completed picture of the crane marked up with the relevant work areas for you. Please refer back to this overview at any stage. 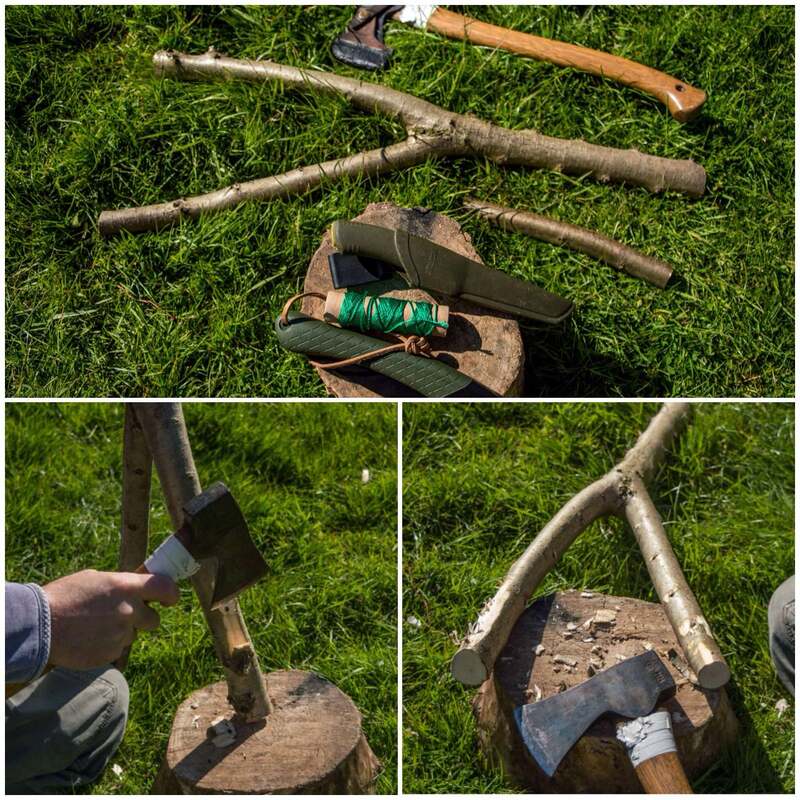 My tools for the job included my knife, a small saw and and axe but you may find having a pen or pencil to hand will be useful. 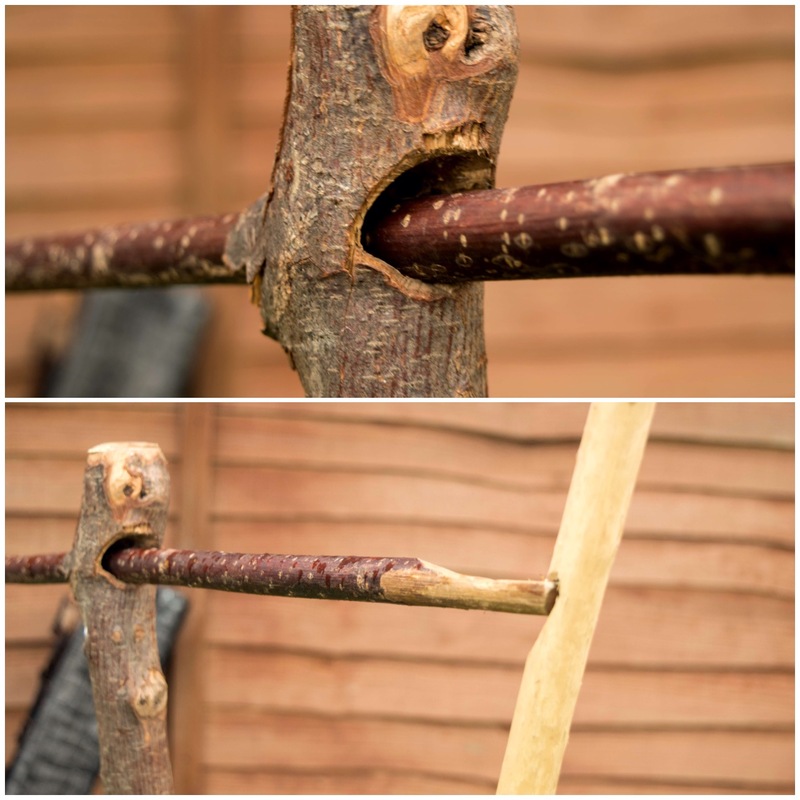 I took a rod of Sycamore (fairly well seasoned) and sawed it in two. In the picture you can see I have left the thicker end longer than the thinner end. 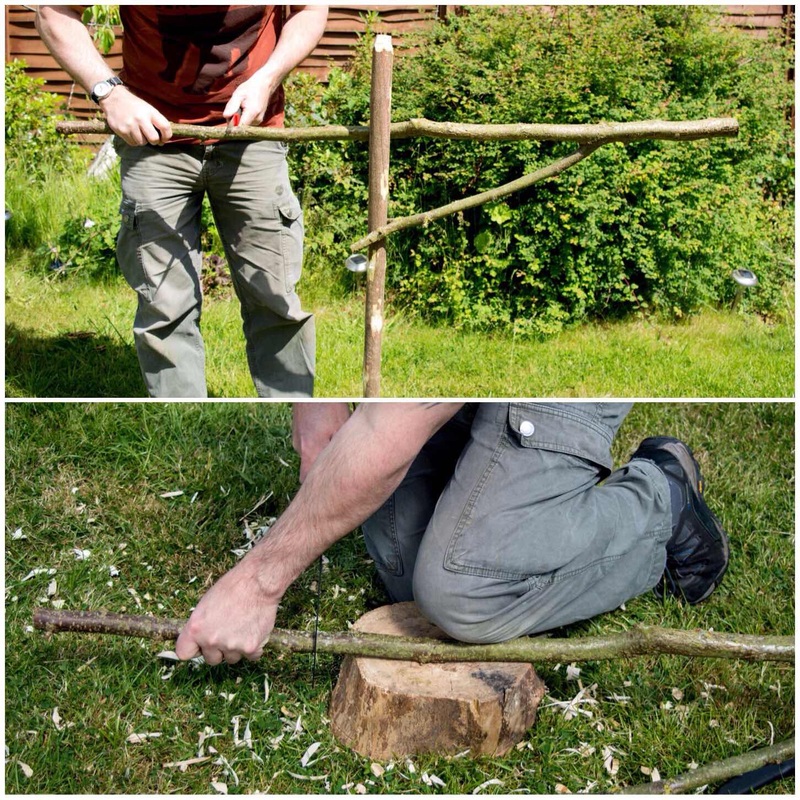 The thicker pole will become the upright and the thinner pole will become the arm. On the thinner end of the thick pole that was to be the upright I marked out the shape of the Tenon tongue and then cut two stop cuts into the side of the pole. The stop cuts are put in to so that when I batton the waste wood off the split does not run on down the upright. I used my knife to batton off the waste wood (make sure your knife blade is at 90 degrees to your body when you do this). Once I had the Tenon tongue shape split out I carved one side of it into a curve. This is important to allow the arm of the crane to be raised up and down. To finish the upright I axed out a point at the bottom and about half way down it I carved a small wedge-shaped recess. This wedge-shaped recess needs to be on the opposite side of the curve to the Tenon tongue. The recess does not need to be that deep, just enough to allow some string to catch in it. 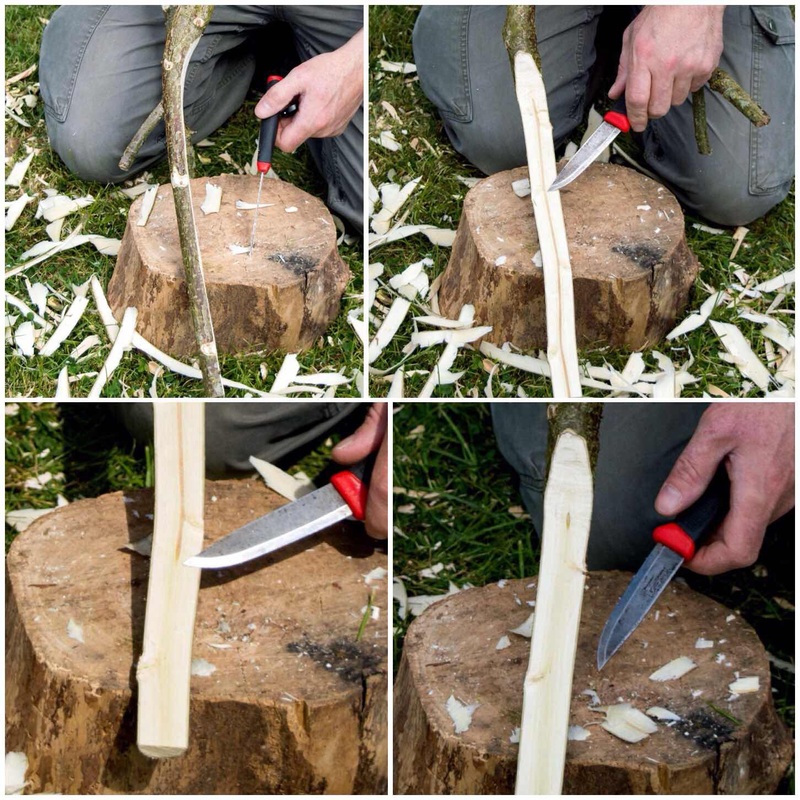 About a third of the way along from the thicker end of the arm flatten the wood with your knife on opposite sides. This gives you a decent working surface to carve out your Mortise hole. In the bottom left picture you can see how I used the top of the upright to help me gauge how big to make the Mortise hole. 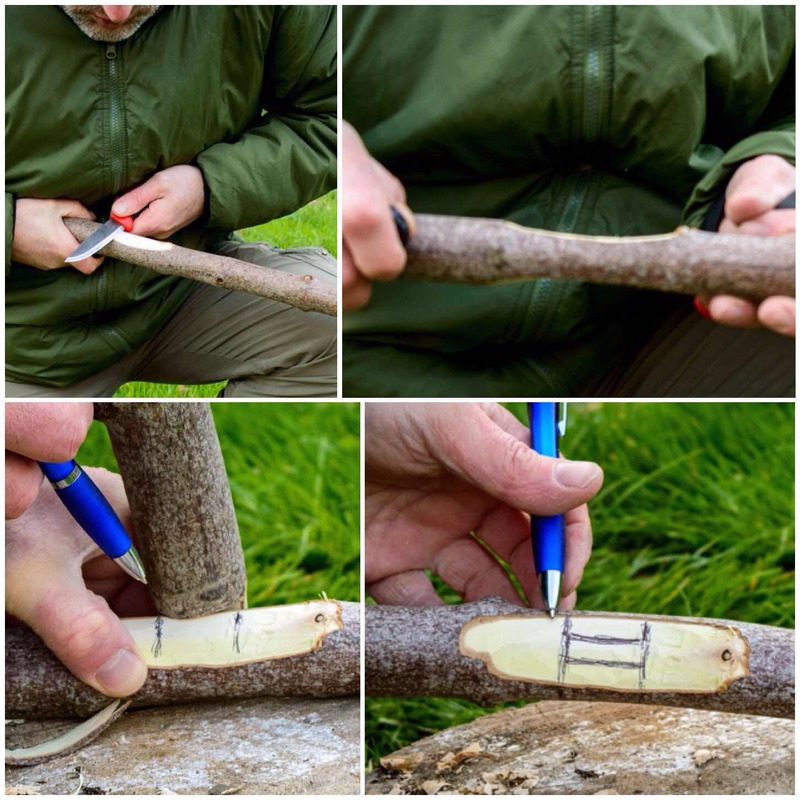 Mark out your Mortise hole with a pen or pencil (mark out both sides of the arm). 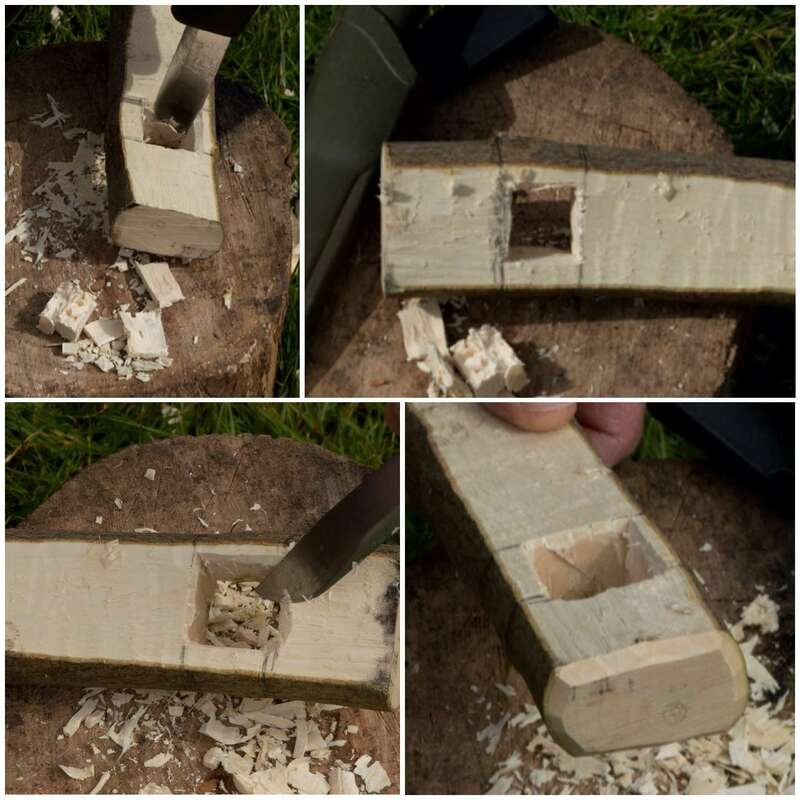 I used my knife and a piece of waste wood as a batton to cut out the Mortise hole. 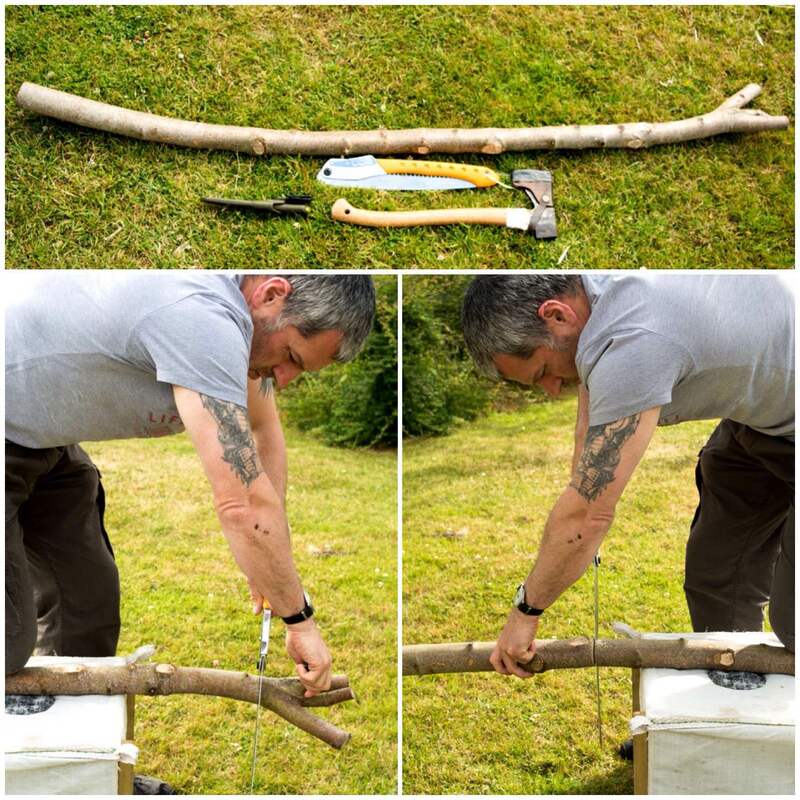 I took my time here so I would not split the wood along the length of the arm. Once I got about half way down the depth of the Mortise hole I started on the other side. As I use the tip of my knife for this work I always ensure the work piece is secured on a flat surface. I have seen the after effects of a knife going through someone’s hand and it is not a pretty sight I can assure you. Soon I had my Mortise hole cut through and tidied up. As I did not want to make the Mortise hole too large I tested out the Tenon tongue in it and trimmed the tongue down slightly so that it would fit in the Mortise hole easily. The Tenon tongue when fitted should sit slightly proud. You will probably find you will make lots of little adjustments here as you test the action of your crane at this stage. To finish the arm off I carved a groove near the thick end of the arm (for the string to grip), chamfered the thick end to tidy it up and cut out a groove at the thin end of the arm for attaching a pot handle (I will show this in detail in a further picture). I spent a long time working out a way of making the arm fully adjustable with just the usual items in my rucksack. 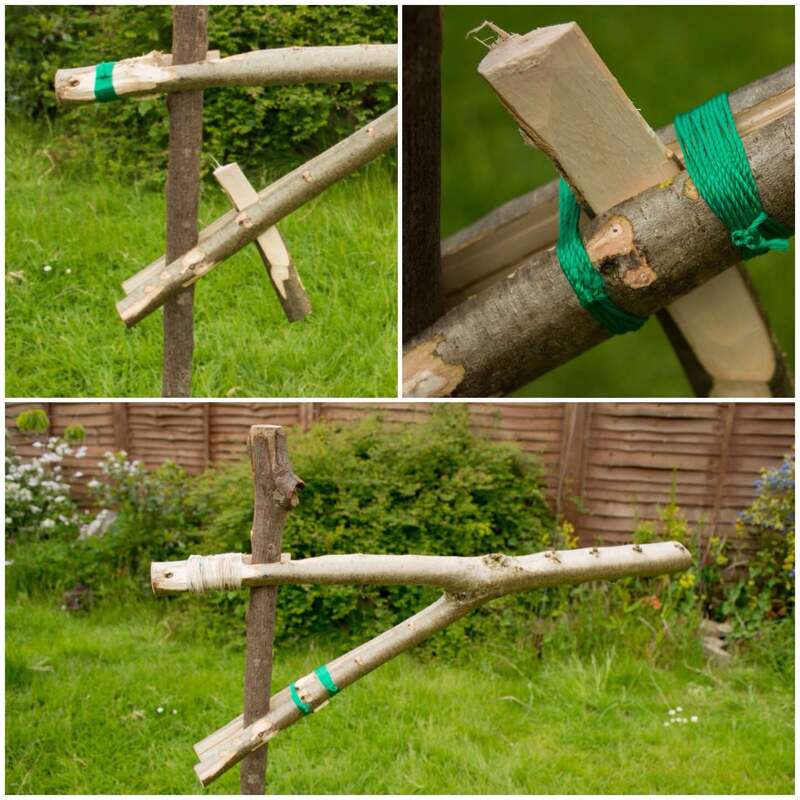 After discussing this with Ian and Charlie I opted for a simple system with string and a wooden toggle. 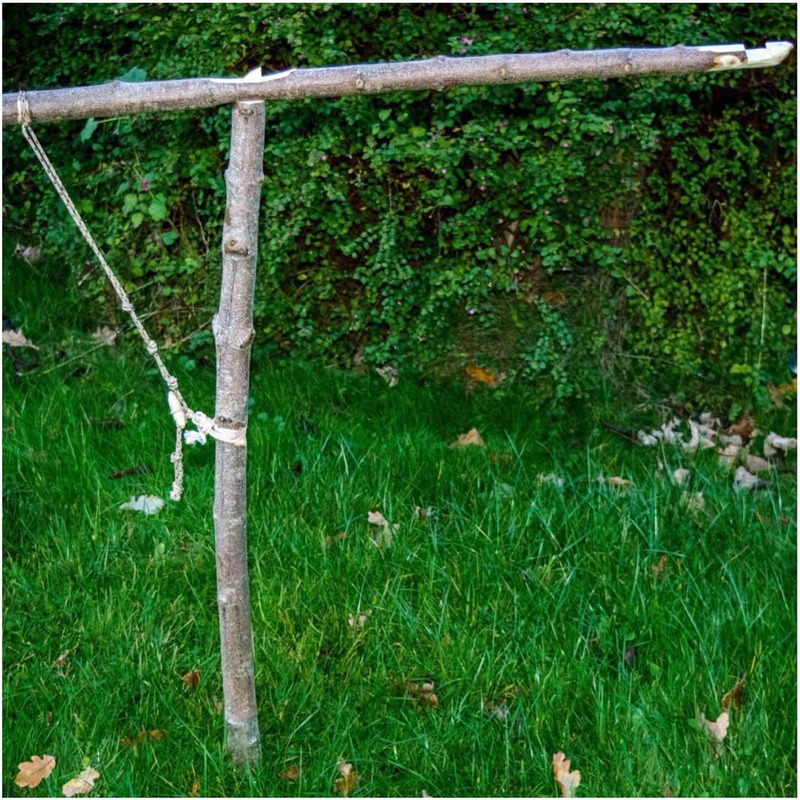 Below you can see that the upright and the arm are connected by string and a toggle on the left hand side. I tied off some doubled-up string to the arm groove and knotted it along its length with some simple overhand knots. This produced lots of little loops the toggle could fit into. I attached a toggle to the upright groove and inserted the toggle into one of the loops in the string from the arm. Depending on what loop I put the toggle into I could adjust the height of any pot hanging off the other end of the arm. The groove for the pot handle I made with a backstop and a slightly angled forward section. 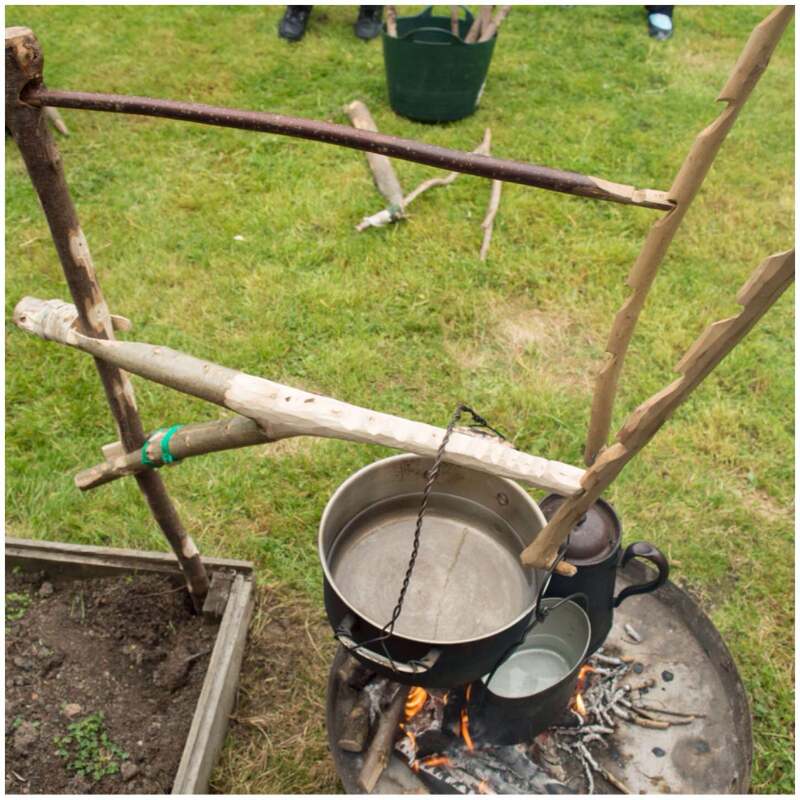 This shape allows the pot to remain secure when the arm is either raised or lowered. To insert the upright I had a separate pole to act as a pile driver. I hammered this into the ground first and then inserted the upright into the hole I’d created. 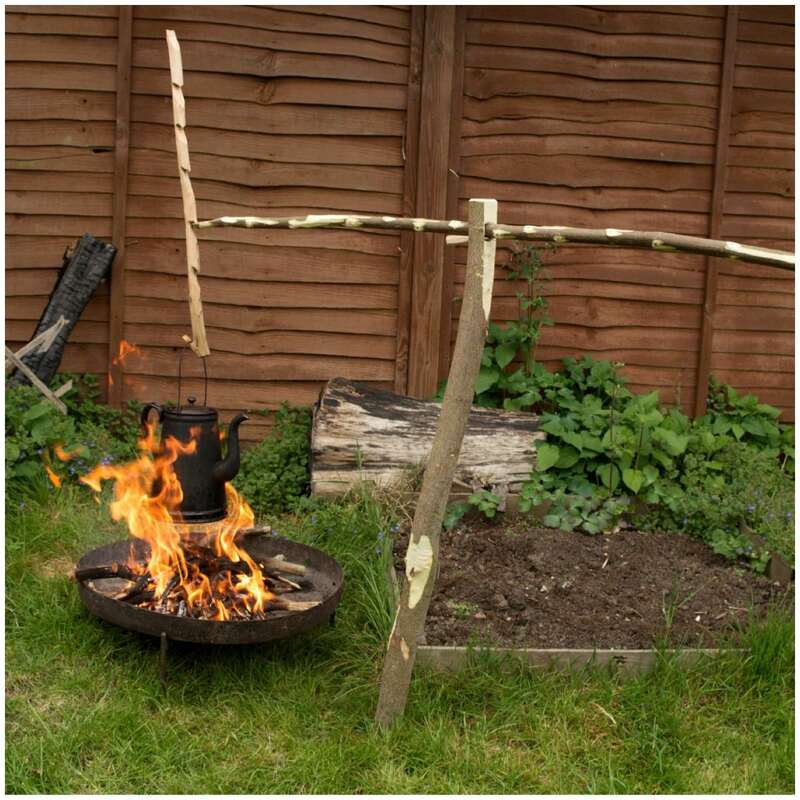 The upright can then be rotated quite easily to move your pot off the fire. I found that I could pour water from the kettle while it was still attached to the arm as the handle sat snugly in the angled section of the pot handle groove. I like this crane for the challenges it set me and the fact that I could overcome them with just the kit I would normally carry. I plan to re-visit the string set up as there must be a simpler method to keep the arm securley attached while giving me the ability to adjust its height. 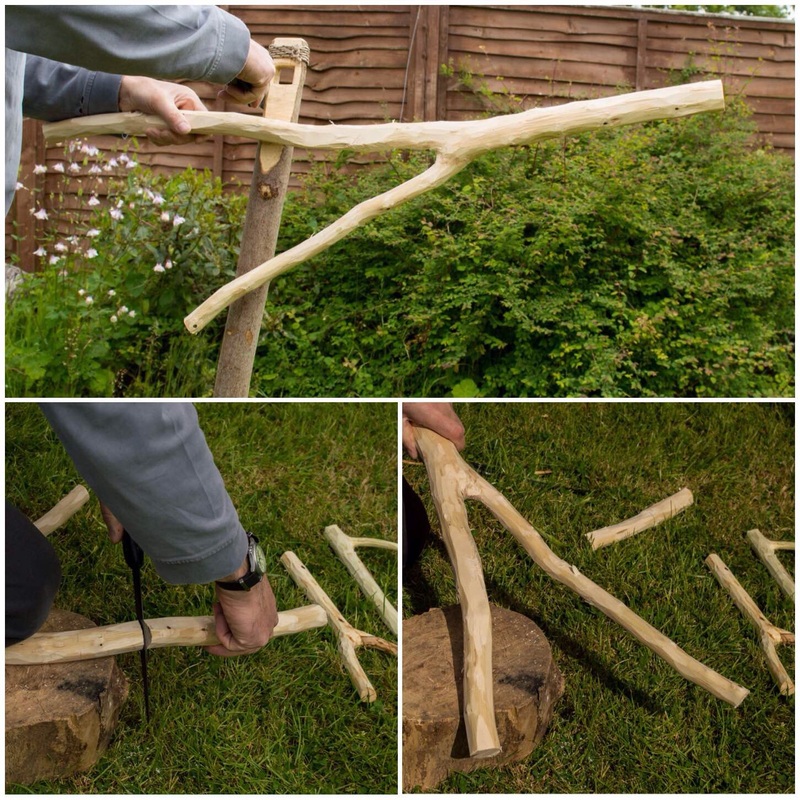 Feel free to suggest an alternative method for this but remember it needs to be created with what you would normally expect to carry in your rucksack or about your person while out in the woods. This will be (for the moment at least) the last How To…. 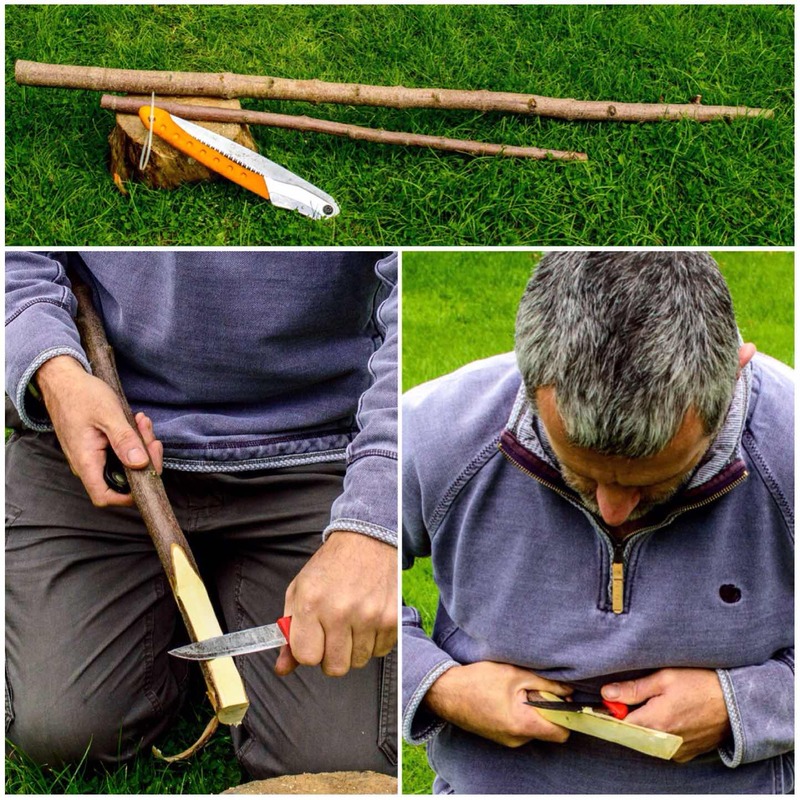 on building campfire cranes however I have really enjoyed exploring this very diverse and little documented area of Bushcraft. My ongoing quest to learn all I can about campfire cranes has brought me to this Heavy Duty Crane (just something I have made up to describe it). This crane works on the same principle of the Simple Dovetail Campfire Crane I documented in a previous post. 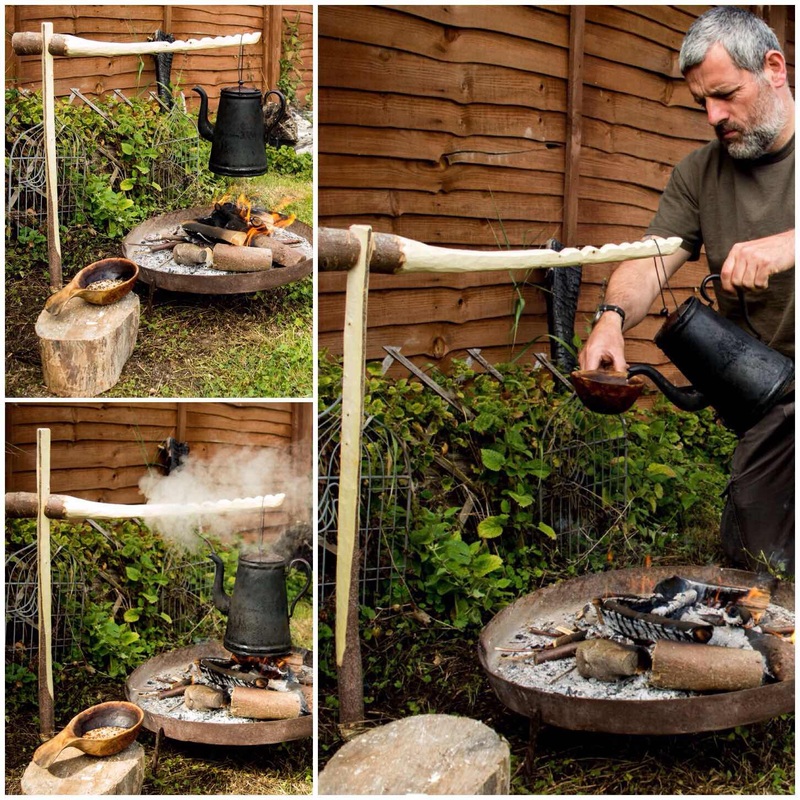 The main differences are in relation to size and how you adjust the height of the pot above the flames. I see this crane more for the long term camp due to its size. 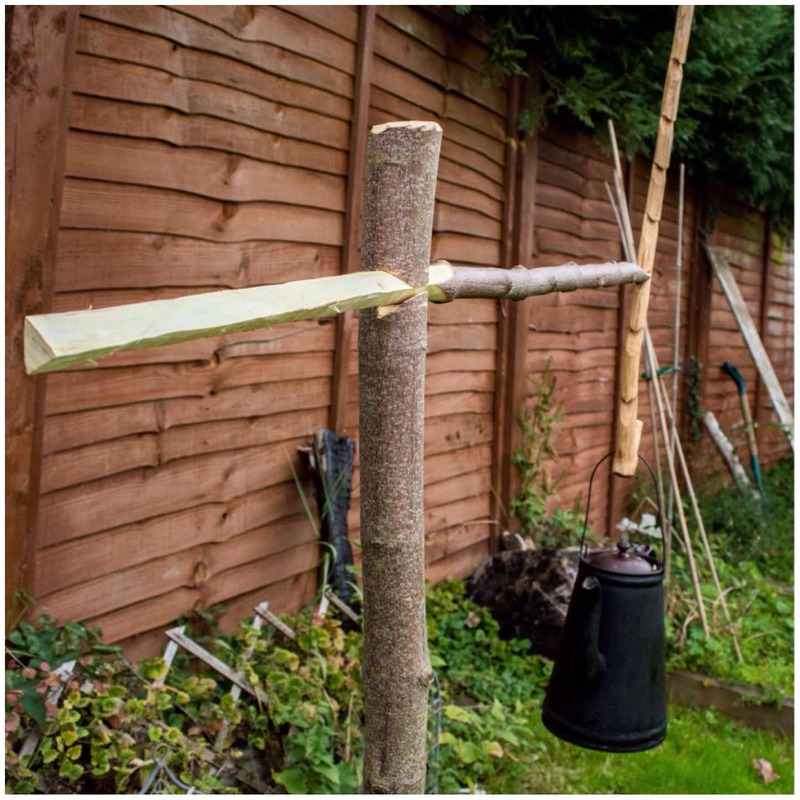 I constructed the crane using just an axe, saw and knife. 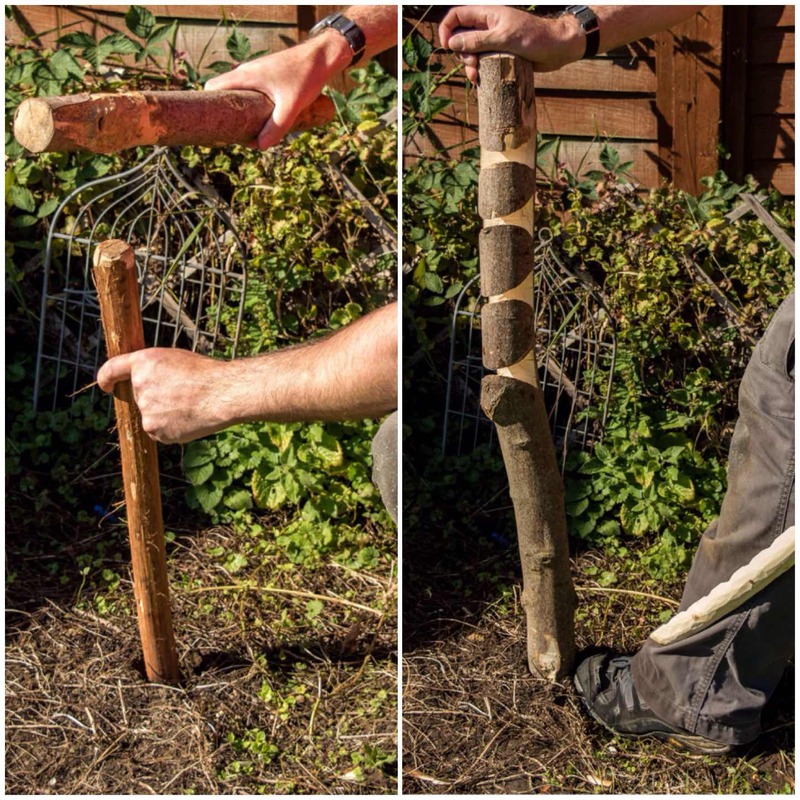 I chose a pole that had been cut down a number of months ago (sycamore wood) so it was fairly well seasoned (the girth of the pole was just big enough so that I could not close my fingers around it). 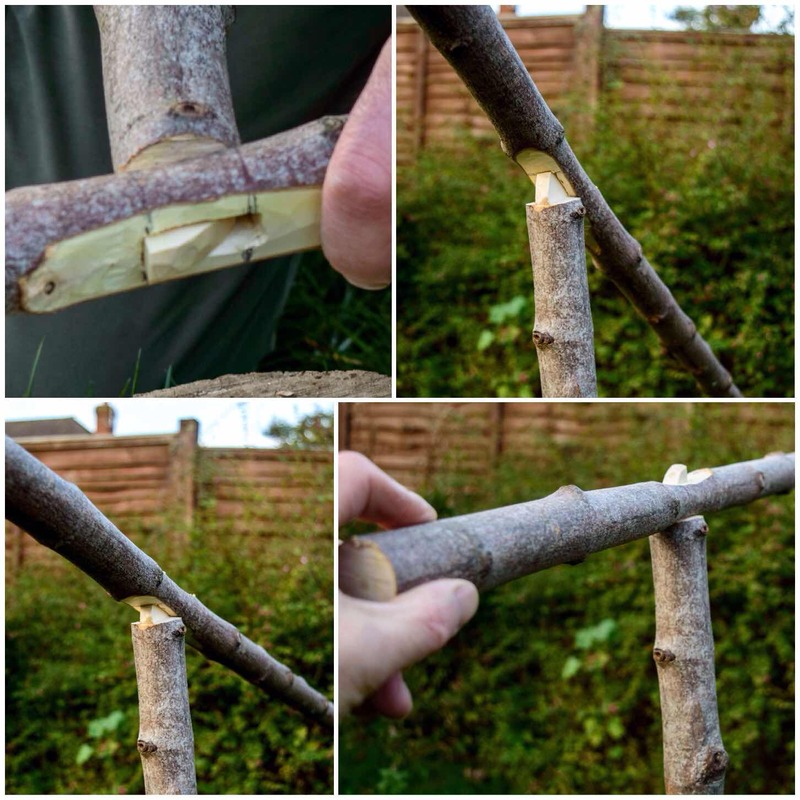 Green wood would work well enough for the short term however as the wood dried out you may find the dovetail joints you create would loosen slightly. 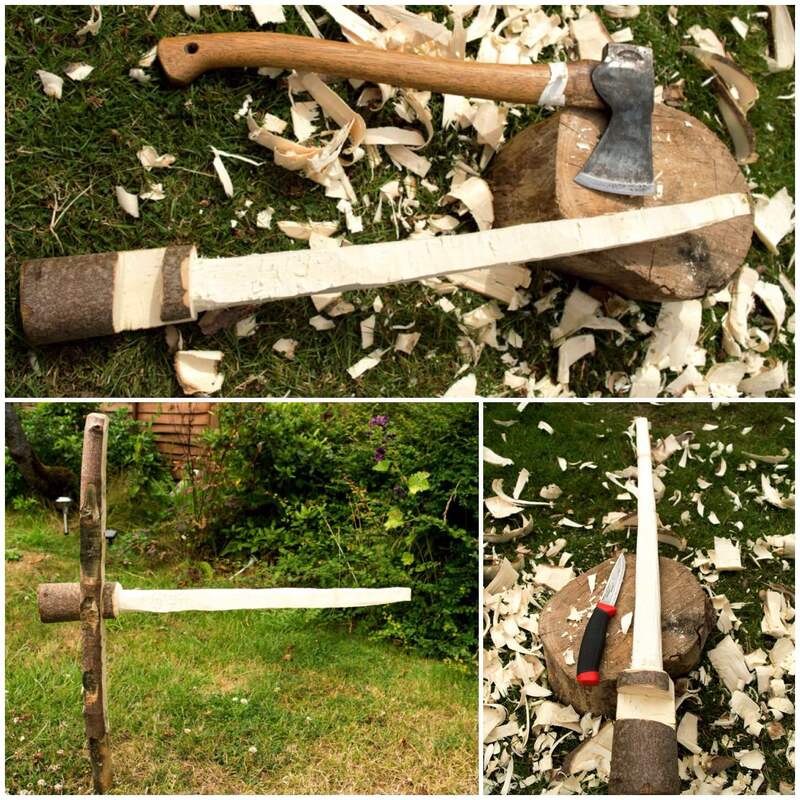 To begin with I sawed the pole into two pieces. 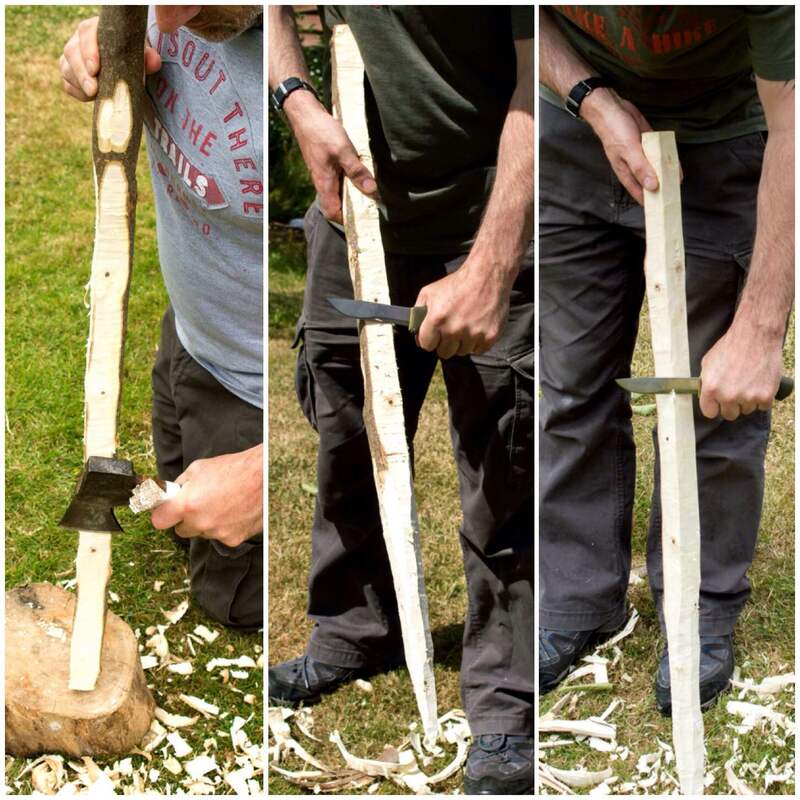 The cut was about a third of the way along the length from the tip (the thin end) of the pole – this would become the arm. The bottom two thirds of the pole (the thicker end) would become the upright. 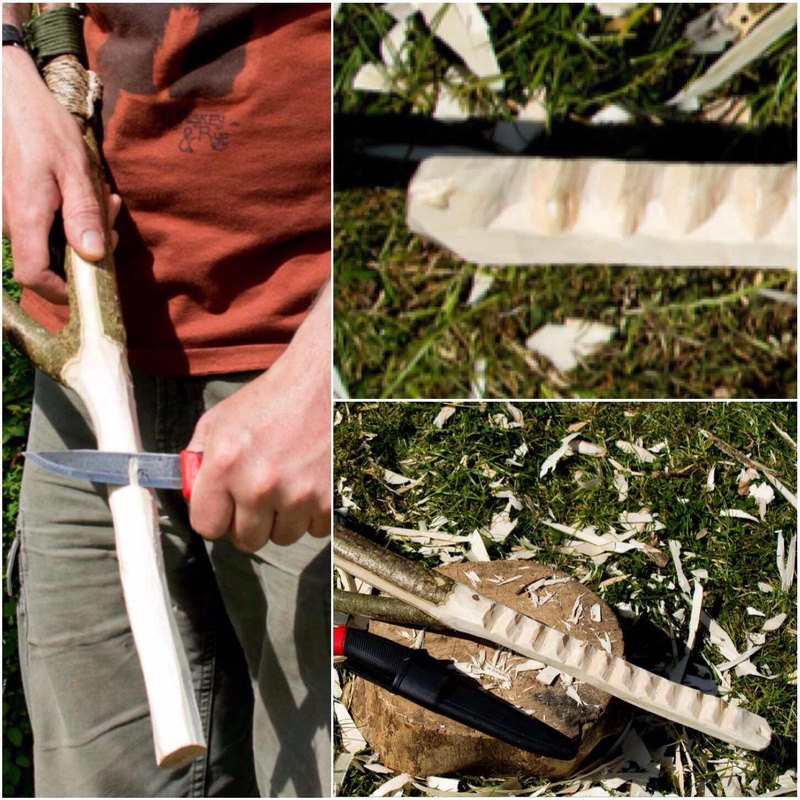 Using my axe and knife I carved the thicker end of the arm piece into a triangular shape. I took my time over this to ensure all the sides were as even as possible (carpenters measures with my eye). This would form the ‘male’ section of the dovetail joint on the crane. 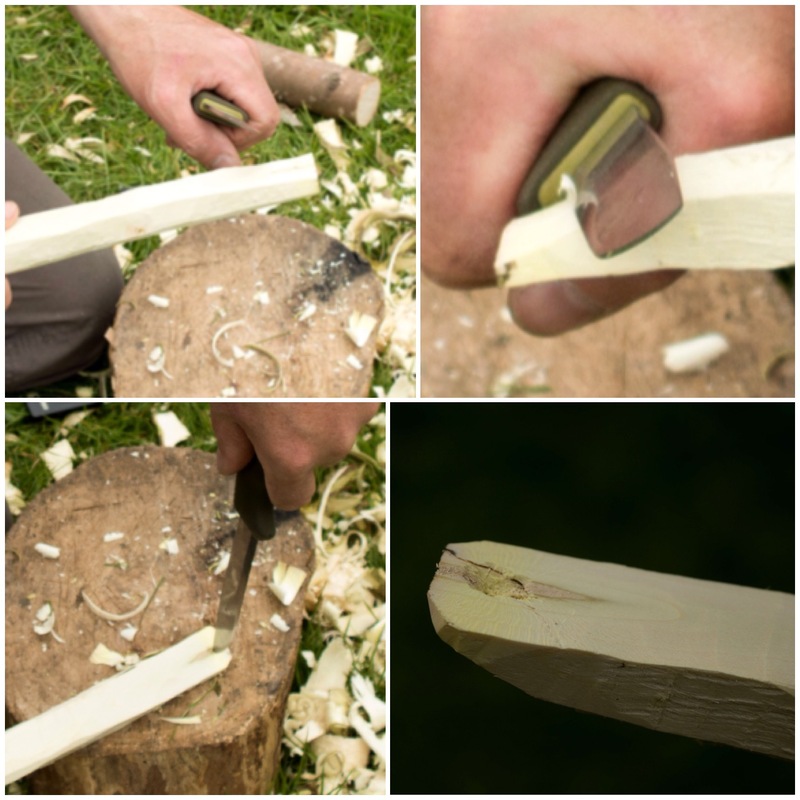 As you saw in the first picture in the post the upright has a number of female dovetail cuts carved into it. Make as many as you see fit however due to the length I had I opted for four. To help me in carving the female notches on the upright I used the triangular section on the arm as a guide. 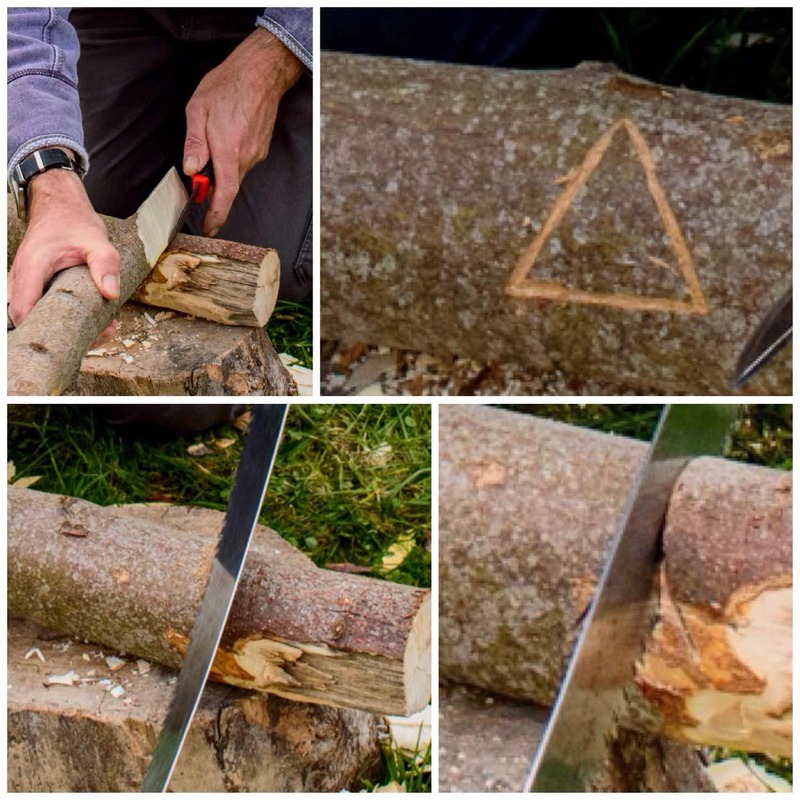 I marked out two triangles on either side of the upright making them fractionally smaller than the arm triangle (remember you can always take wood off – it is harder to put it back on again). I also off-set the triangles slightly so that the tip of the arm would be pointed slightly upwards when it was inserted (you do not need to do this if your arm has a bend in it). Joining the tips of the two triangles I scored a guide line for my saw. Once that was done I made a cut with my saw on each side of the triangles and a couple in the middle. 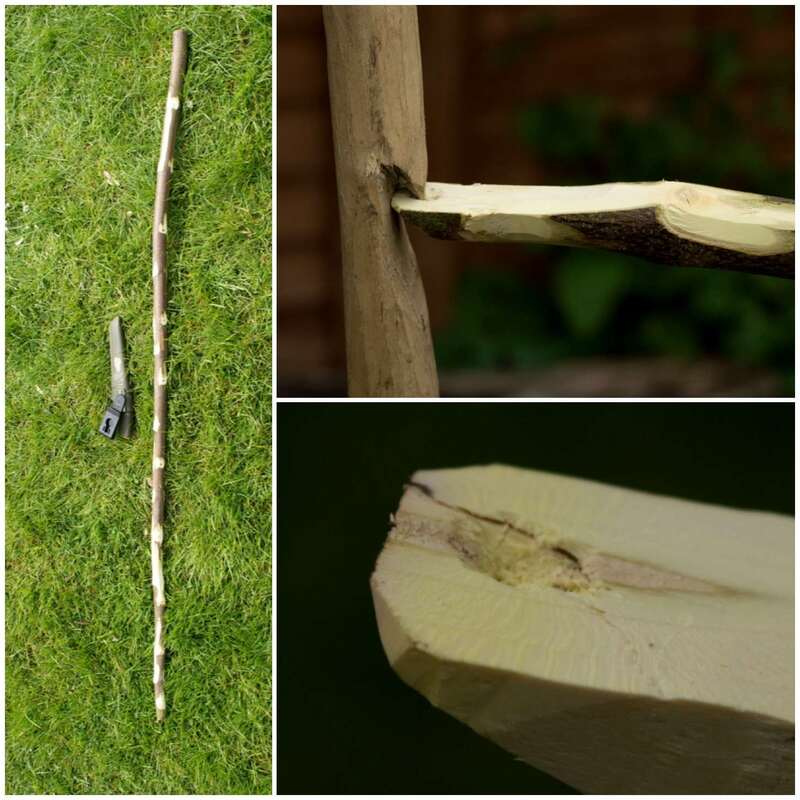 I used my knife and a piece of wood to batton (hitting the handle of the knife with a stick) out the excess wood, tried the arm to see if it fitted and then kept on carving out the notch until the arm fitted the notch. This takes time but if you take it slowly you will get a snug dovetail fit between the upright and the arm. Once I was happy with the first joint I started the process slightly lower down for the next joint. 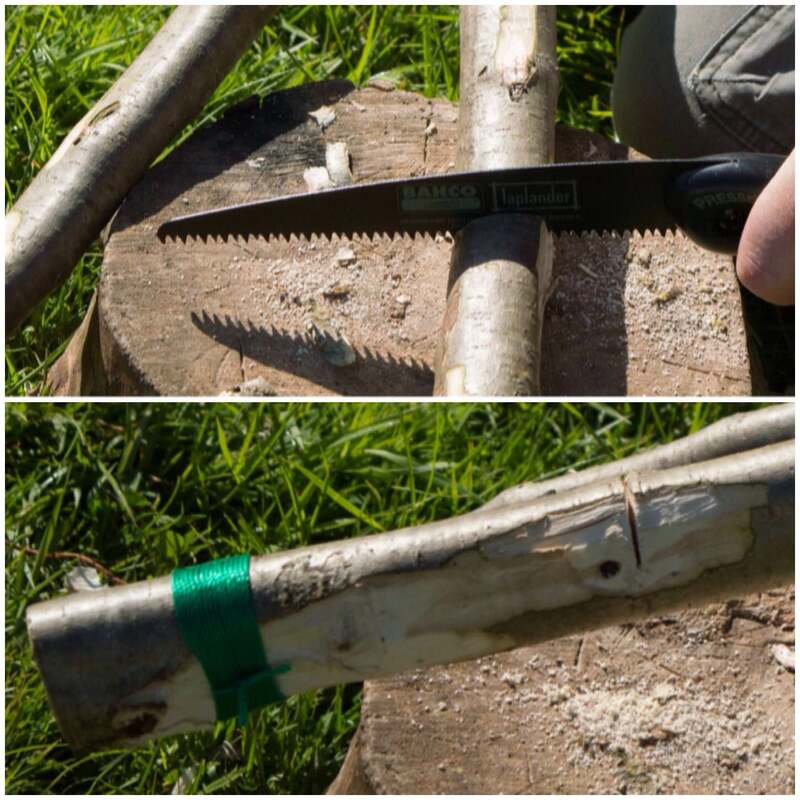 Make sure you leave a few centimetres gap at the between each triangle so that the joint remains strong. 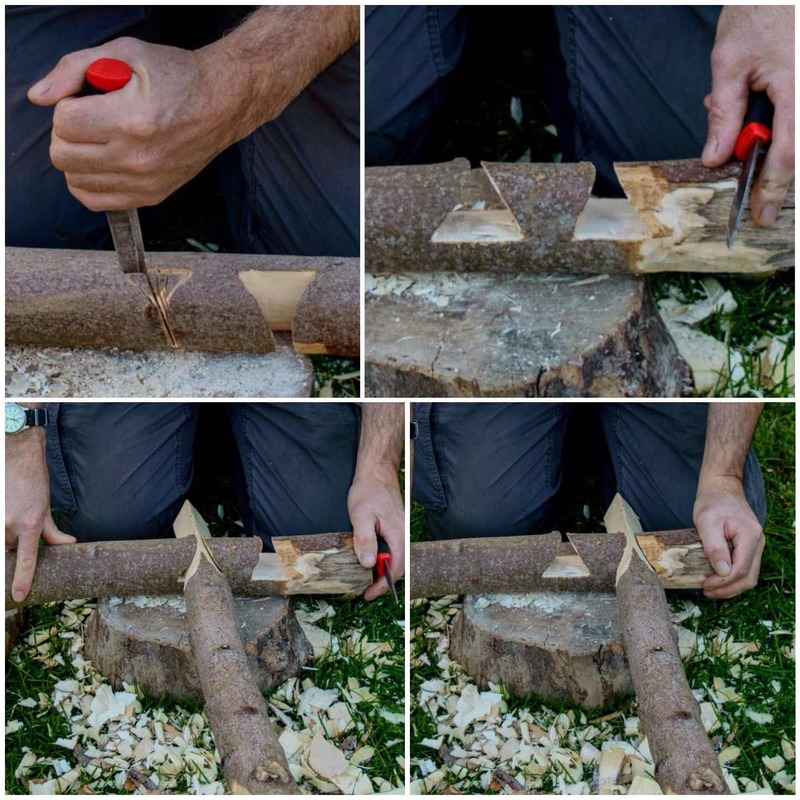 The bottom two pictures show how the arm connects into the upright. I like to have the apex of the triangle on the arm slightly protruding from the female section of the joint on the upright. This process takes time and when I made this upright I completed two in the evening and the other two the next morning (hence the change in t-shirt). Taking my time though meant that I had four snug joints that would be good for long term use. To finish the upright I carved a point at the base and chamferred the top. All this is designed to make it easier to insert the upright into the ground without causing damage to the joints. I have a tendency to make crane arms in a standard way. 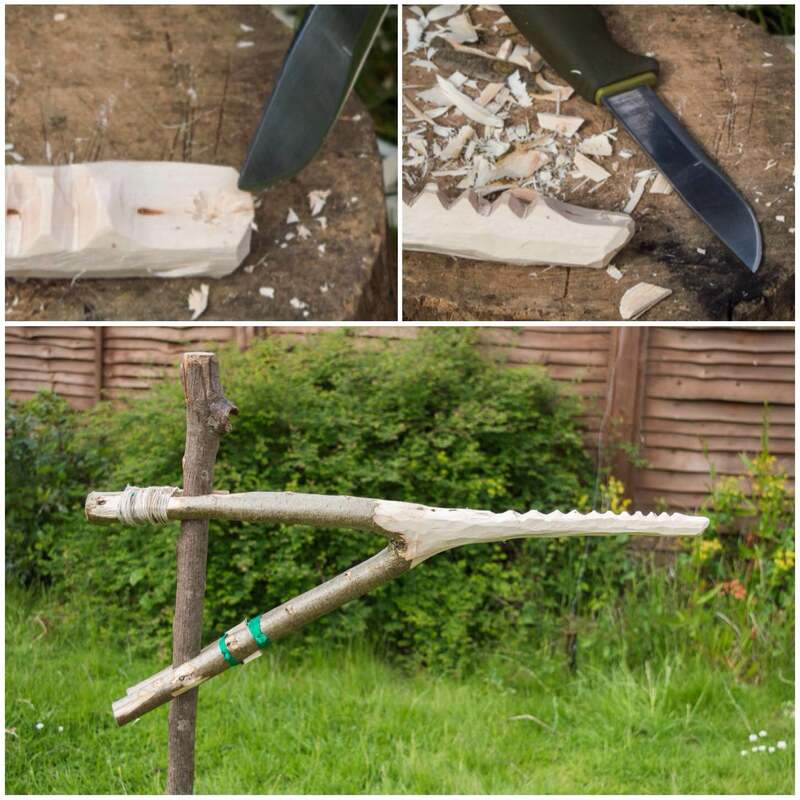 After axing out a basic shape (taking care not to touch the triangular end) I formed the final shape with my knife. I like to put lots of notches along the upper side of the arm to give the bail handle of my pot something to sit in. Having lots mean that I have the ability to adjust the placement of the pot on the horizontal plane as well as on the vertical plane using the upright. To finish the arm off I usually put a little dimple near the tip of it so I can hang an adjustable pot hanger off it if needed (picture later). I like to use a stout stick as a pile driver when using a crane so that I do not damage the upright when putting it into the ground. The ground in my garden is fairly loose so it was not a problem however some of the sites I use can be quite hard and stony. As this crane was to take heavy weights I really compacted the earth around the base of the upright and gave it a few more taps to drive it in. If you remember to chamfer the top and give the upright a strong point you should be able to drive the upright in securely. My first test was to see what weight the crane could take. I filled my Super Potjie Dutch Oven about half full and filled the group kettle up. With some cranes you can see the arm bend when the pot is put on however when I added all this weight it did not shift in the slightest. Below you can see how the adjustable pot hanger is attached to the end of the arm (into the dimple). My sister sent me my favourite treat of the year – a Guga (young Gannet) and I cooked it outdoors using the Heavy Duty crane. 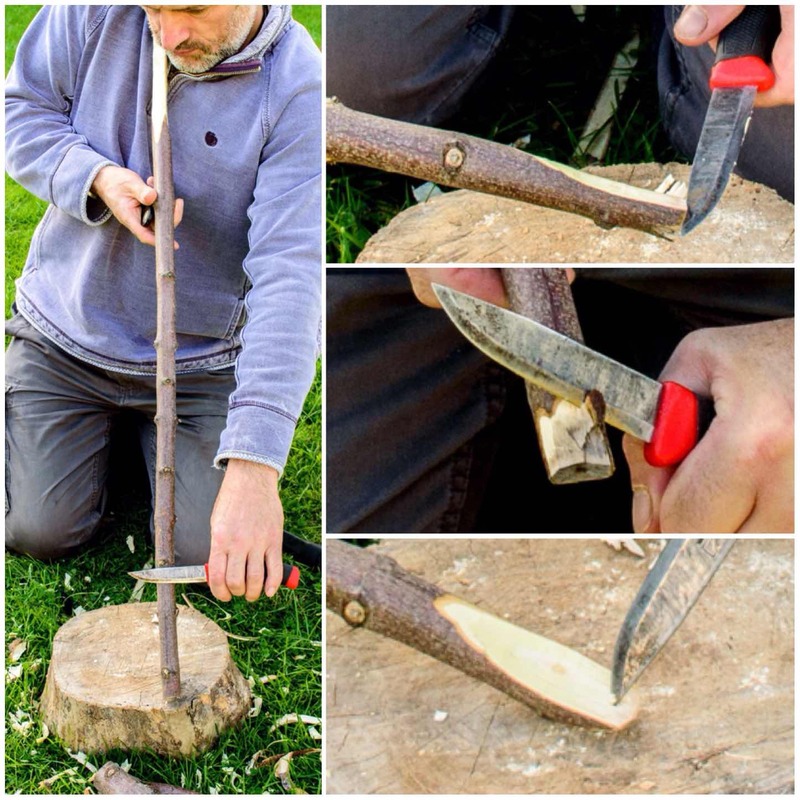 It took the weight easily enough however I did trim about a millimetre (the girth) of the triangular section so that it could be easily inserted and extracted from the upright as I sought the ideal heat. 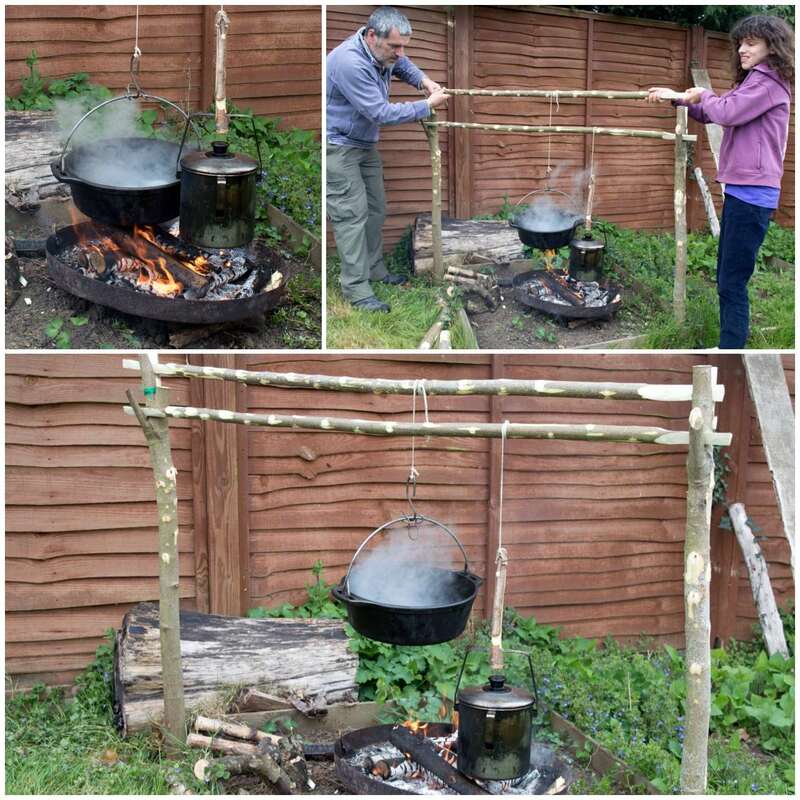 I had the pot low down at first to boil the water and then raised it so it would simmer gently for an hour. Unlike the adjustable dovetail, the lap joint and Aures cranes you cannot fine tune the height of the arm but you do have a reasonable height difference that can take a lot of weight. Treated well this crane could last you for many years and takes up little room around the fire. 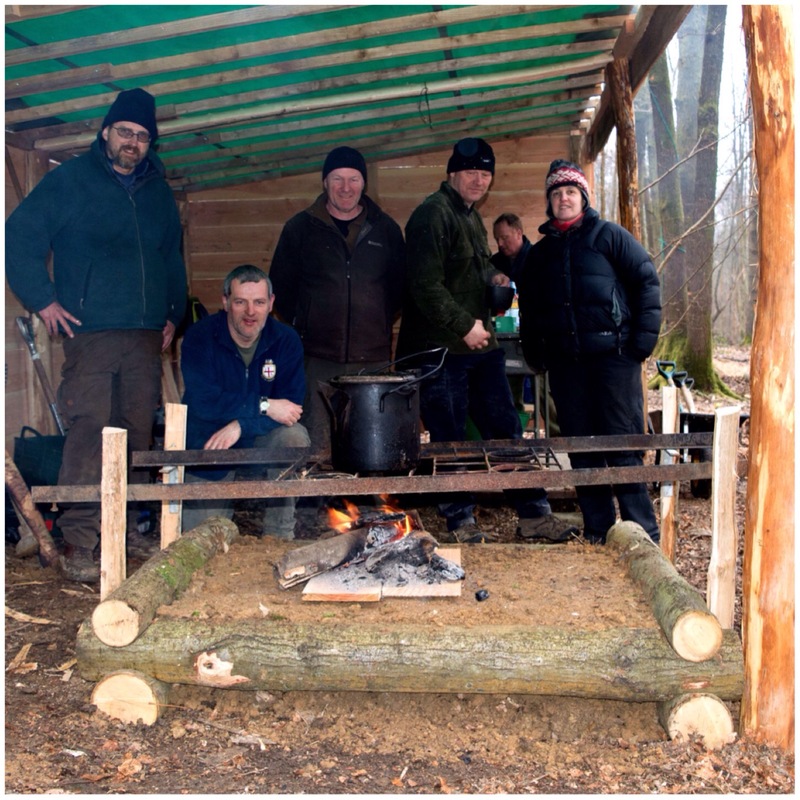 If you are doing a pioneering project yourself or with a group this is an ideal project to undertake. My search to find and document as many different campfire cranes brought me to this simple type of dovetail crane. 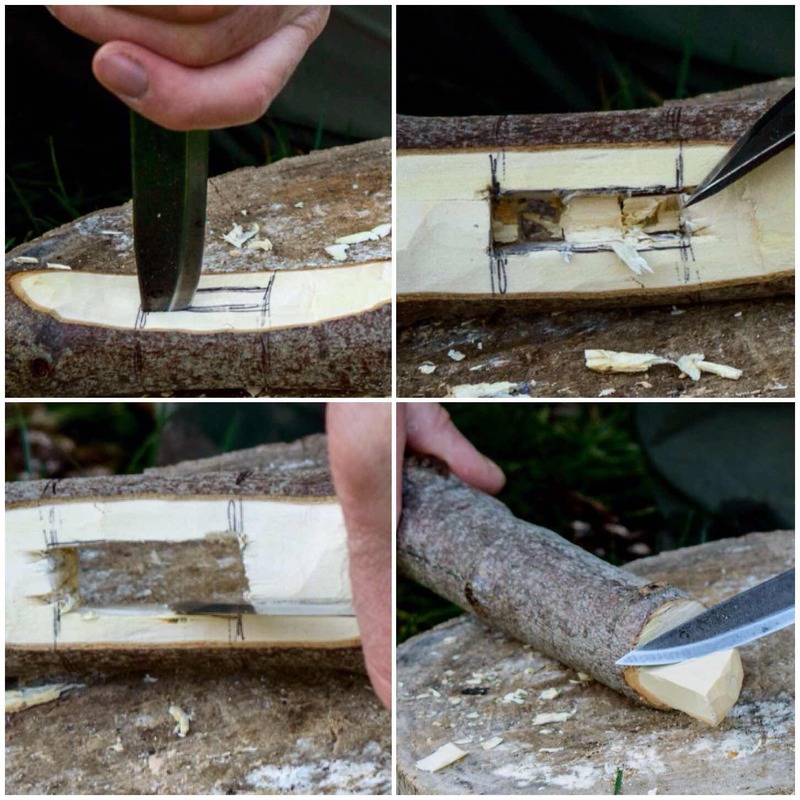 I first came across this idea from a blog post by Ken Cole Jr on the Scout Pioneering site. I expanded on their idea with adding an adjustable pot hanger to the crane. It is similar in concept to the Cooking Crane I documented previously except that the socket on the upright is created by cutting into the side of it instead of through the middle of the upright. This leads to a far quicker construction time. 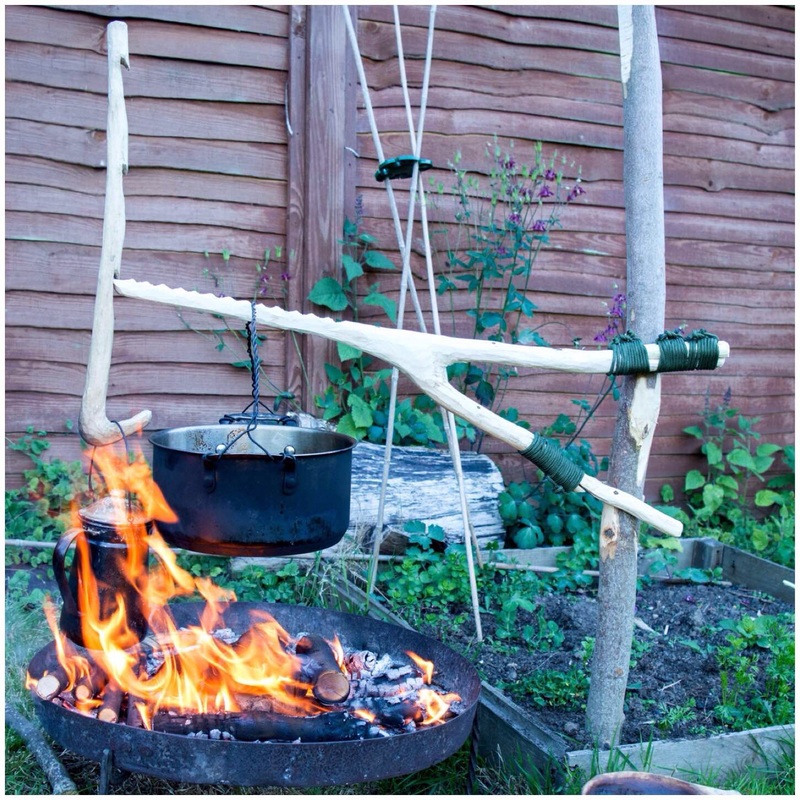 I also like these vertical campfire cranes as there is little for people to trip up on around the campfire and like my previous post on the adjustable dovetail crane this simpler version is built using just a single pole. 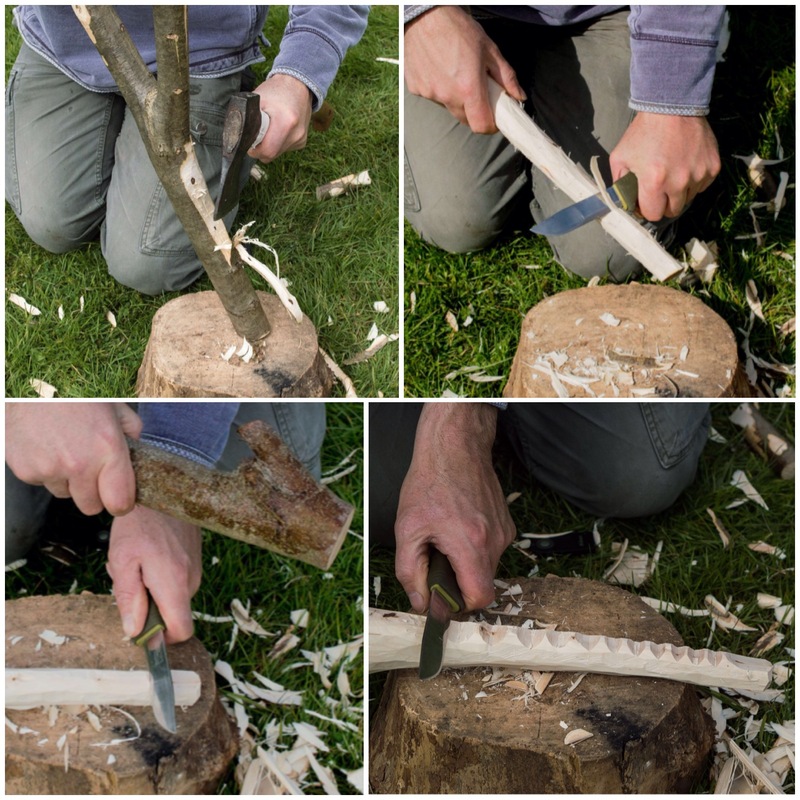 I used a sycamore pole on I had on hand trimmed it into two pieces using my folding saw. The larger pole you can see below was destined to be the upright and the thinner piece was to be the cranes arm. I started work on the arm first carving a triangular end on one side. I took my time here to make all the sides even in shape. Once the arm had the correct shape carved out I used it as a template to mark out the dovetail socket I would cut into the upright. It is worth the time doing this as you want to produce a socket that the arm will fit into snugly. Once the shape had been marked out with my knife I used my saw to cut into the upright, one on each side and then a couple of cuts through the middle. I used my knife then to carve out all the loose excess wood and to smooth all the sides out. I continually kept trying to insert the triangulated end of the arm to see if it would fit. As I wanted to keep as much wood on the arm I just used my knife to keep carving of more wood from the socket area on the upright to enlarge it. Eventually the arm was able to be inserted into the socket and released without too much force but still fitted snugly. To finish the upright I chamfered the top so that it would not split when I hammered it into the ground and carved a strong point on the other end. I hammered the upright and checked to make sure all the angles looked good. I like to have my crane uprights to have a little lean away from the fire but not too much as this could cause the arm to swing when it had a heavy load. The arm needs a little flat platform carved on the end with a little dimple in it the pot hanger to balance on. 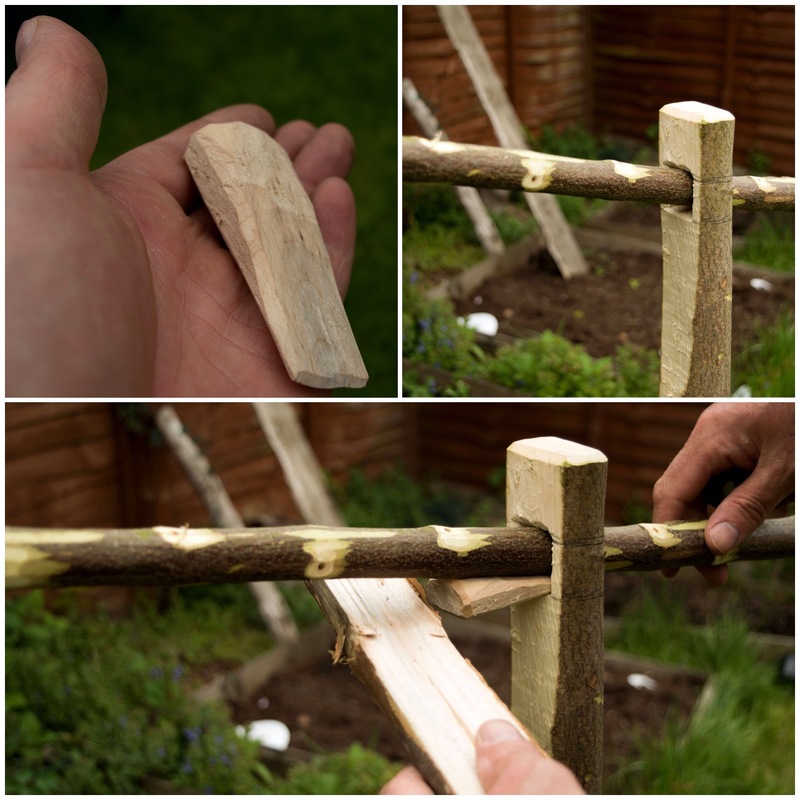 I have explained in a previous post on carving an adjustable pot hanger on how to make one of these. 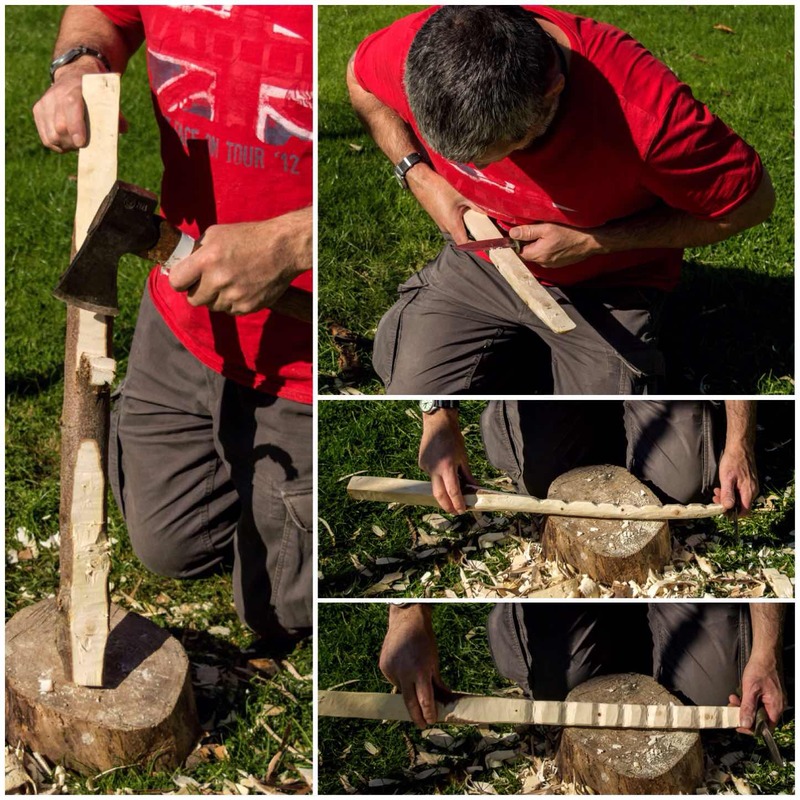 Just make sure that you carve the flat platform on the correct plane in relation to how the arm fits into the upright – I used the triangular end as a guide for this. You can see in the picture below the end of the arm has a slightly flattened surface and a slightly curved surface underneath it. 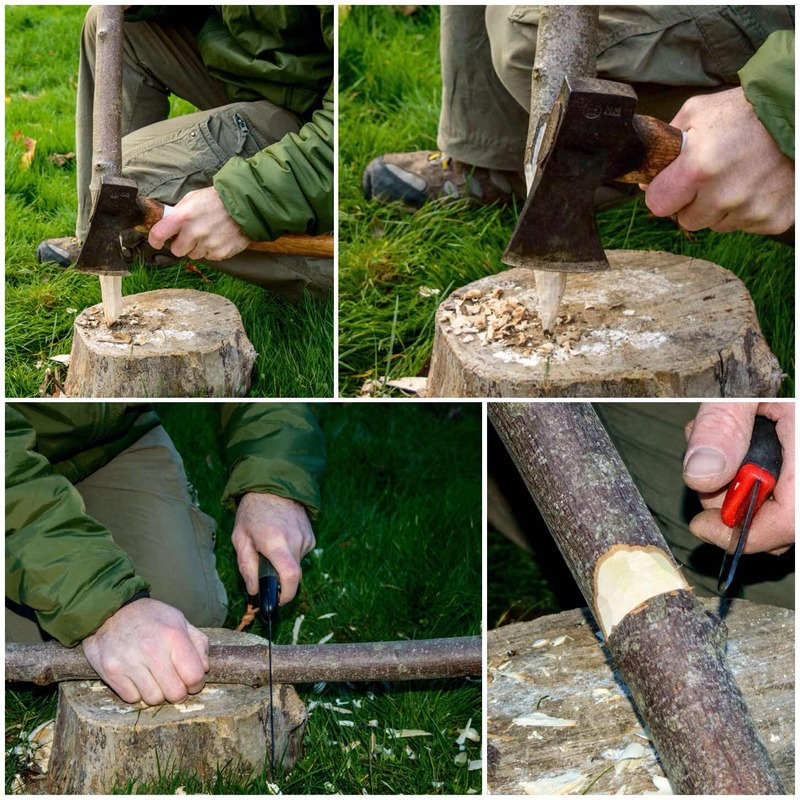 If your pole is long enough you could carve your pot hanger from it. In this case I had plenty on hand so just used one I had made before. You can see in the picture below how the pot hanger sits on the tip of the arm in the little dimple. It looks very fragile but it can hold a lot of weight if everything is carved properly. I decided to shorten the arm of the crane as it bent a bit with the weight of the full kettle so rather than cut the end with the dimple I just extended the triangulated area of the arm so that it could be adjusted easily(I did trim the back of the arm later). I was quite happy with the arm being this length for the weight of the full kettle. I also brought out one of my Dutch Ovens and filled it with water to test out the crane. I decided though to carve another shorted arm so that it would stand up to the extra weight better. This shorter arm did bend a little bit but it did not break. Just to make sure I left the pot hanging off the crane for two days without any problems. I took the crane to a Sea Cadet camp last weekend and it was used all weekend to keep the kettle on the go. There were a lot of staff around the campfire most of the time but due to its minimal footprint the crane did not get in anyone’s way. I really like this crane for various reasons, these being it is simple, quick to make, tidy and strong. If you have never made a crane before I recommend this type as one to experiment with. 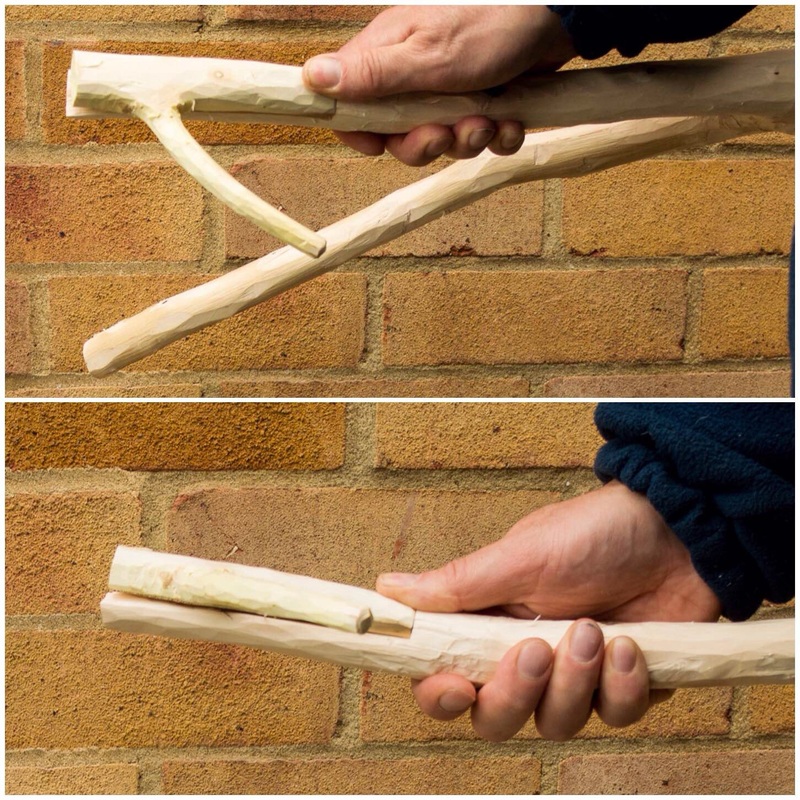 While I was writing my post on the Single Fork Aures crane I got a message from a Bushcraft USA member called Alukban about another type of campfire crane, which was made out of a single piece of wood and looked quite straightforward to carve. The connection between the arm and the upright is a type of Lap Joint. It is easy to adjust and can take the weight of a decent-sized pot. I had some sycamore lying around, about a metre and a half long. I trimmed the fork off the end as it was not needed and then cut the pole into two further pieces. 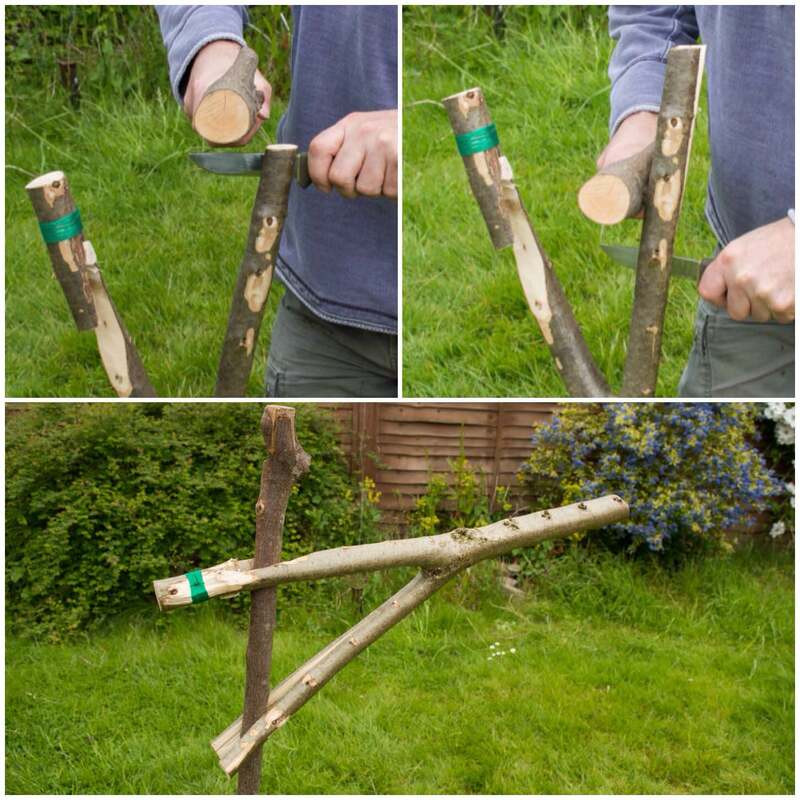 In the picture below all the wood to the left of the folding saw became the arm and the rest became the upright for the crane. I squared off three of the sides of the upright along two thirds of its length and formed a point on the bottom third. I took my time doing this so that it was as even and as smooth as possible along its length where it was squared. Once I was happy with the upright I moved onto the arm. The whole crane works on the principle that the weight of a pot hanging on it will create enough friction to hold the arm against the upright. I used the upright as a guide to measuring where I need to cut out the lap joint on the arm (I measured it so that the lap joint would be very tight initially). I did not make this a 90 degree angle but about 100 degrees, so that the tip of the arm would be pointing slightly upwards. Once I had marked the width on the arm I cut some stop cuts to half the depth of the arm and then added some more to make it easier to carve out. I also used my saw to carve out some of the excess wood from the joint area. 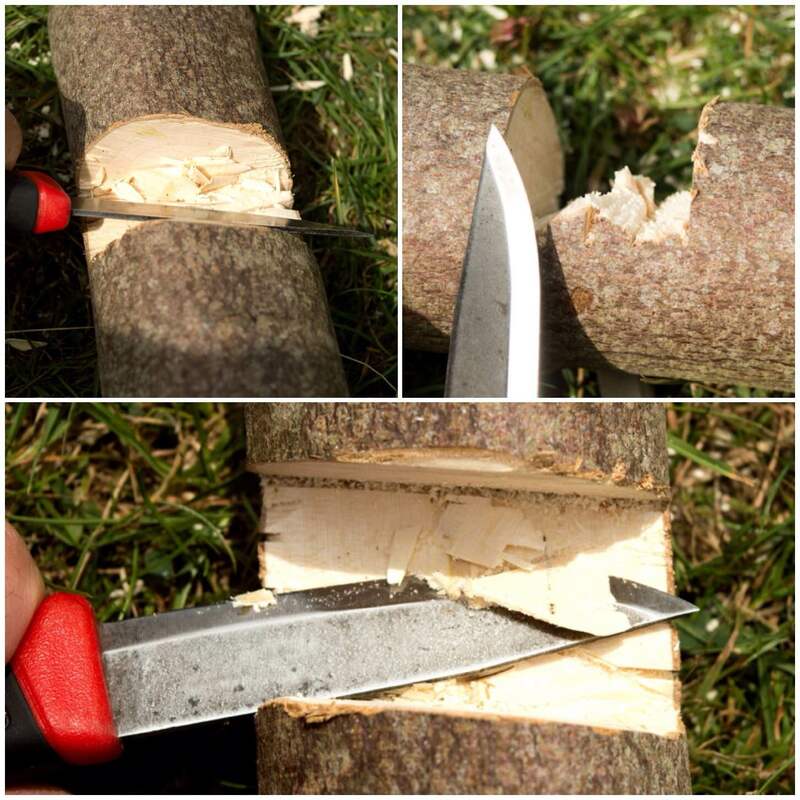 Once I had taken out most of the excess wood with the saw I used my knife to remove the rest and make it all smooth. I locked the two pieces together and started to move the arm up and down the upright. 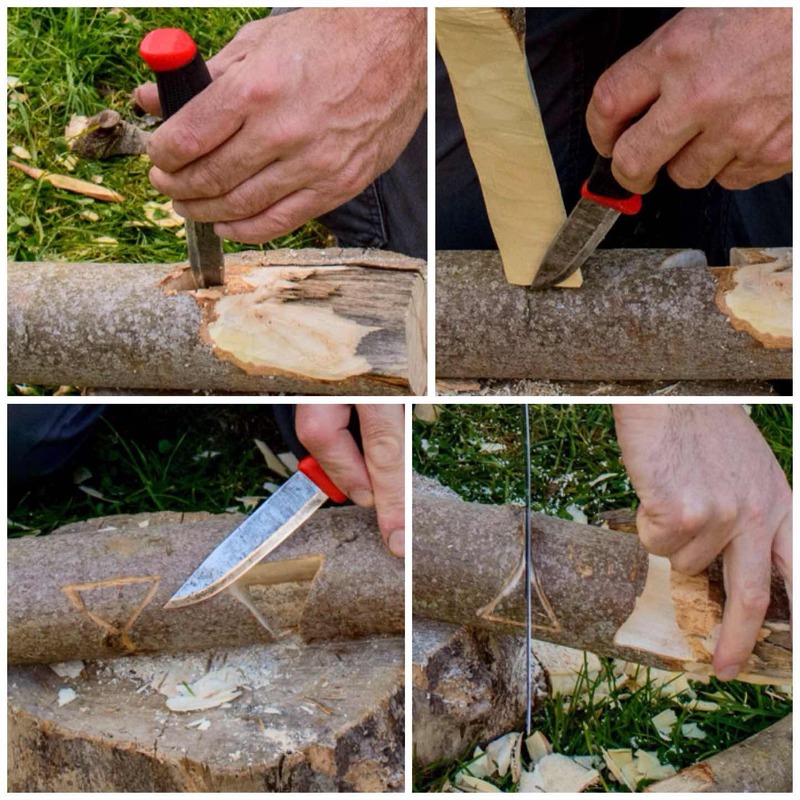 This allowed me to spot rough areas still on the upright and then I was able to easily trim that wood off with my knife. 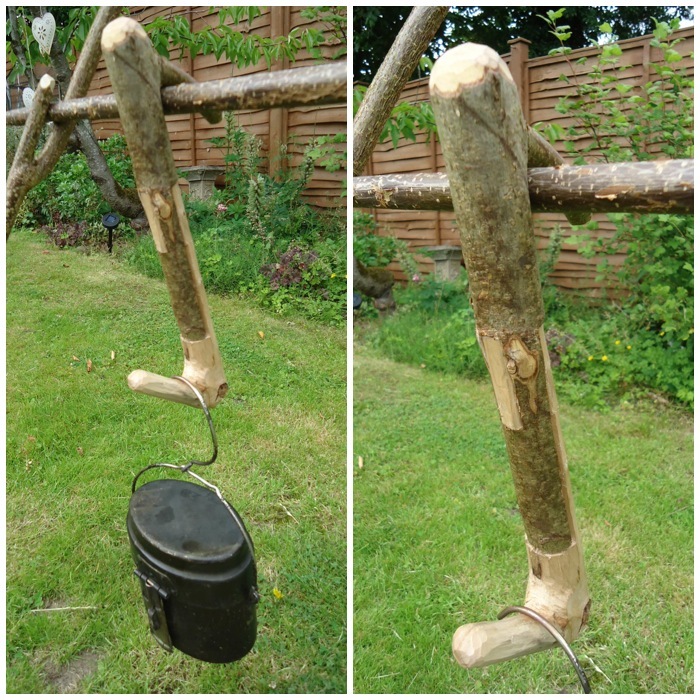 Once I was happy that the arm could move easily up and down the upright I trimmed of loads of excess wood from the arm to make it easier to attach a pot. I put a stop cut about a quarter of the depth of the arm all the way around it to protect the wood around the lap joint. You can see the general shape of the arm appearing now. I likened it to the shape of an old-style naval cutlass. I added a few ridges along the length of the arm to hold pots securely and then started trying it out. 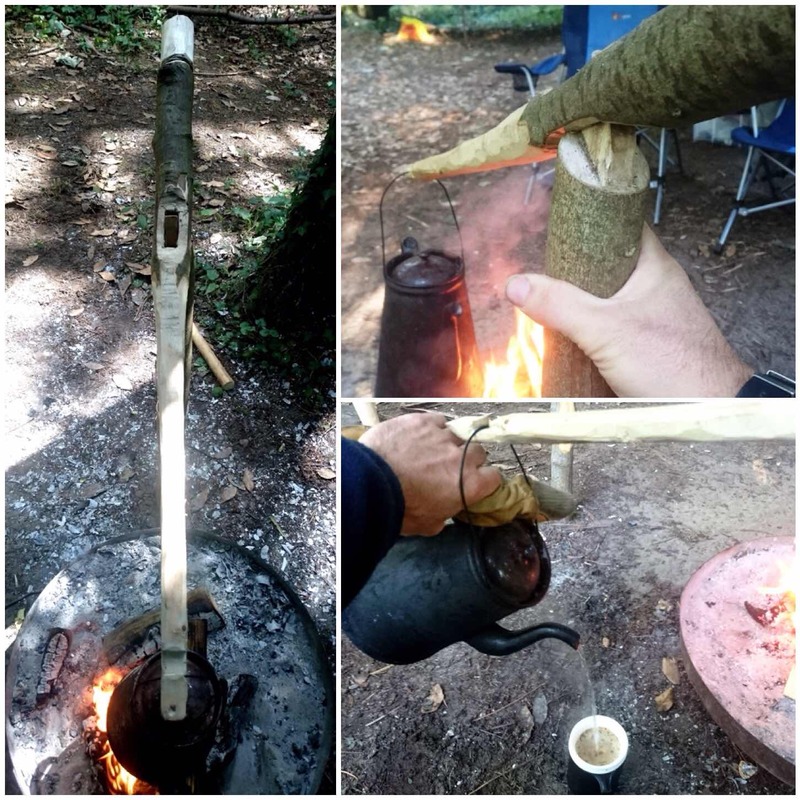 I used this crane for two weeks at the Bushcraft UK Bushmoot in South Wales over the summer and was quite impressed with it. It holds pots well under tension but it needs to be treated with respect when moving the pot up and down. I found that the crane works best with the pot hanging from near the end of the arm. If you move the pot closer to the upright along the arm it has a tendency to slip. I will be making a variation of this style over the next few days with more of a dovetail joint so that the arm cannot come off so easily. I like this crane due to its simplicity so give it a go. The final part of the Aures Crane Trilogy – The Classic. 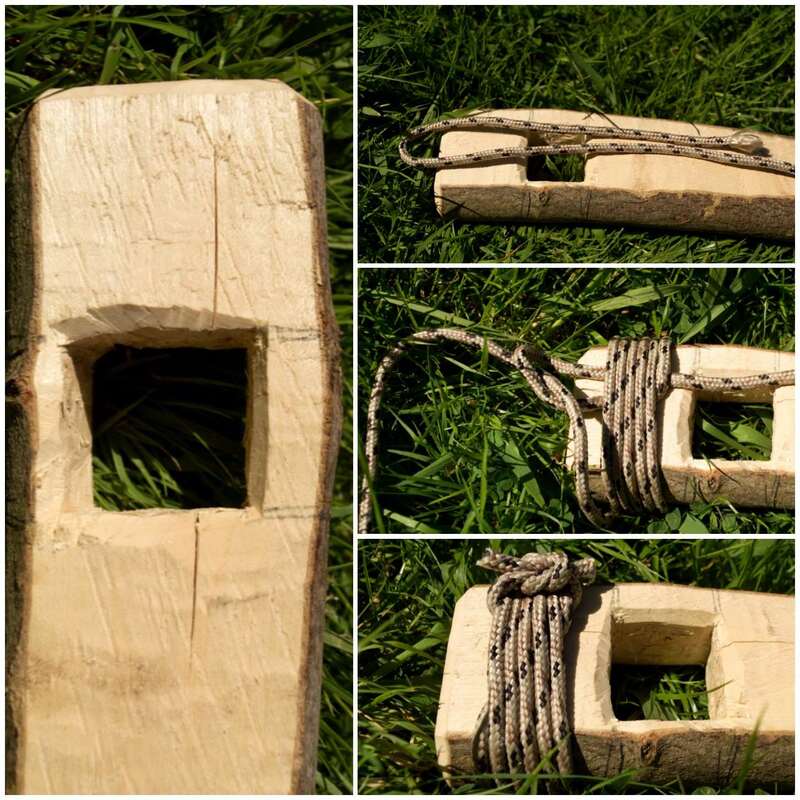 I call this one the Classic as it is the design laid out in the book Camp-Lore and Woodcraft. The author Daniel Beard called it a rustic crane fashioned along similar lines as the iron cranes found commonly over 100 years ago over open fireplaces. The crane is named after Victor Aures, a Scout Master from Buffalo, NY. I found a good article on this from an issue of the Boy’s Life from 1915. 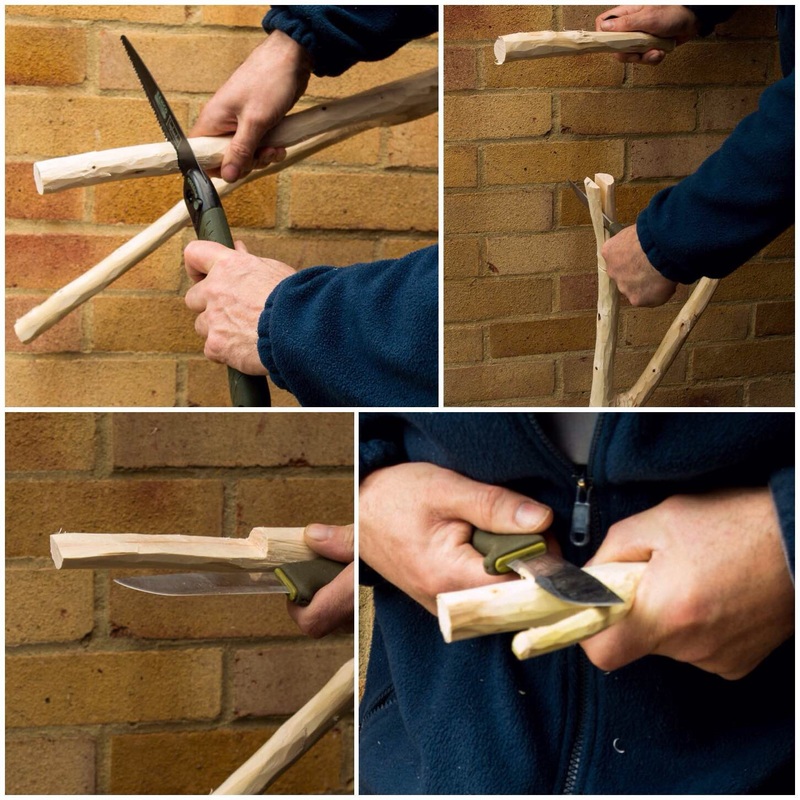 You do not see the classic crane often since it requires a specific configuration of angles on the forks and it’s all too easy to cut through the thin layer of bark and sap wood needed to form the loop on one end. 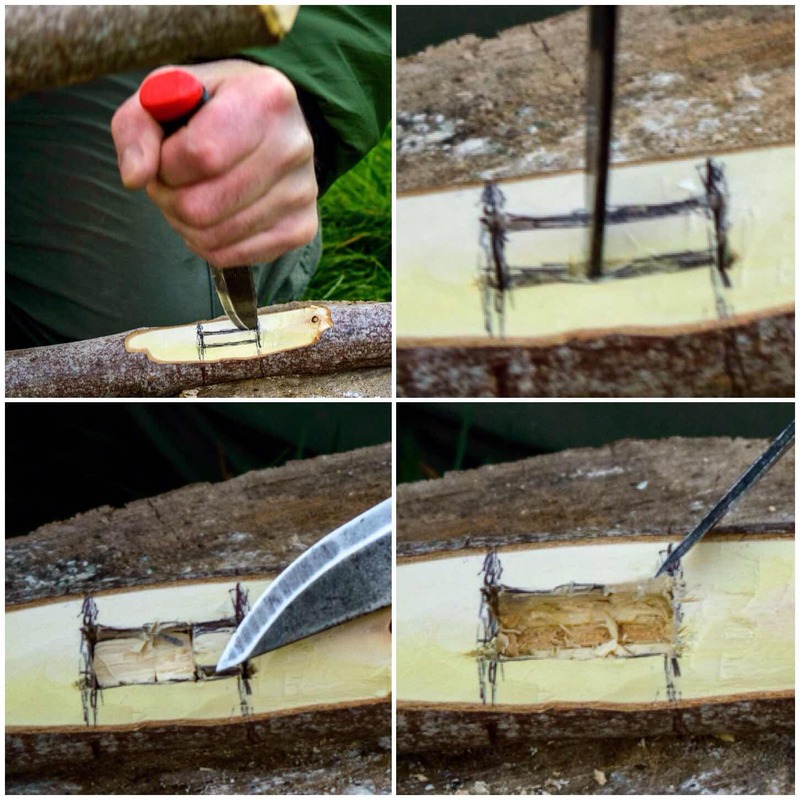 I stumbled upon a good piece of hazel recently with a strong main fork and the necessary secondary fork at right angles to the main one. 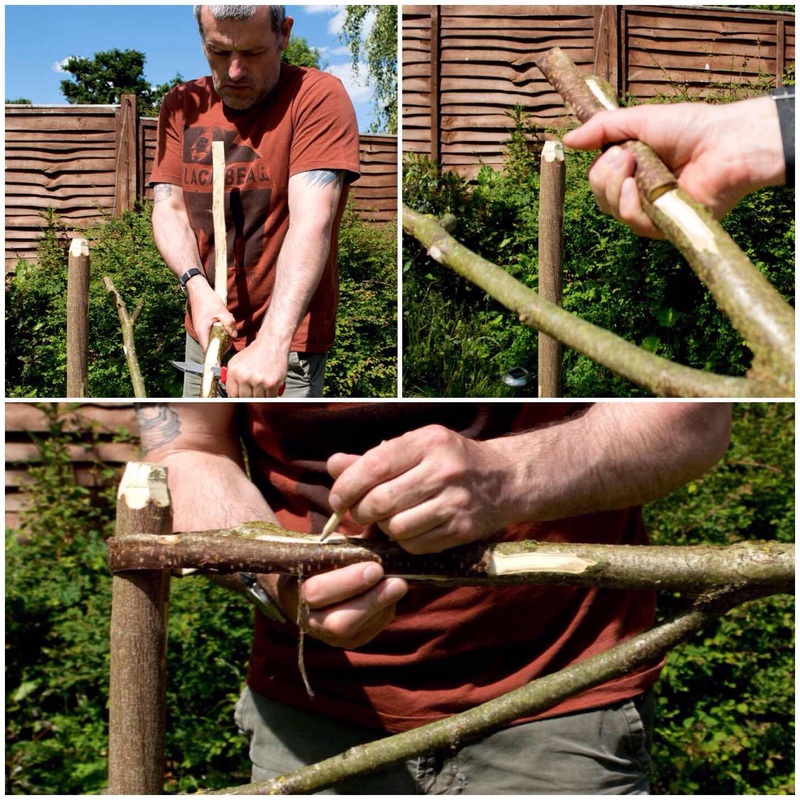 I had a good pole that I was going to use as the upright and measured the top limb for trimming. I estimated with my eye the amount of wood I would need on the top limb to form the loop (I call this section the tail before it is formed into a loop). After sawing off the excess I started the slow process of removing all the excess wood on the tail. 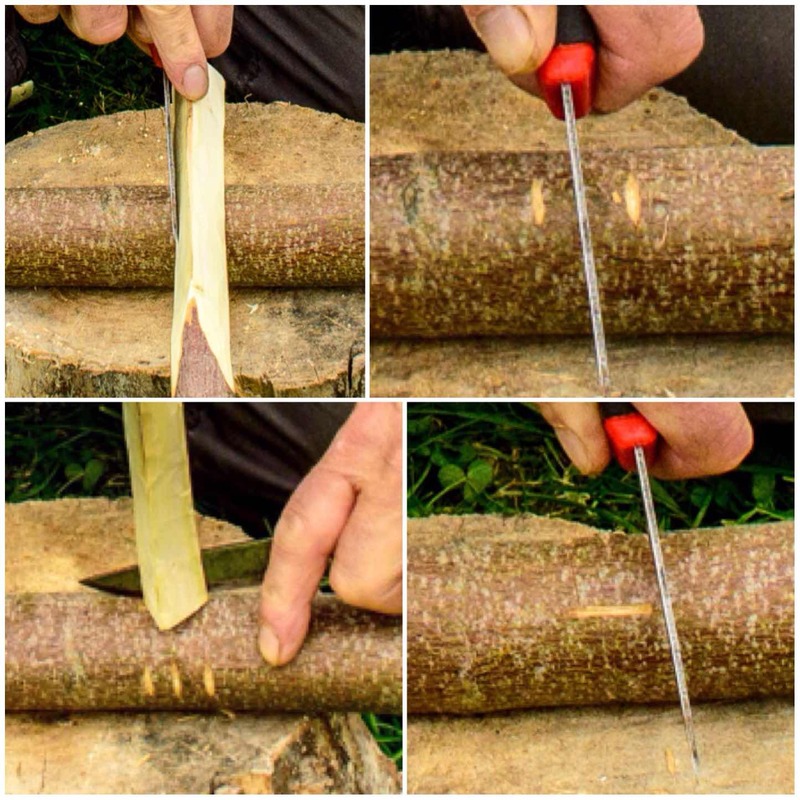 It is easy to remove the wood at first but try and remove it evenly as you work. I tend to work from the end of the tail and work up the crane towards the fork. 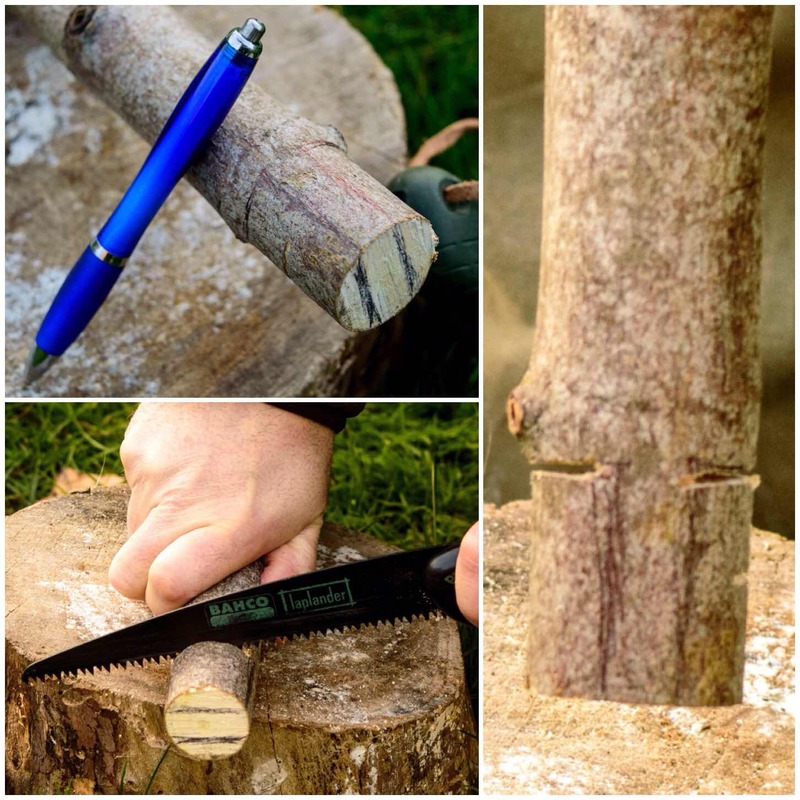 This helps in reducing the chance of chunking through the wood and destroying the crane. In the pictures below I have worked my way down to the pith and then just passed it. I forced myself at this stage to take my time and work methodically. Eventually I could make the wood bend slightly (it was only a couple of centimetres wide now). 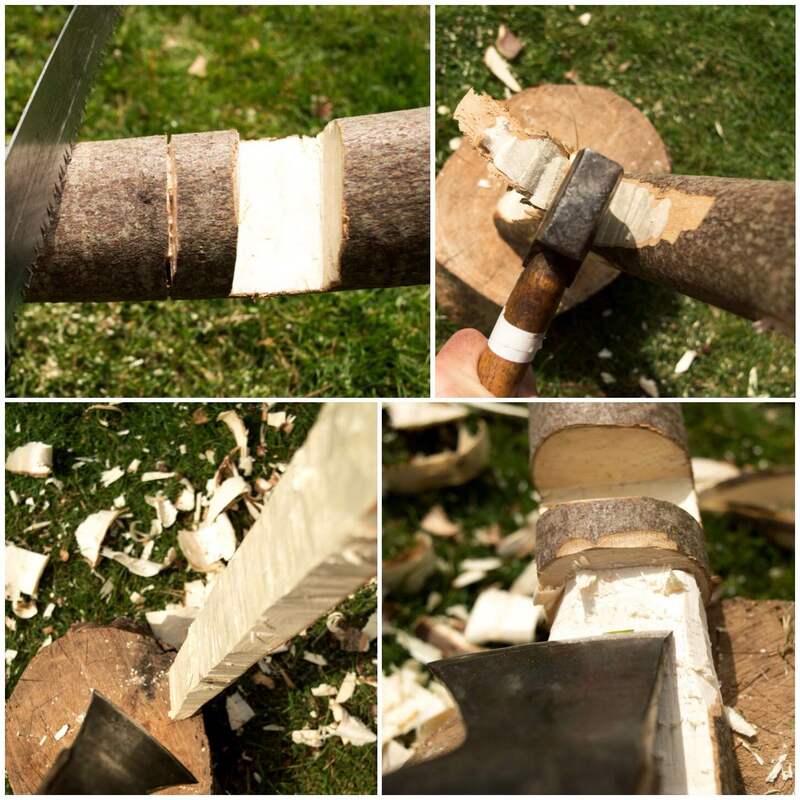 I scared myself when the bark cracked but that is OK – it is the sapwood that needs to bend. 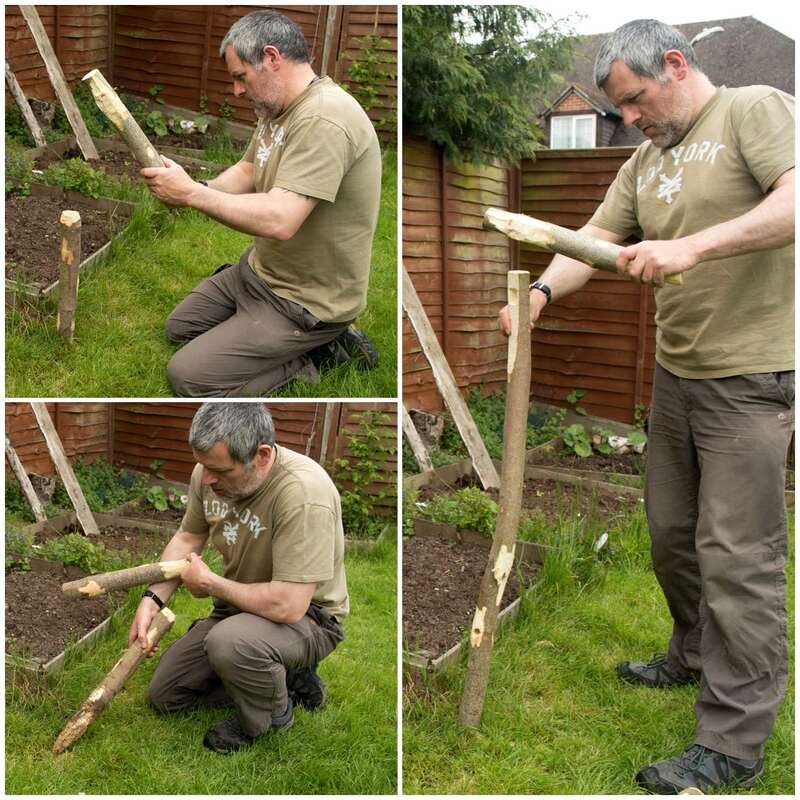 When bending down the wood do it slowly and do not try and force it. I finally had just a thin piece of sap wood left that could be bent a bit more but not fully. To help this process along I used the tip area of my knife to cut out some more of the wood without making it any thinner than a couple of centimetres. To help the bending process I left the crane in a stream to soak up some water. If you have the tools to steam bend wood the job would be much easier. Once the tail was very pliable I flattened an area where the tail would be whipped to the crane then marked the tail and the main body of the crane with a pencil so that I retained the size of loop I wanted while I whipped it. 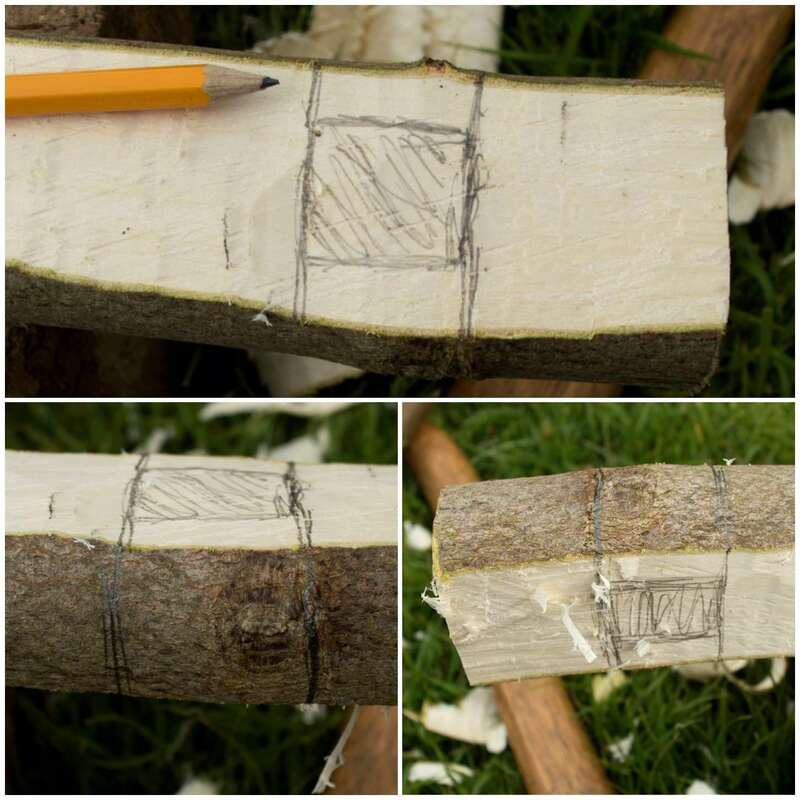 In the book Camp-Lore and Woodcraft, Beard’s drawing shows the tail being tied off with strips of bark. I will use bark when the crane has fully seasoned (it will shrink in the process) but for now I whipped it with some old paracord. I whipped it twice with different cord as that is what I had to hand. The loop should be big enough for your upright and positioned so that when the crane is hung on it and braced on the fork, the pot arm is level and pointing slightly upwards. I then went to work on the pot arm, carving out little notches so that I could adjust the position of the pot easily along its length. I also put my usual dimple on the end for hanging another adjustable pot hanger off it. 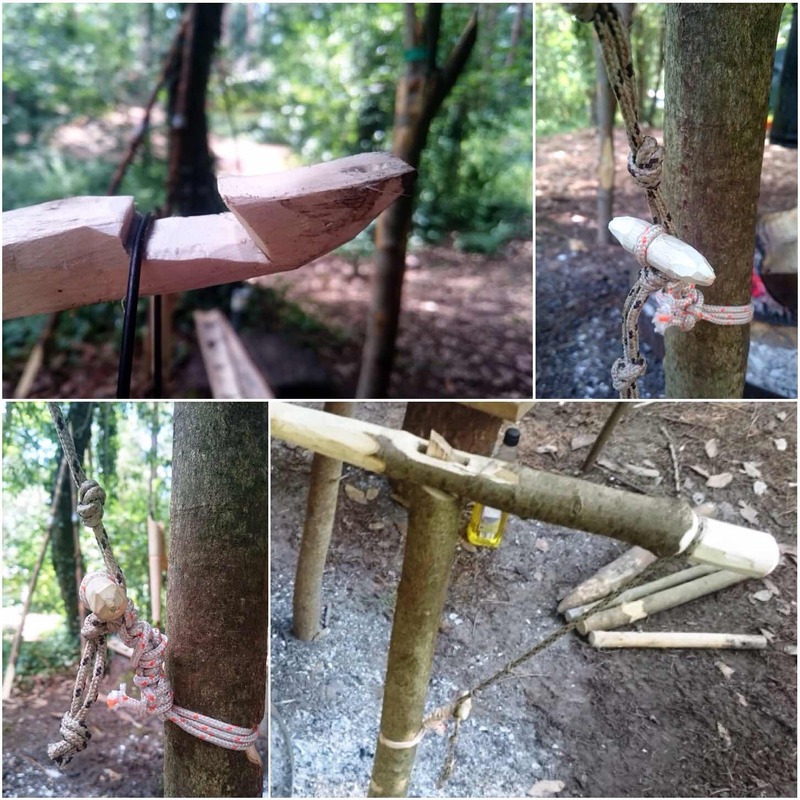 I took the crane out on a Bushcraft course with the Royal Marine’s Cadets and it was soon in action. It is very easy to move the crane up and down with light pots (I advise removing heavy a pot from the crane before adjusting the height then replacing it). The crane also swings easily away from the fire. If you do not trust the loop to hold a heavy pot, you can back it up with a loop of cord. 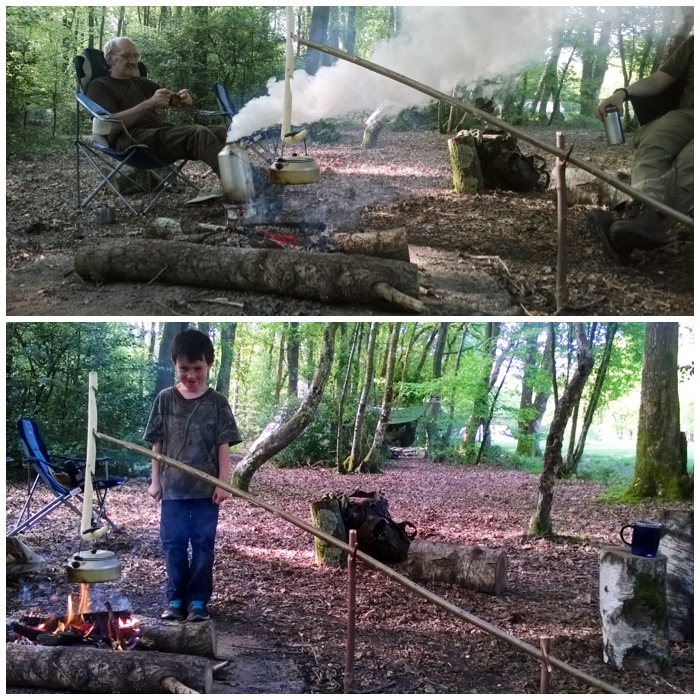 I really enjoyed making these three Aures Cranes and hope to see a few more over fires at Bushcraft meets in the future. That is it for me on the Aures Crane (I am sure you can come up with some more variations on this), however in the course of my research I discovered a Single Pole Crane – that is next on the list. 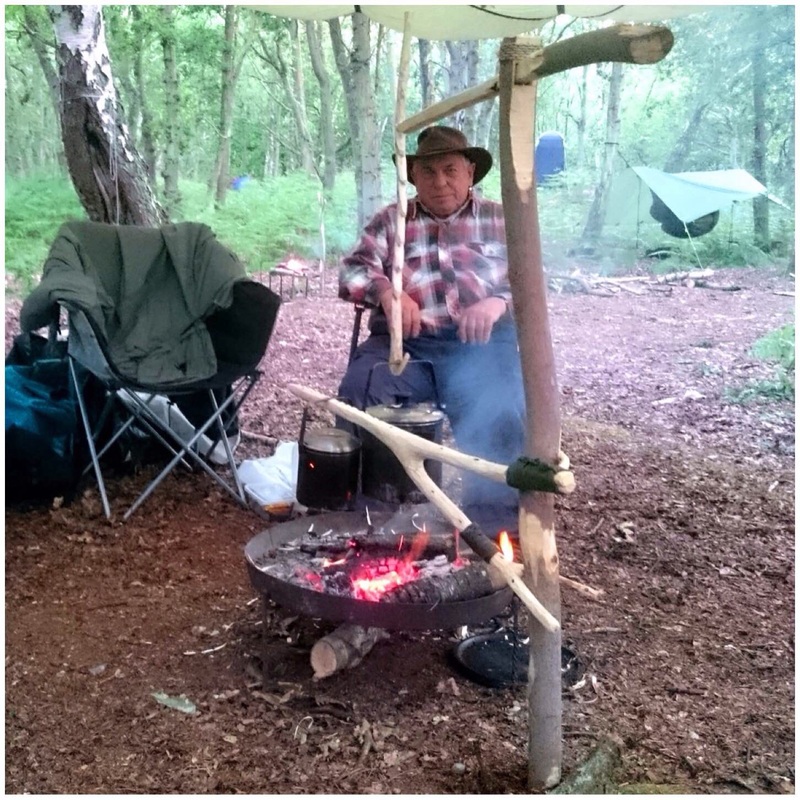 This is the second of my blog posts on the Aures campfire crane trilogy. 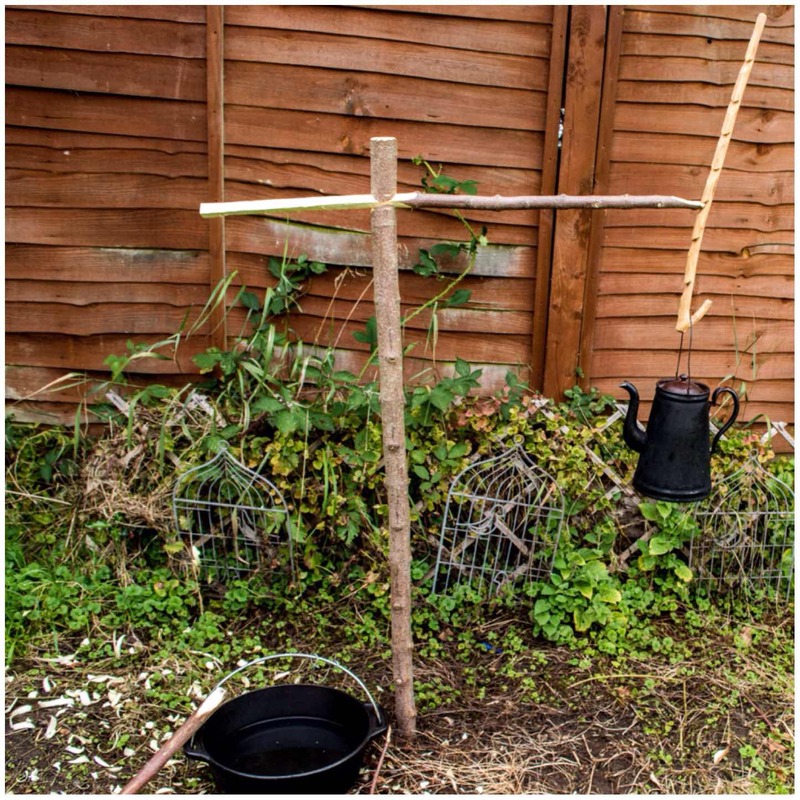 I call it the Gibbet crane based on a pot hook I found mentioned in the book Camp-lore and Woodcraft. The crane does look a bit like a traditional gibbet but the name apparently refers to the overlapping joints used in its construction rather than its likeness to an instrument of execution. 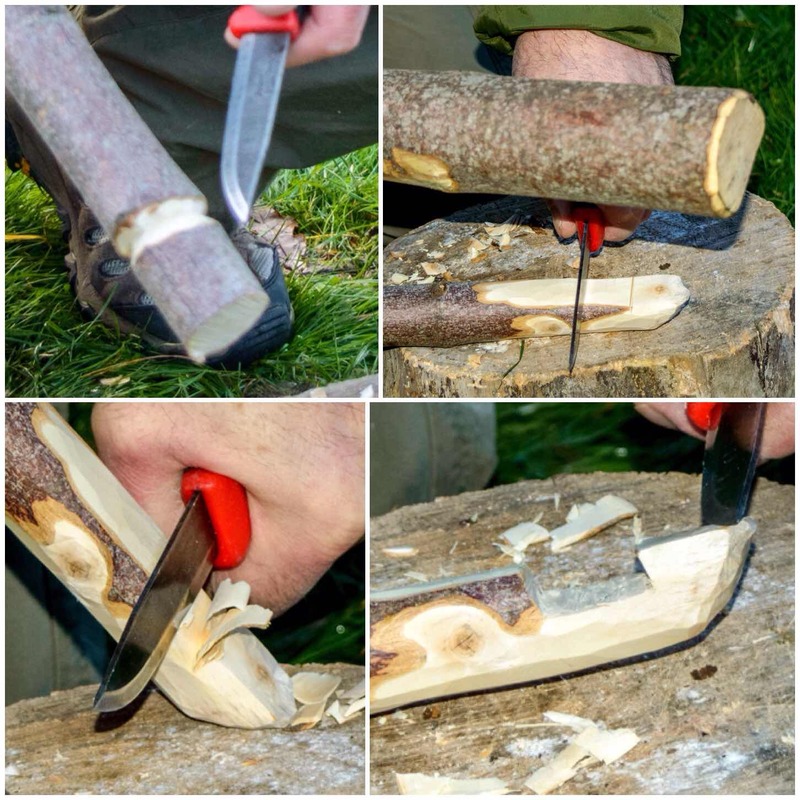 This is a great project for the longer-term camp or if you want a bit of practice carving joints and whipping. 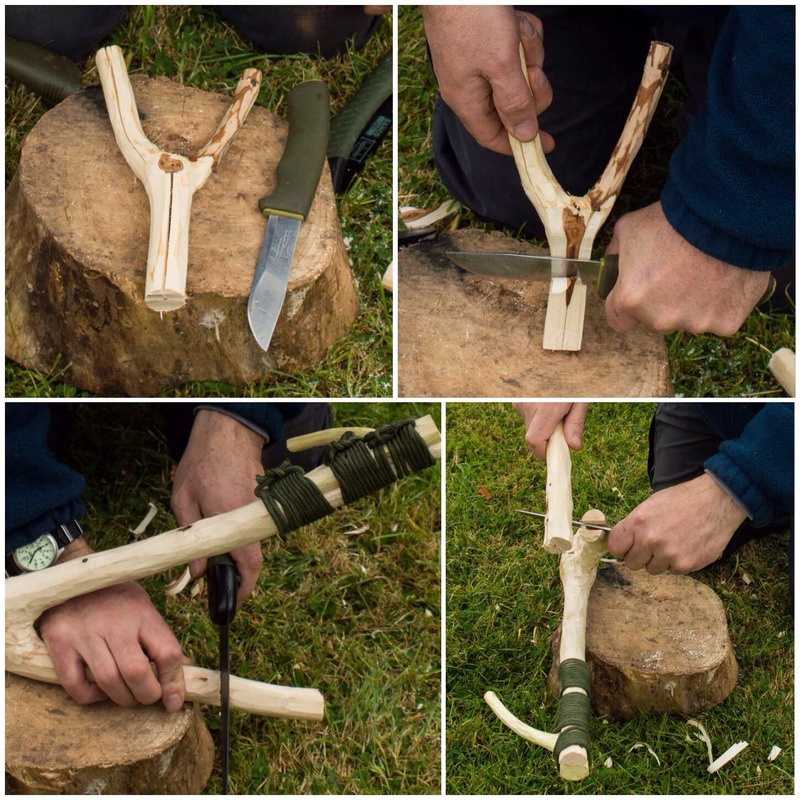 As usual the tools for making the crane are to be found in most bushcrafters’ backpacks – a knife, saw and axe. I saw this crane set up many years ago at a camp however I have seen little written up about it in books or online. 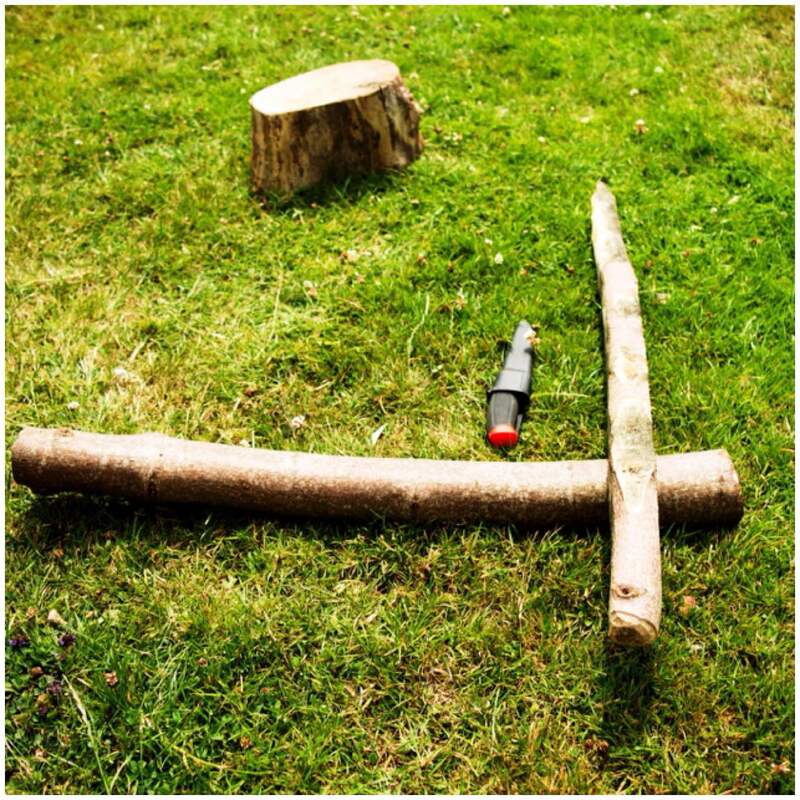 I found one piece of wood with a strong fork and a smaller catapult-shaped fork (bottom left below) and I cut a limb with a branch coming out (top left below). The first job I did was to strip off all the bark from all the pieces. I placed the large fork up against the pole it would hang off to measure where I needed to trim each limb. 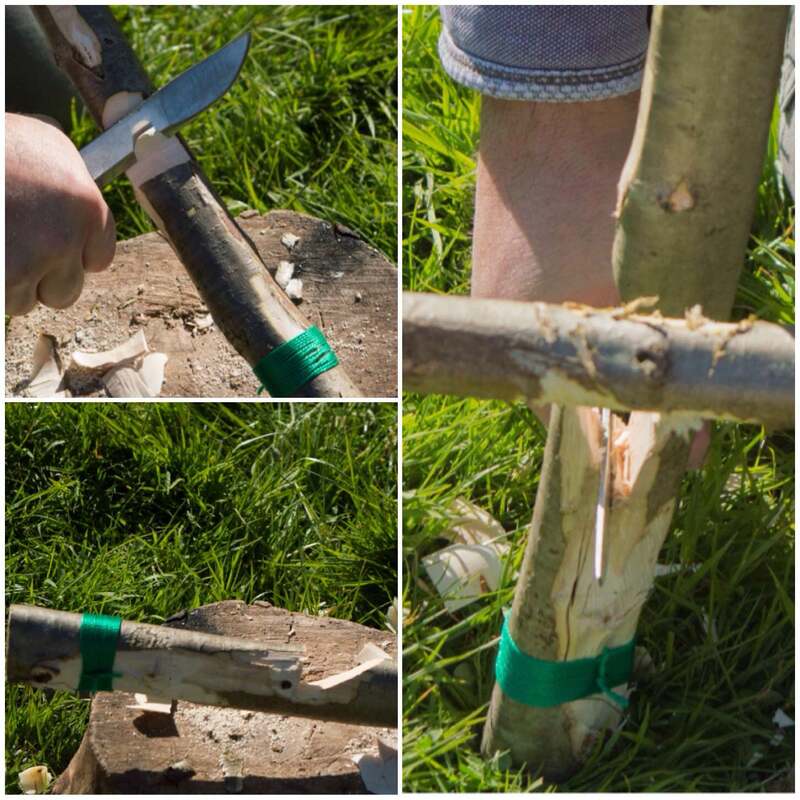 To do that I just used my knife to mark the limbs. 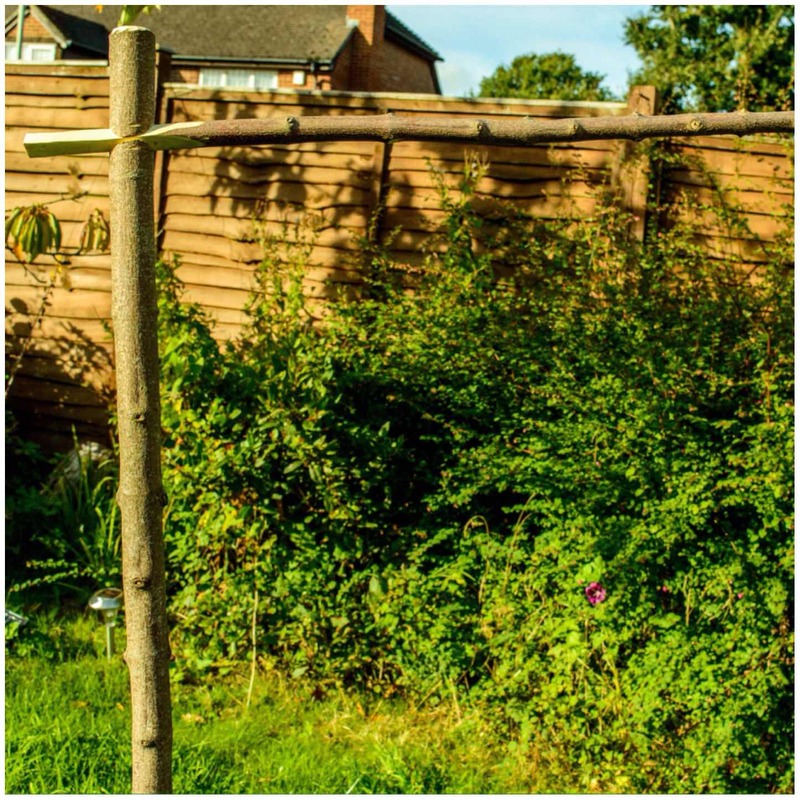 The top limb needs to be marked to the left of the pole (as you see in the picture below) and the bottom limb needs to be marked to the right of the pole as you see it below. 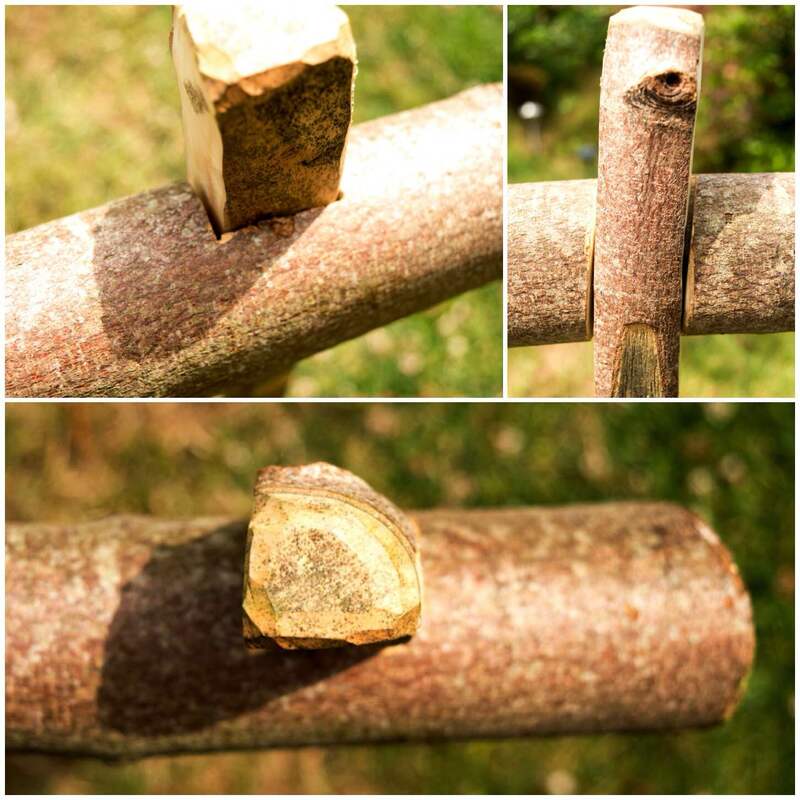 To begin with I trimmed the top limb at its mark with my saw, leaving the bottom one for the moment. I laid the small hook beside the end of the top limb so that the hook was pointing towards the big fork and marked where I wanted to trim it. I did not want to leave it too big – just big enough to be whipped to the big fork. I wanted the joint to be strong so I put a stop cut into the top of the upper limb so I could cut out a lap joint (also known as a Gib joint). I then battoned off the excess so I was left with one half of the lap joint, then I trimmed the bottom of the small hook flat to fit snugly against it. Not a perfect fit but good enough. I then used paracord to whip the two together, on both sides of the hook. 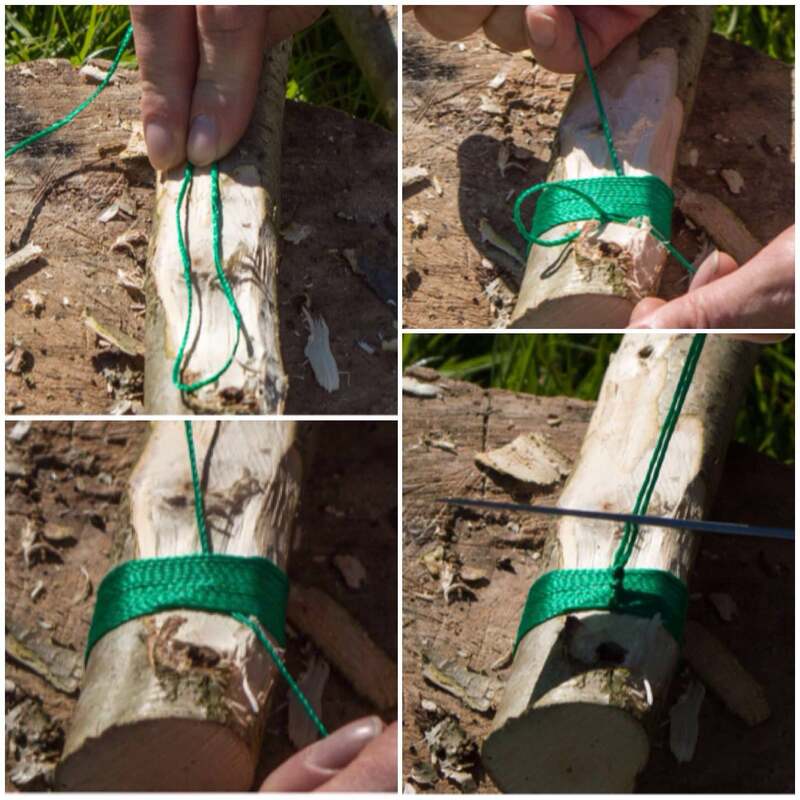 I left excess string tied in a knot as the wood was green. As it dries out the wood will shrink and I will have to redo the whipping. I flattened the upright of the ‘Y’ piece and split out a Gib joint on the lower limb. You have to make sure all the cuts are done on the correct planes so that the hanger will fit on the upright pole without twisting. After a bit of whipping it was time to set it up and make sure it worked correctly. In the bottom right picture you can see clearly how it all comes together. I have a particular way of carving the hanging arm (you be as creative as you like). 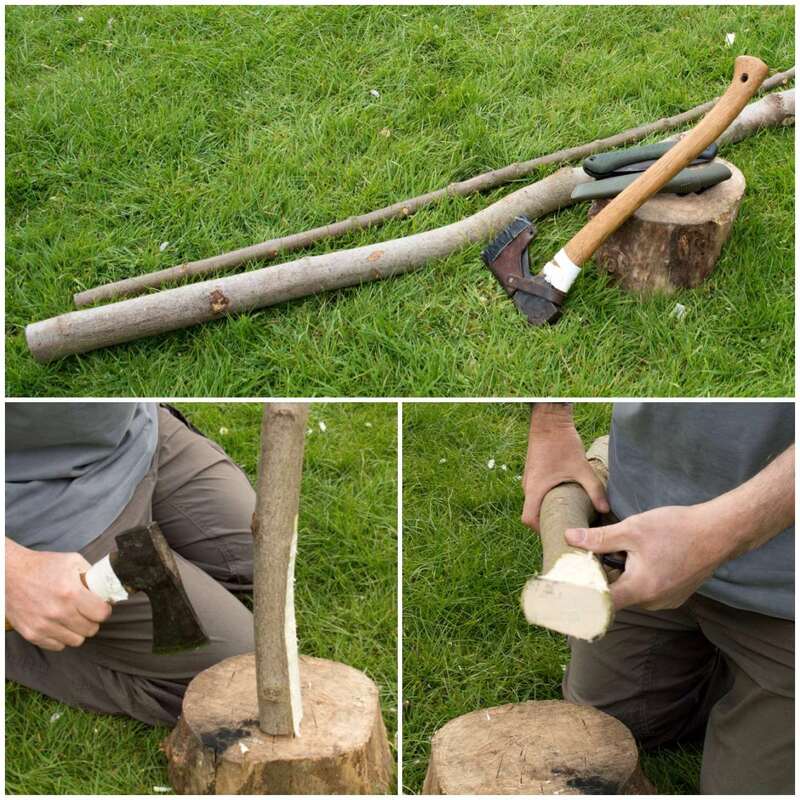 I axe out the basic shape I want, trim it smooth with my knife and cut in lots of grooves along the upper part to allow the pot to be hung on various areas of its length. Once all the grooves are cut I tend to put a dimple in the end so I can attach an adjustable pot hook. This allows me to hang two or three pots from the crane. This sequence of shots shows the method I use for adjusting the height of the crane when it has a heavy pot attached to it. 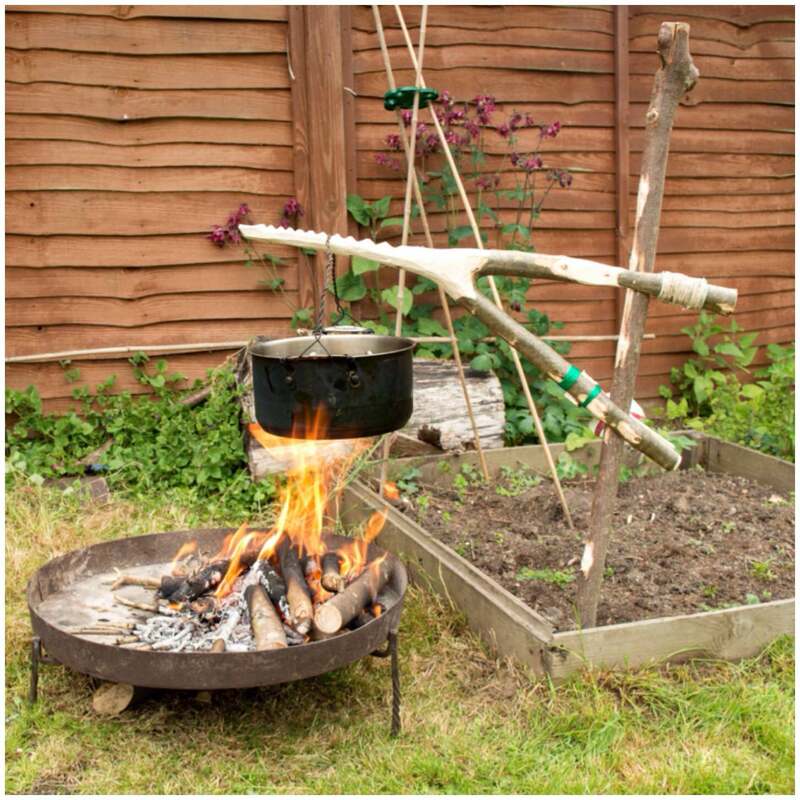 I swing the crane away from the fire, remove the pot, adjust the height of the crane, attach the pot again and swing it back over the fire. 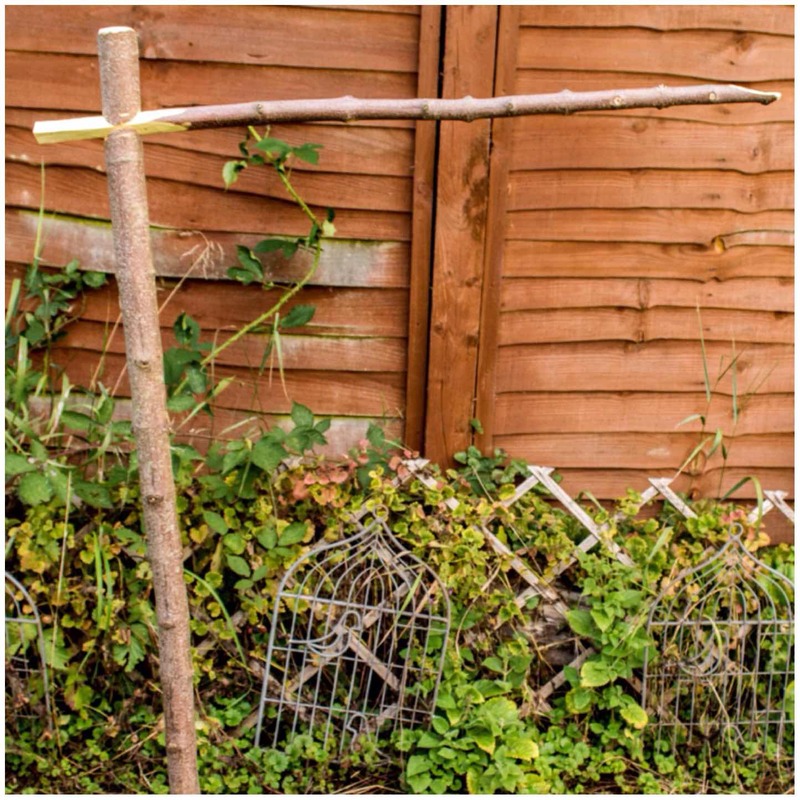 With light pots you do not need to remove the pot but just lift the crane slightly so it detaches from the upright and then just move it up and down. In this picture you can see how the arm works with an adjustable pot hook attached to the end of the crane arm. It looks precarious but with the usual level of care you take around any fire I have found this system works well. 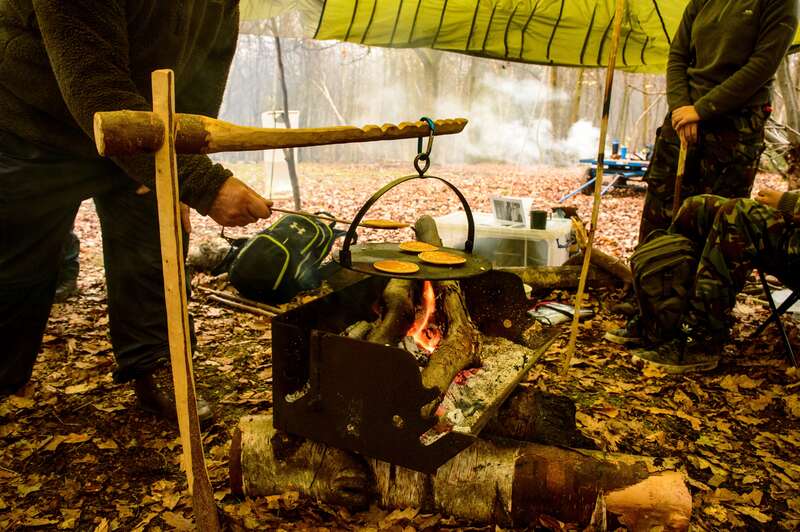 Dinner could be in one pot and the kettle on the other leaving plenty of room to sit comfortably around the fire without having lots of uprights protruding out (which can be a problem with other campfire cooking rigs). 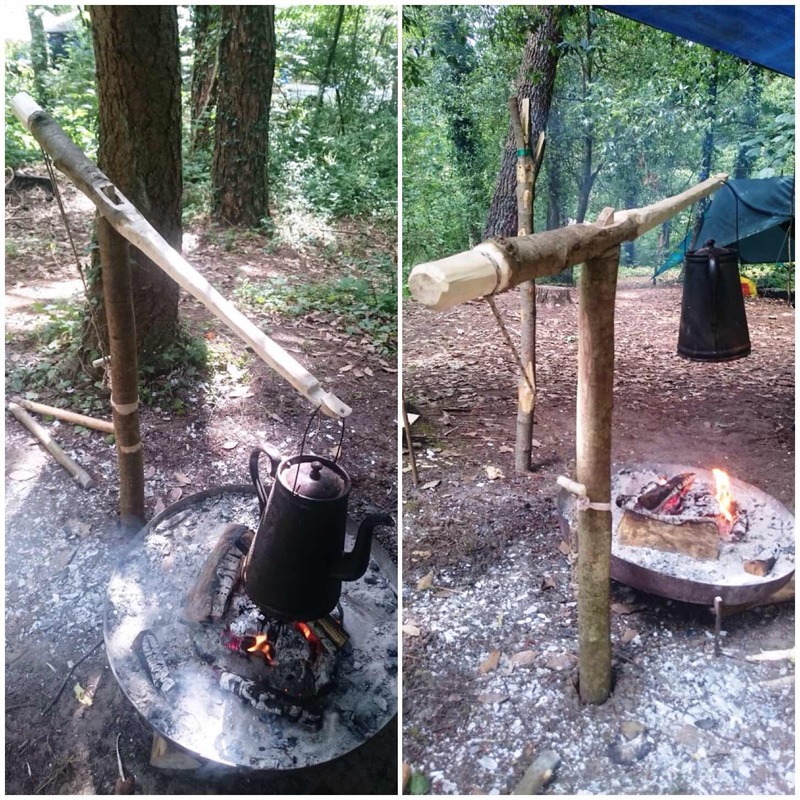 I took the set up out on a recent bushcraft course I was running to show some colleagues and set it up with a fixed crane. All in all it worked a treat. I could never call myself a chef however I could call myself a campfire engineer. 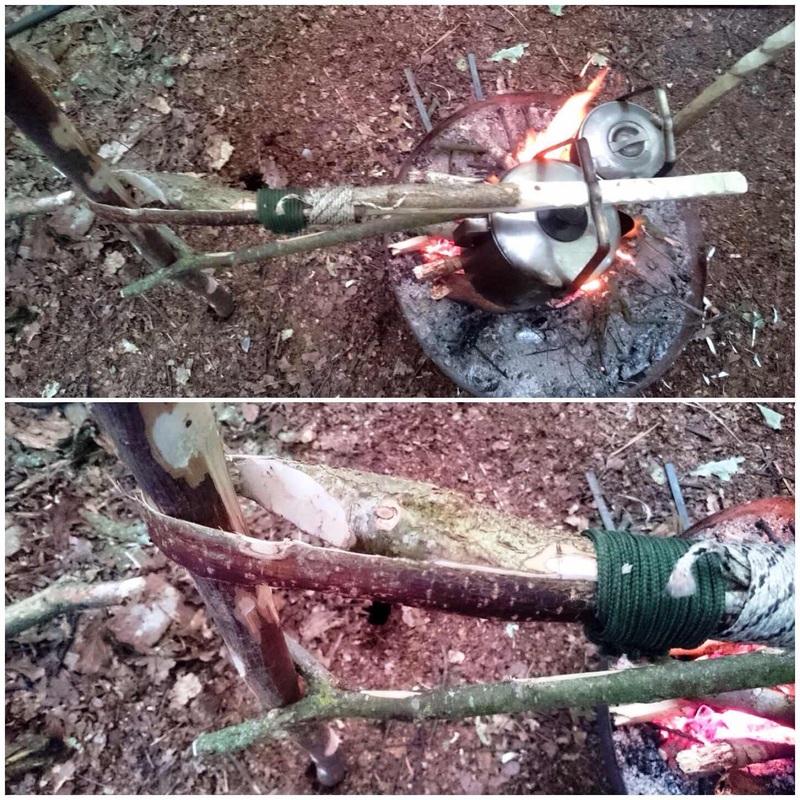 I love to make different cooking rigs that I can use around the fire depending on the circumstances I find myself in. 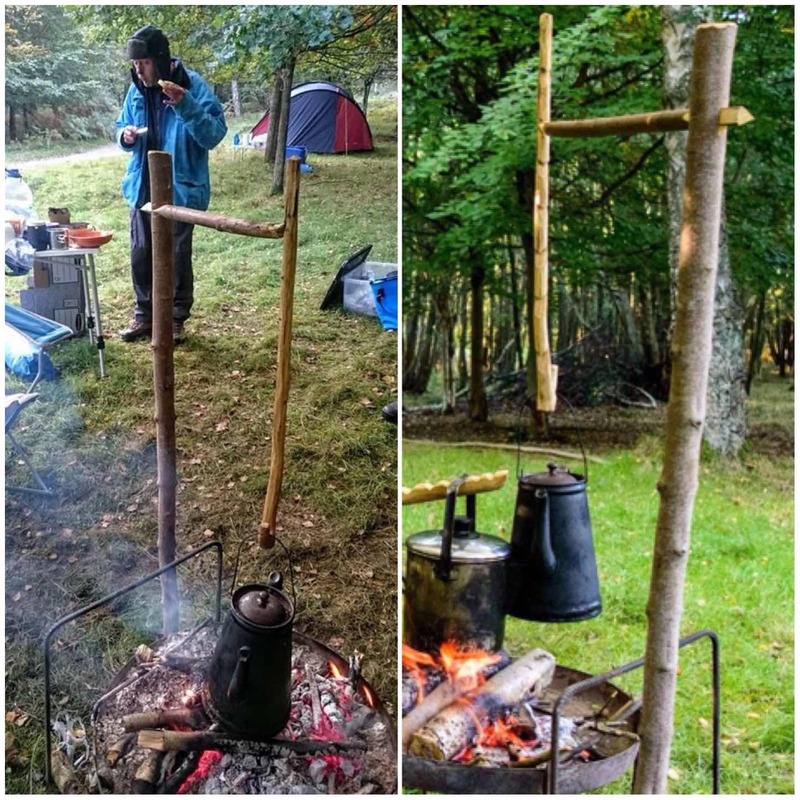 The Aures crane is one of these projects for the more long-term camp and is so easy to make. The crane is named after Victor Aures, a Scout Master from Buffalo, NY. I found a good article on this from an issue of the Boy’s Life from 1915. 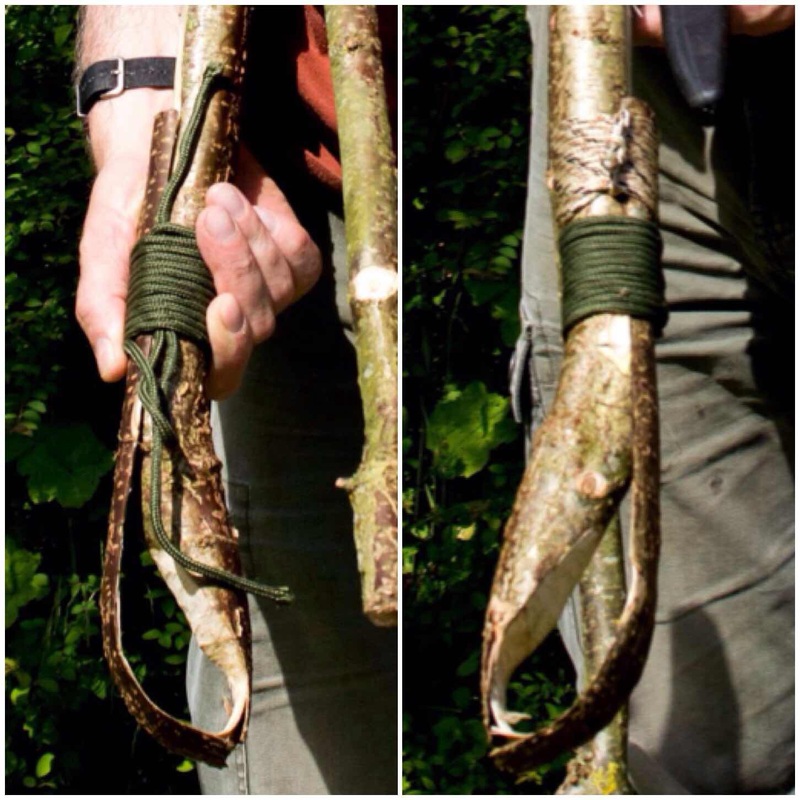 I also found a book called The Book of Camp-Lore by Dan Beard on the Project Gutenberg website that shows the original idea of wrapping the bark of one limb around an upright and a forked lower limb. I have been making these cranes for many years now but it was only once I started researching them that I discovered its correct name. This post does not cover the making of the Aures crane as shown in the Boy’s Life magazine or on in the Book of Camp-Lore (I will do that one later) but a variation of it. The picture below shows a classic Aures crane with a good secondary fork to rest against the upright. It’s not easy to find the exact combination of forks needed for this classic style so I set out to re-create the Aures crane using a branch with only one fork, as these are so much more common. 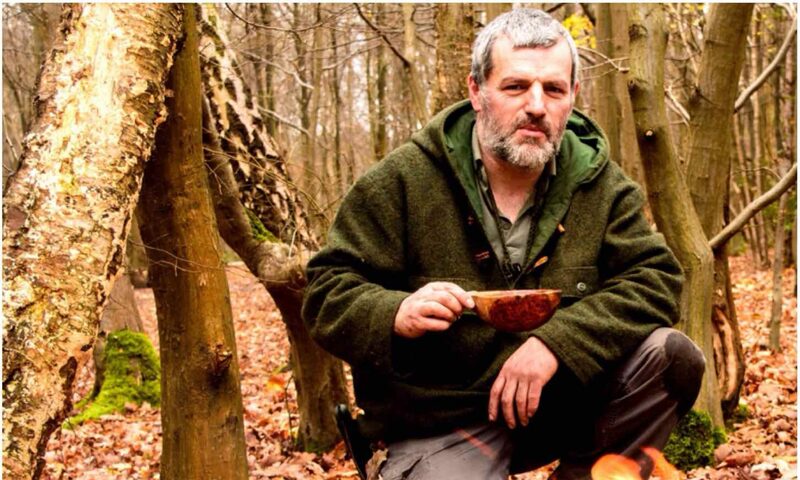 I chose a sturdy green piece of hazel wood with a single fork. After trimming the ends to the size I wanted I used my axe to get rid of all the lumps and bumps on the wood. In the bottom right picture the limb on the left I will be calling the upper limb and the one on the right the lower limb. Next I whipped some strong non-stretchy string onto the top limb of the crane. 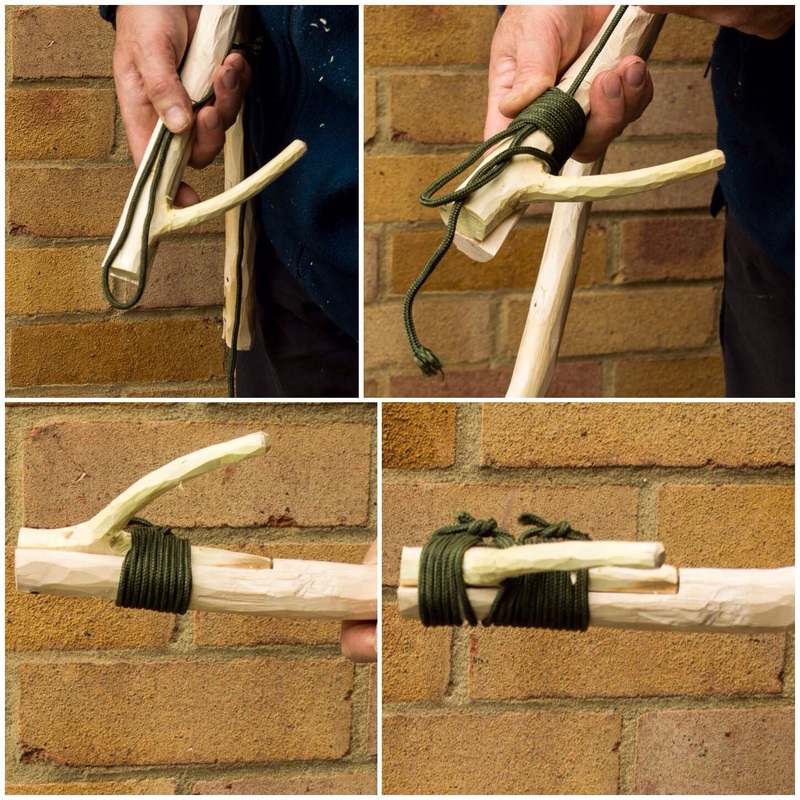 Grogs knots have a good tutorial on this, however it’s not necessary to whip in any particular way- just do it in whatever way works for you and binds that end of the limb tightly. One of the reasons I selected a fairly sturdy fork was that I needed to put in a stop cut about a third of the way down the top limb. 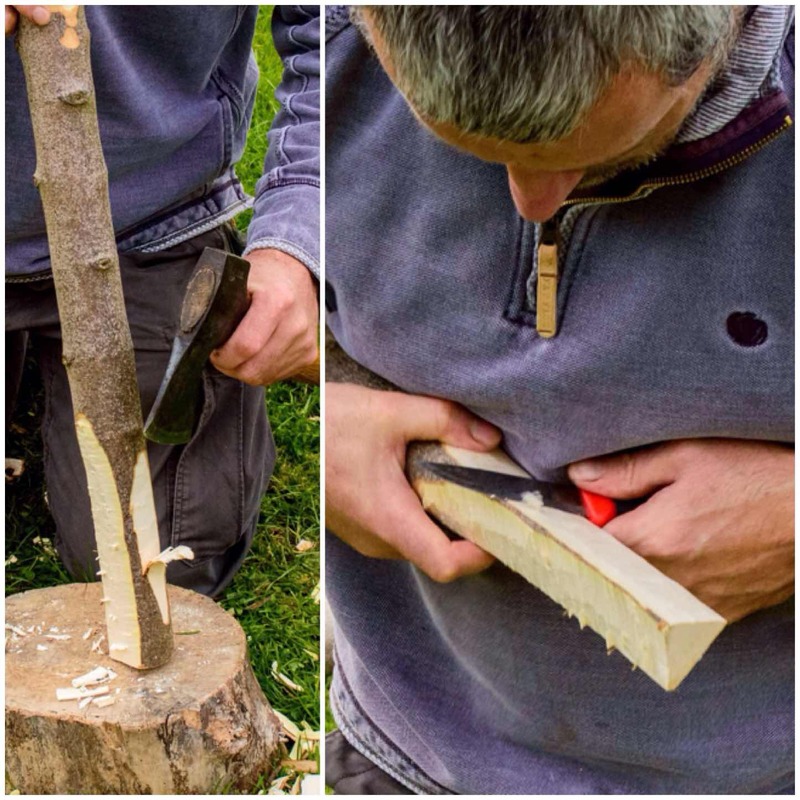 This stop cut will help you greatly in controlling the split you need to make to form the hook. 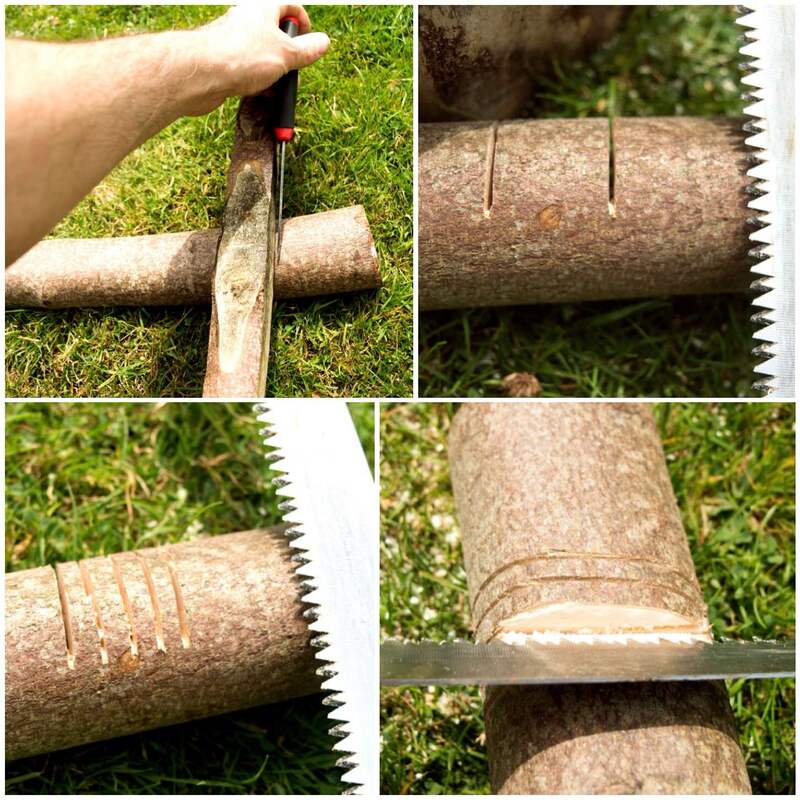 I sawed my stop cut to about two thirds of the diameter of the limb. 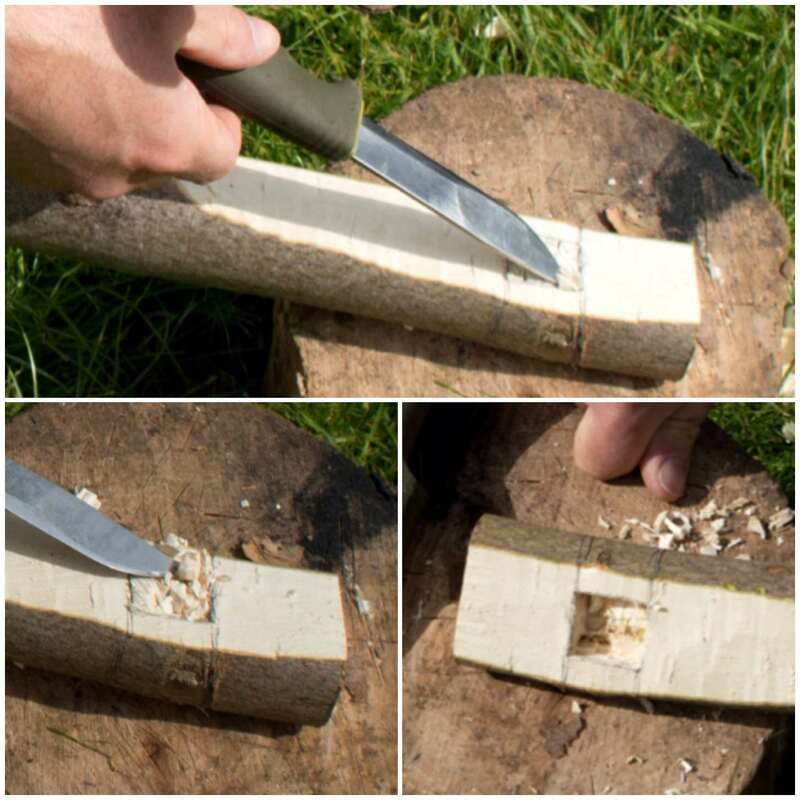 Using small cuts I then cut out a groove just above the stop cut towards the fork to the depth of the stop cut (the two bottom left pictures). This allowed me enough space to get my knife blade in to start battoning down to split the wood. 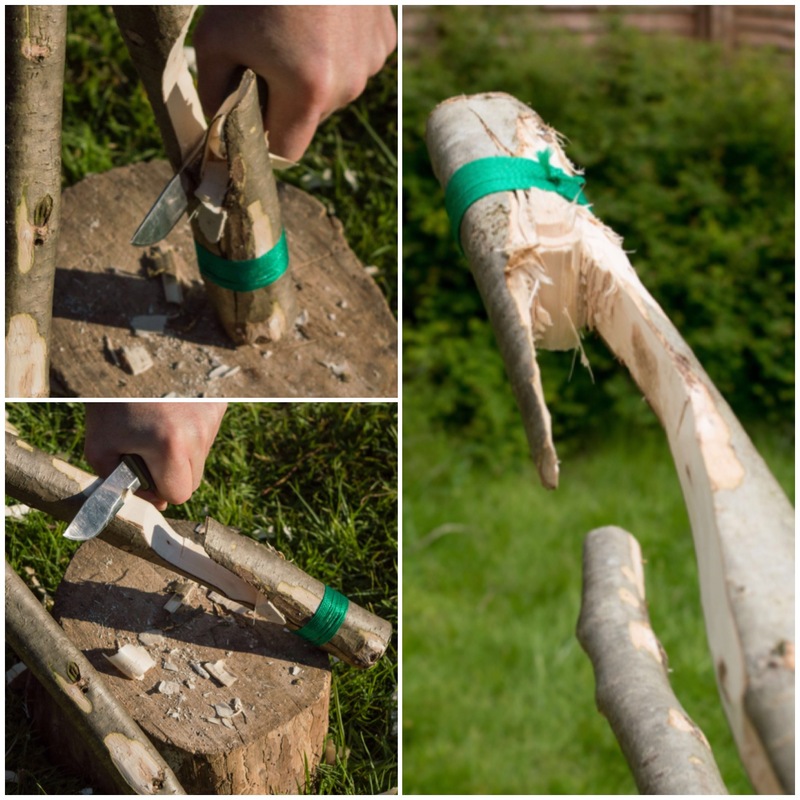 I was very careful when battoning not to let the blade touch the string that I had whipped onto the limb. Take care to wiggle the knife to remove it, keeping your non-knife hand well clear. I battoned a number of splits so as to easily carve them out. I also found that sawing down into the split helped with removing the wood. 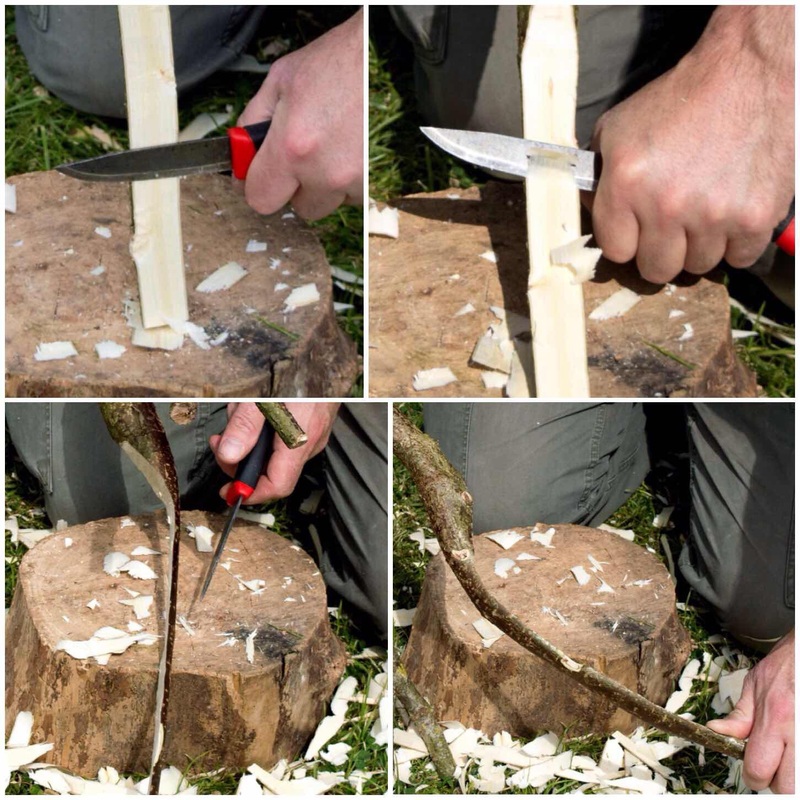 Once I had sawn or battoned down a number of times I carved out the excess wood by pressing down with my knife at a slight angle (you can just see the carved out area in the bottom left picture). 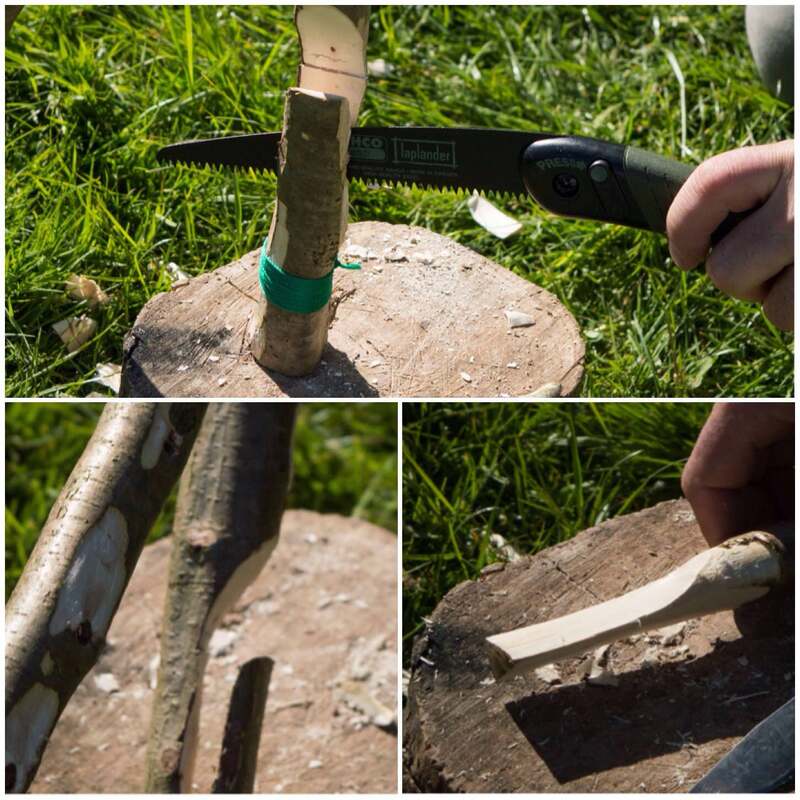 Next I took a small stick and carved it into a wedge shape to batton into the fork to expand it further. Double check that your whipping is secure and batton the wedge into the fork to expand it. Once it is securely fixed, trim the wedge so it fits neatly. I used my knife to carve some more wood from the inner part of the fork to expand it a bit more. At this stage I was trying the fork out on the upright pole to see how it fitted. 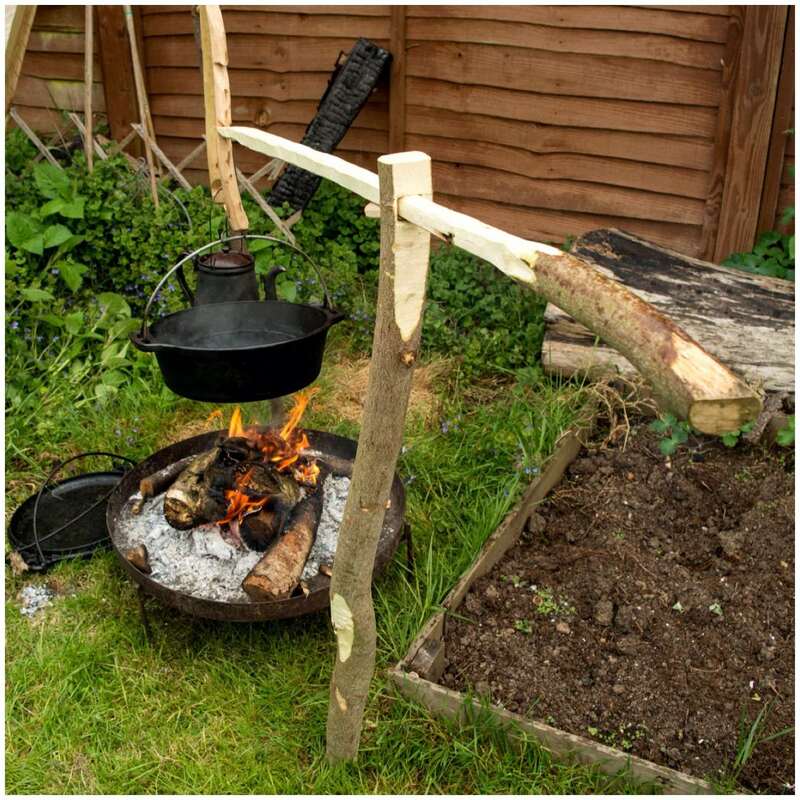 Don’t take off too much wood as you need to maintain strength in the fork so it will hold a heavy pot. I split the lower limb nearly all the way down to the main fork. Do this slowly so that the split remains even on either side. Make sure you get your angles right so that when the crane is placed on the upright everything fits neatly without twisting. 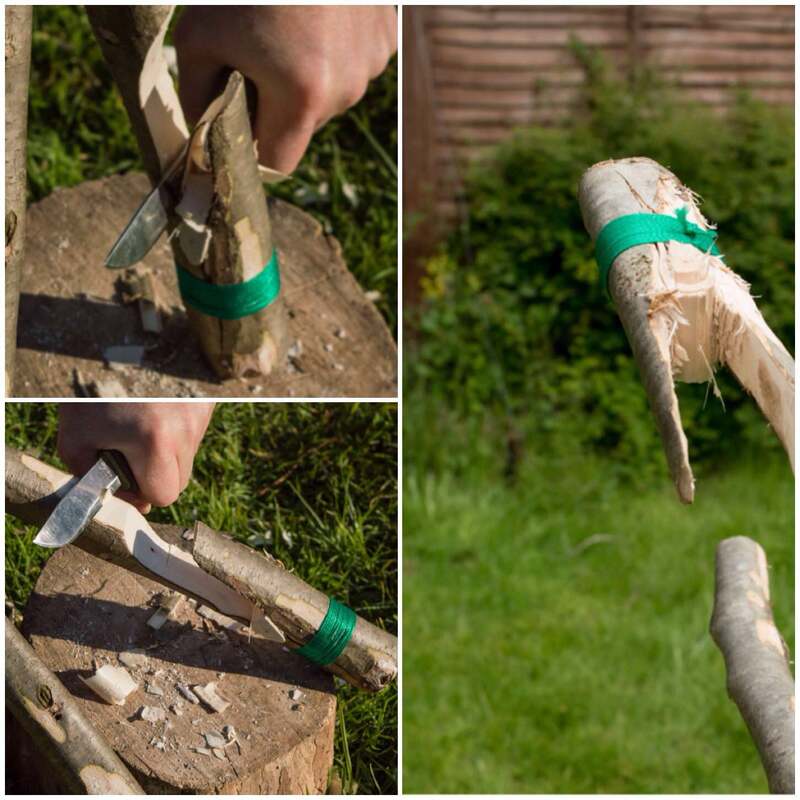 I carved another wedge to fit the lower limb split and whipped string on either side. To finish this section off I trimmed the wedge with my saw. 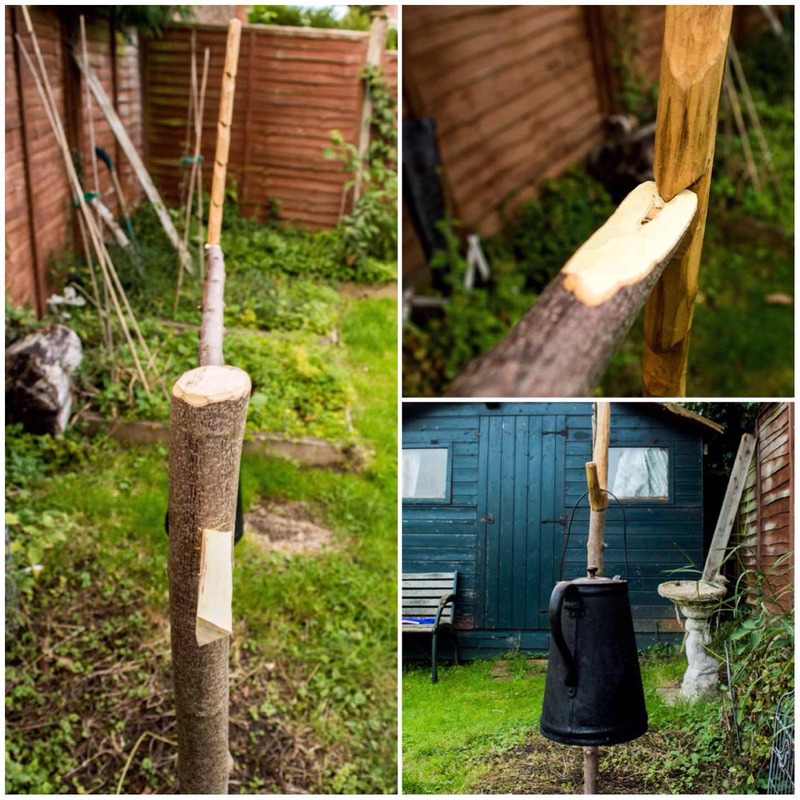 I removed a lot of wood with my axe and knife from the limb that would become the pot holder bar. I also battoned out some little grooves so as to hang pots safely. At the end of the bar I also carved out a little recess on which to hang an adjustable pot hook. After that I added some more binding to the top bar to make it really bomb proof. That’s it in terms of construction. 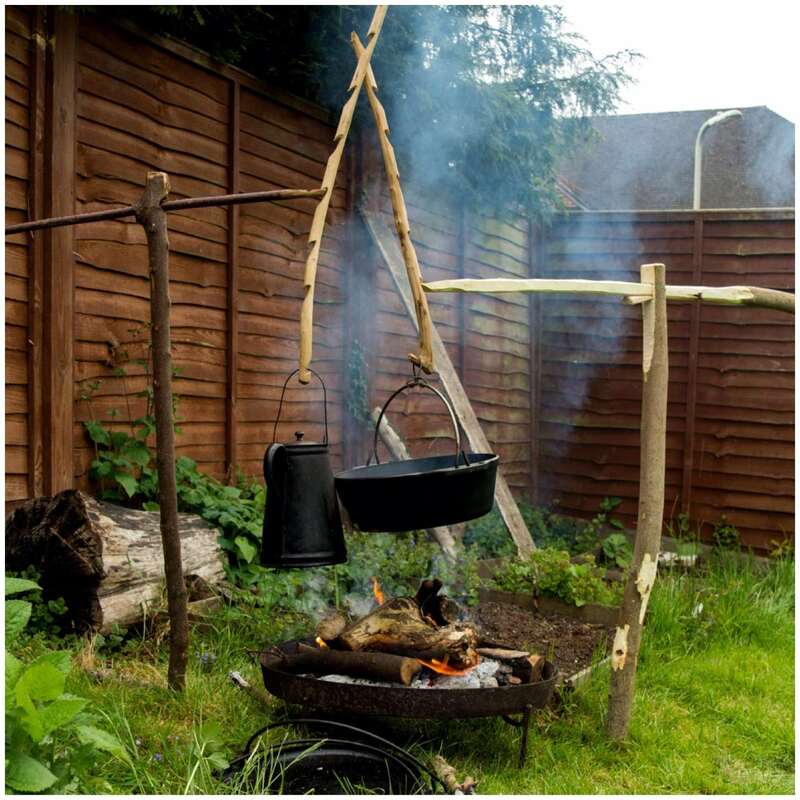 All the hard work is done now so all you have to do is light your fire, insert the upright, attach the crane and pot, adjust the height for optimum cooking and sit back. The picture at the bottom shows how you can also attach an adjustable pot hook to the end if you want. I have attached the Aures crane to the upright for my fixed crane allowing me to hang multiple pots. 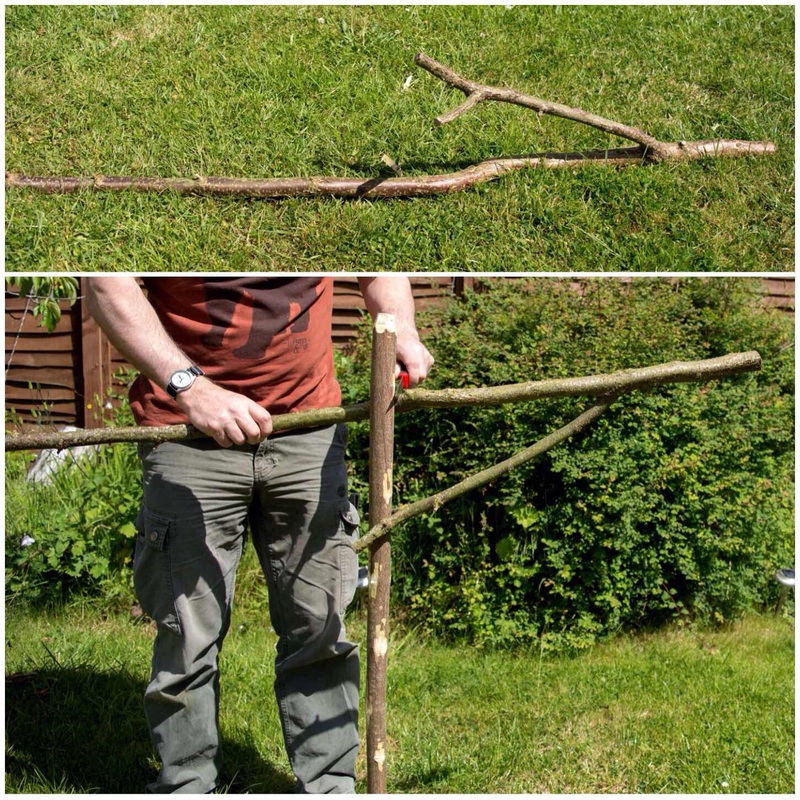 I have discussed how to make a fixed crane in my previous post How To…. 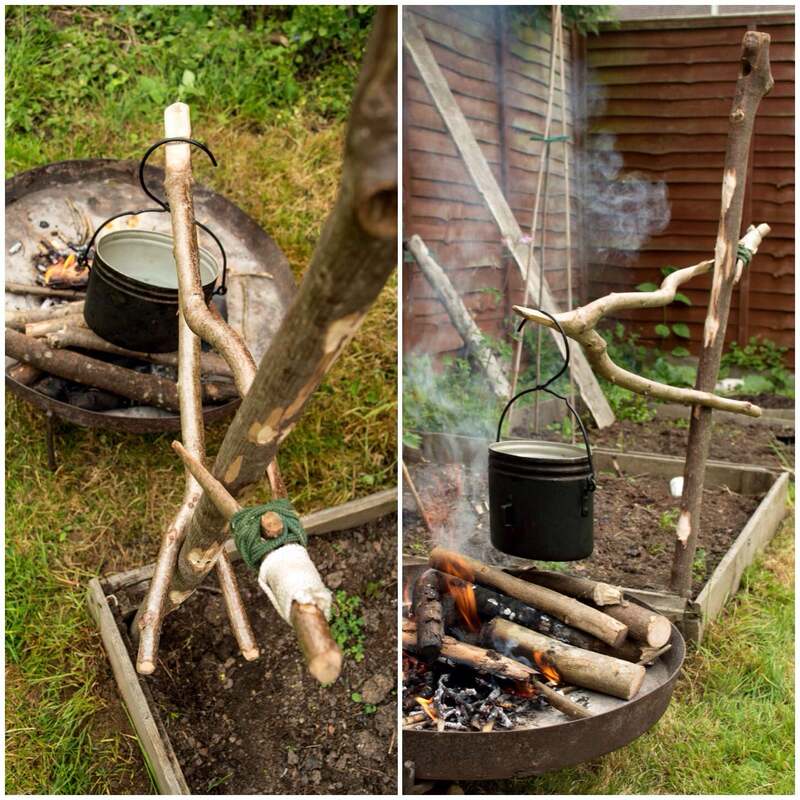 Build a Campfire Cooking Crane. The adjustable pot hook is only needed if you want different temperatures for the pots hanging off the Aures crane. 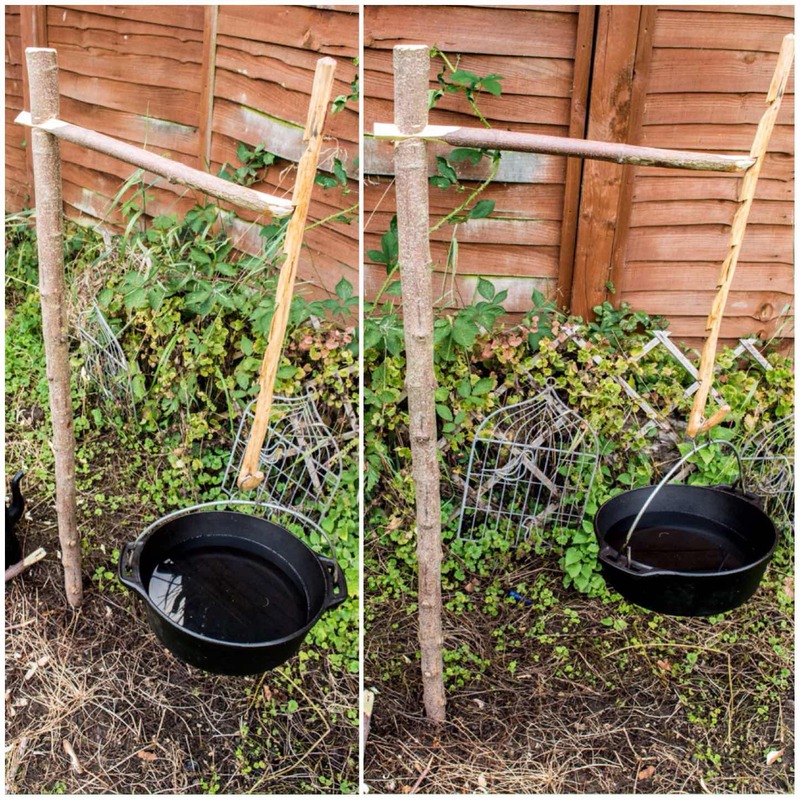 If you are happy for both pots to be at the same height both can be hung directly off your pot bar if it is long enough. The crane is easy to adjust for height with the pots attached and you can easily swing it away from the heat when required. Do not be put off by the length of the instructions: this crane is very easy to make. 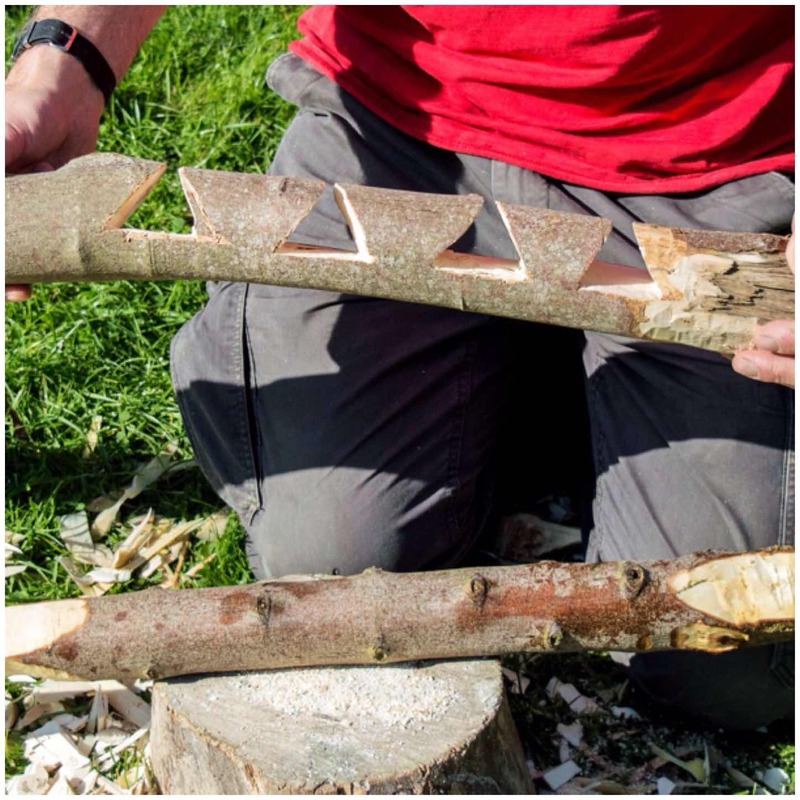 Some of my bushcraft friends say that it’s not worth the bother – that may be so for a short term camp but if you want to practice your carving skills it’s perfect for the job. I have a feeling I may be writing about a few of the other variations of the Aures crane in the near future. Sometimes space around the fire is at a premium. Sometimes you want an adjustable pot hook without a tripod set up. Sometimes you want to pour your coffee without getting burnt by the flames. If that’s what you want then build yourself a crane – It’s easy. 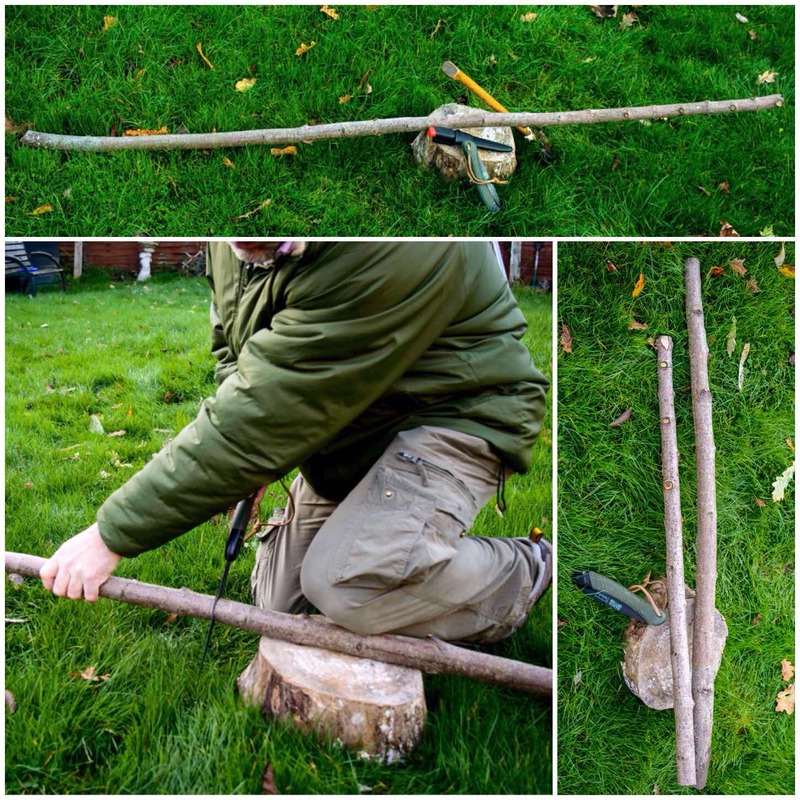 There are a number of different ways to build a crane set up however I decided to try just with the general tools I would carry in my rucksack. 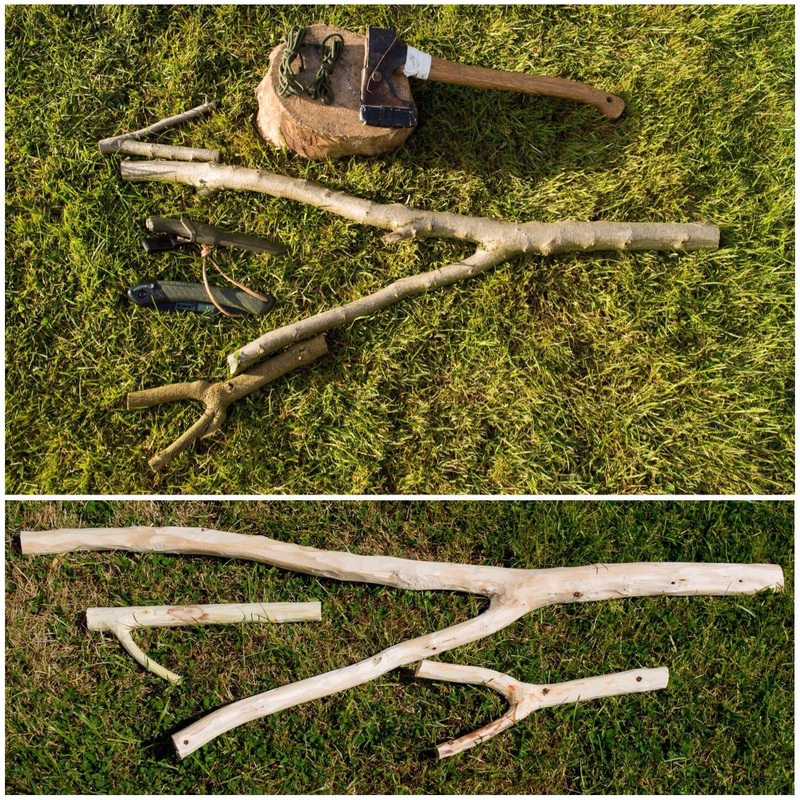 These included an axe, a saw and a general bushcraft knife. The wood I used was some sycamore I had recently polarded in my garden. The crane is made up of a thick upright and smaller pieces to act as the arms. I decided to make two different types of arms, one for small pots and one for bigger Dutch oven type pots. Sizes and dimensions will vary depending on how high you want your crane to be and what weight you want it to hold. I decided which part of the upright would be the top and then flattened it to give me a working area. You do not need to do this however I find it gives me a stable working surface. You can see in the pictures below that the girth of the upright is just larger than my hand as my fingers do not fully close around it. For the crane to work you need a hole at the top of the upright. 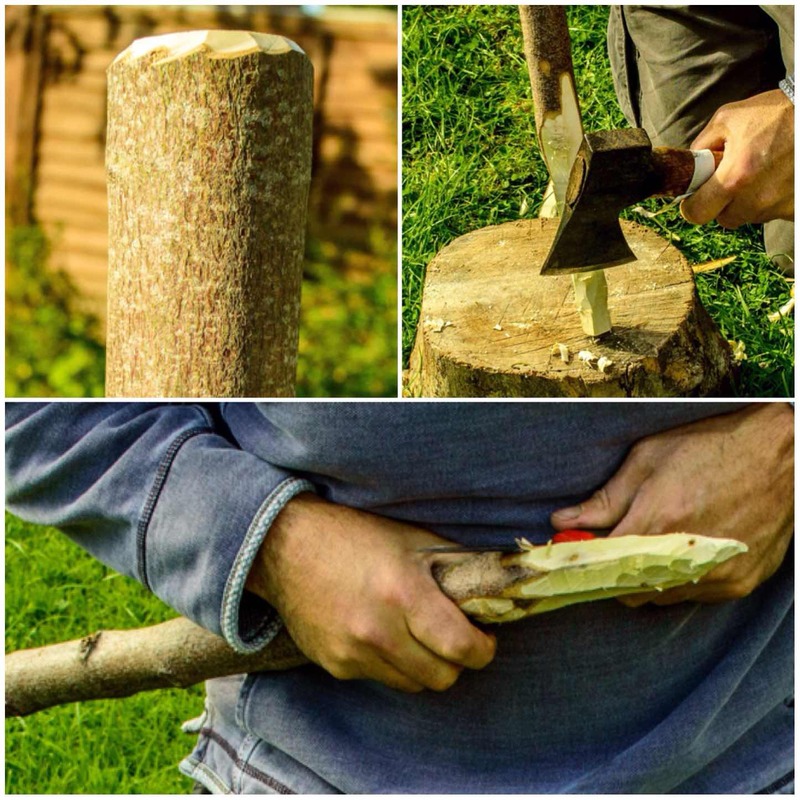 The size of the hole will depend on the size of the arm you will put through it and how much wood you want left around the hole for strength. As I was going to carve this with my knife I opted for a square hole as this style is easier for me to carve. Once I had pencilled out one side I marked up the opposite side. In this crane I made the hole at 90 degrees to the upright (makes life easy) but you can angle it if you want so that the arm will be pointing upwards more when inserted. I used my knife to score lines into the wood I wanted to remove. 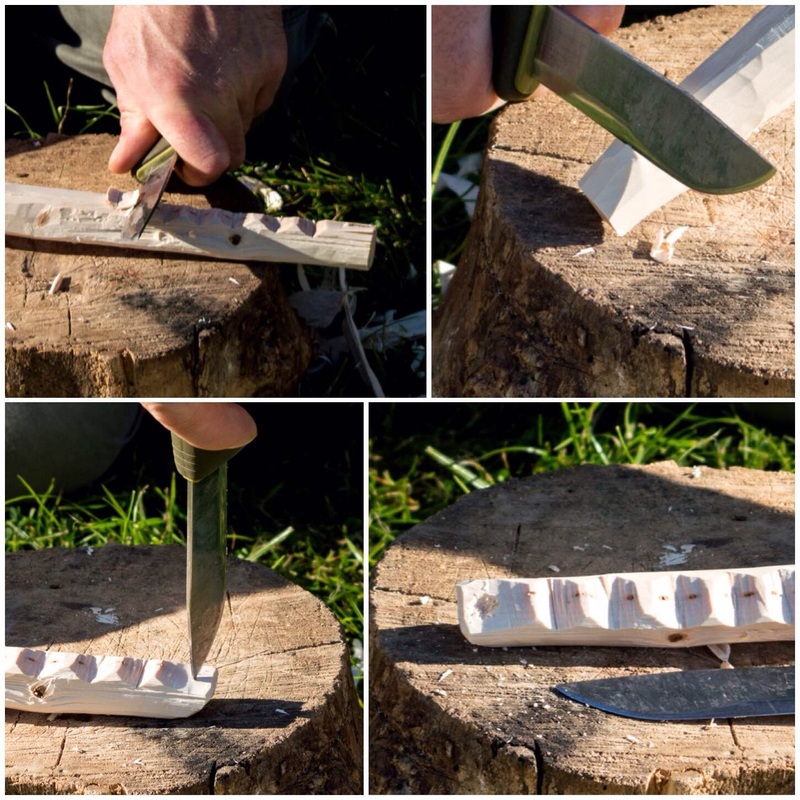 You can do this by gently tapping your knife handle with a batton or rolling the curved part of the blade. 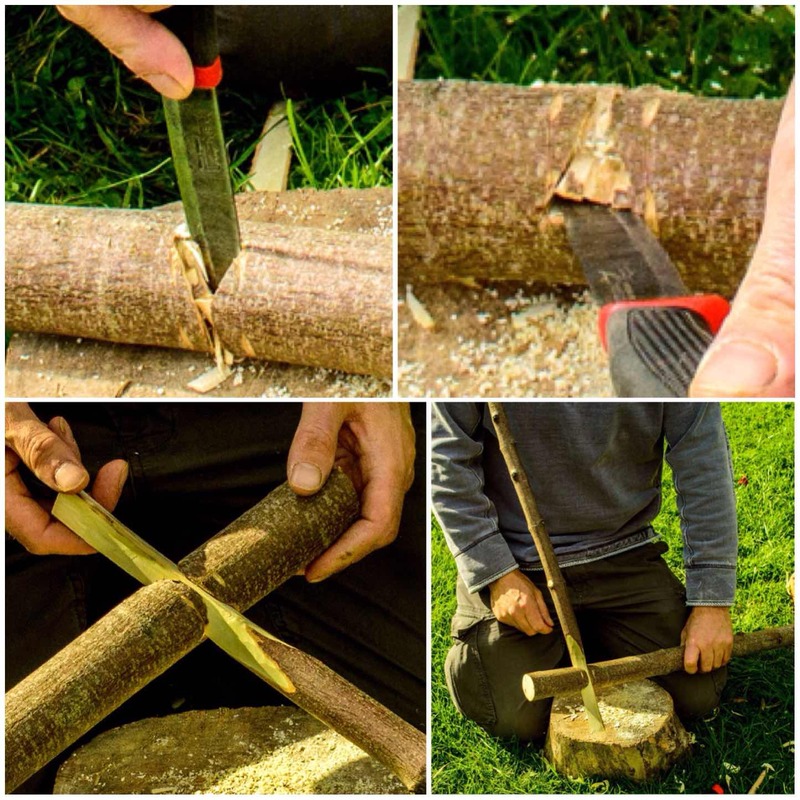 You need to do this gently so as not to cause unwanted splits in the wood. 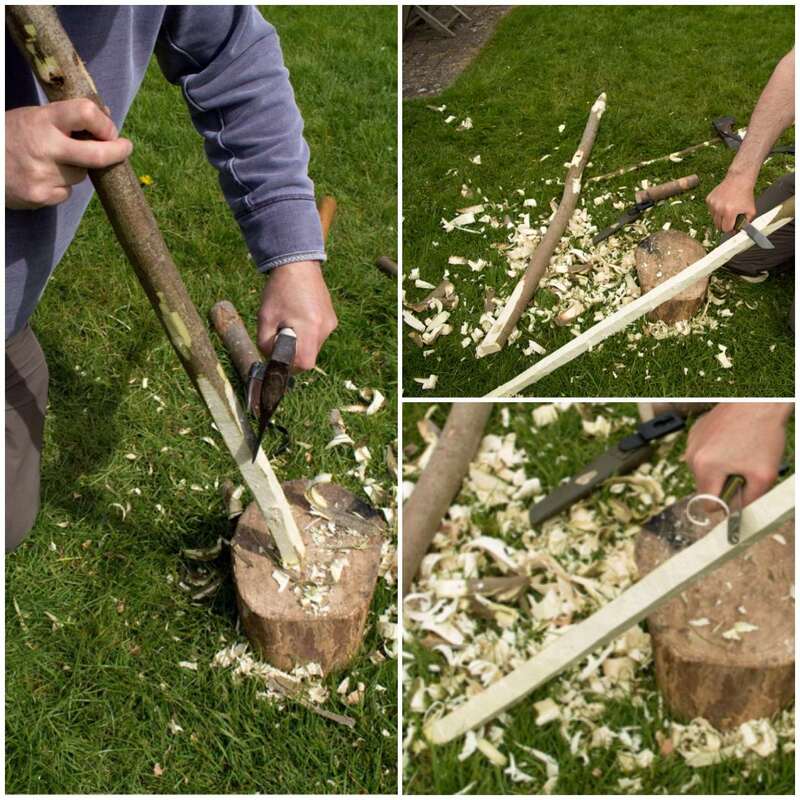 Also make sure that the work piece is secure on the ground and that your free hand (if not battoning) is well clear of the knife edge. To remove the wood I just pushed the tip of my knife inbetween the scores and prised it out. Again I did this gently alternating between pushing on the handle with my hand or doing light taps with a batton. When I twisted the point I did so gently so as to not cause any unwanted splits or worse still – snap off the tip of my blade. I did another set of scores and chipping until I was about halfway through the upright. I then repeated the exact same procedure on the other side until my knife popped through the other side. 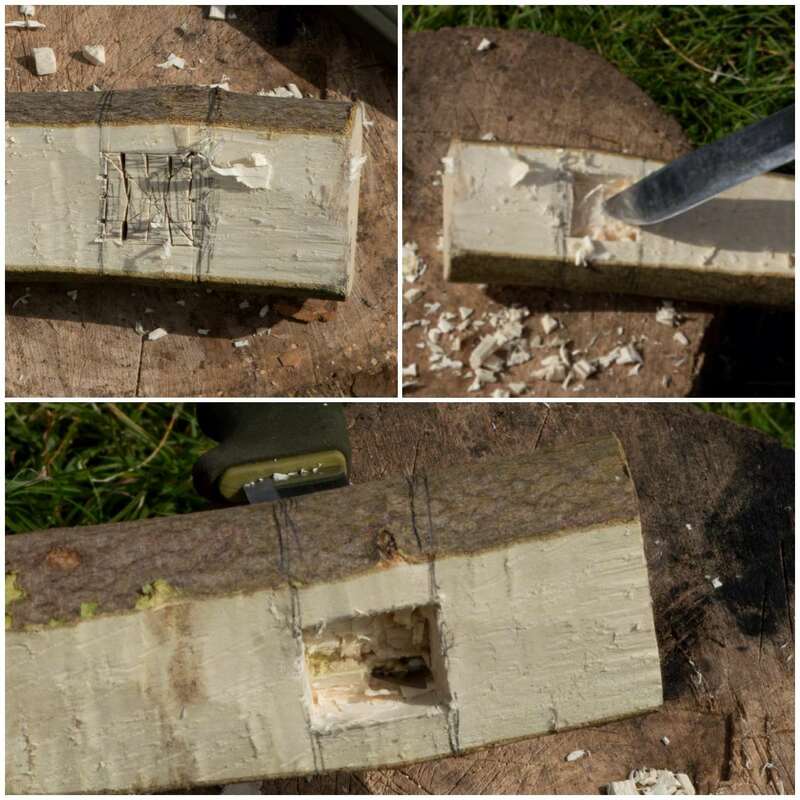 Once the plug of wood was removed I trimmed the internal walls of the hole (using the wood I would use as an arm as a guide) and chamfered the edges off. 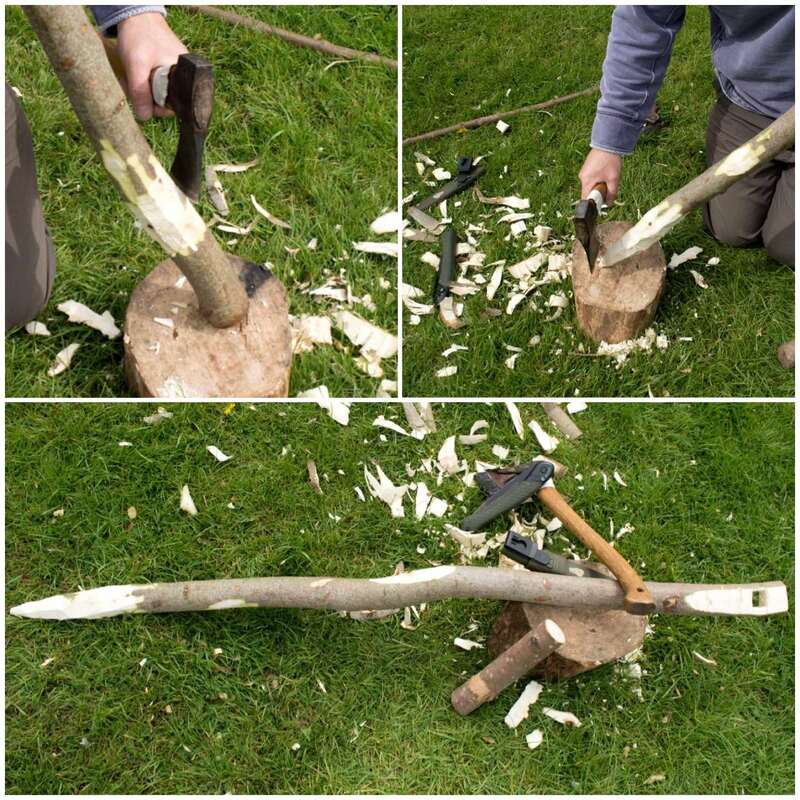 The upright was finished off with all the knobbly/sharp bits being removed and a point was axed out at the bottom of it. 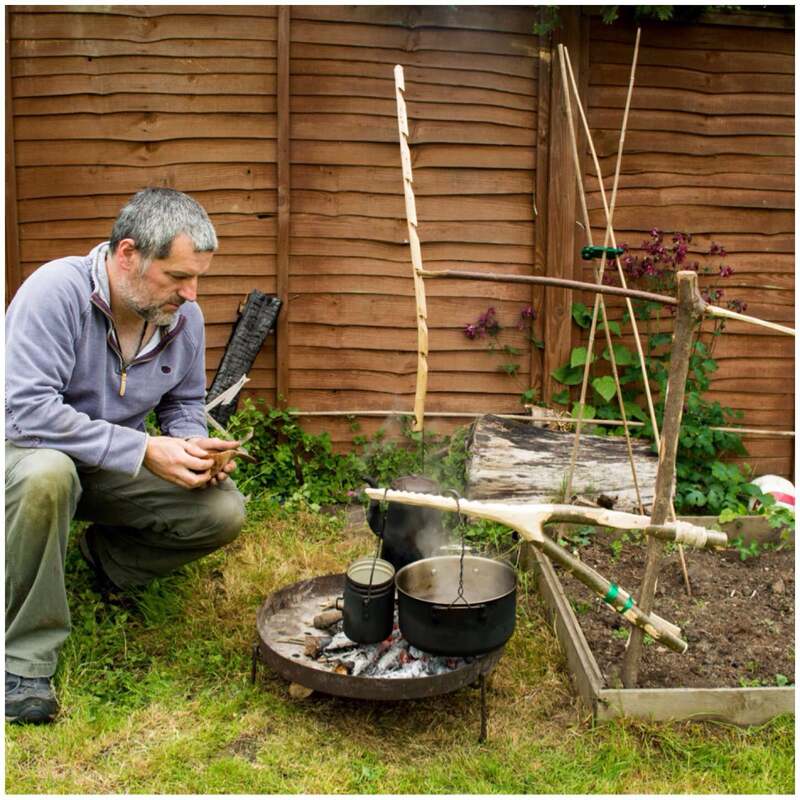 I made the arm for the lightweight pots from a thin piece of sycamore. I trimmed a flattened piece near the end and carved a small dimple with the point of my knife in it. The small dimple is needed to keep the adjustable pot hanger in place. 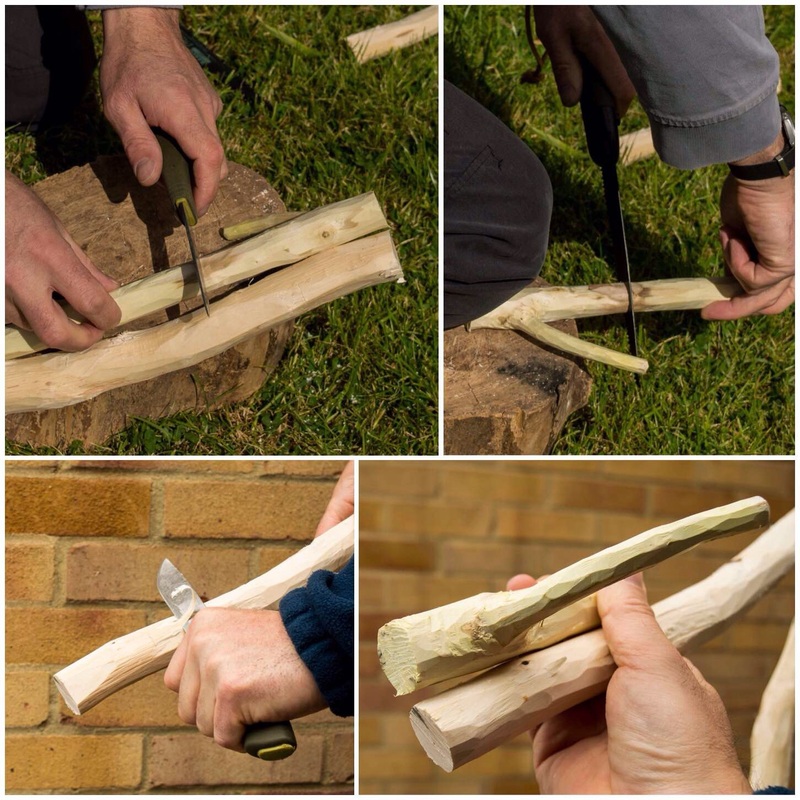 I have covered the making of the making of an adjustable pot hook in my post How To…. 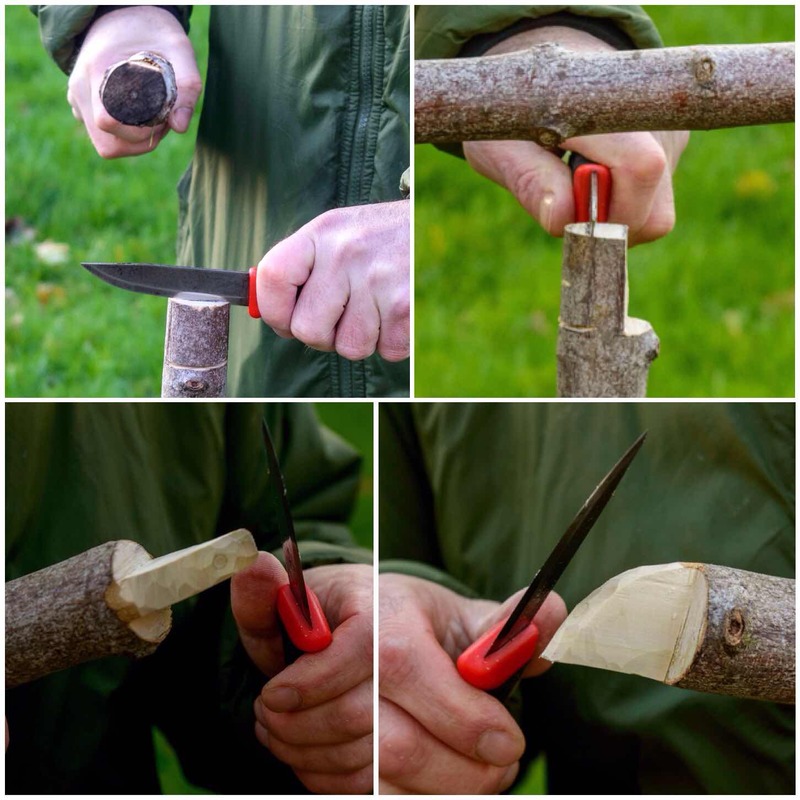 Carve and use an Adjustable Pot Hanger. 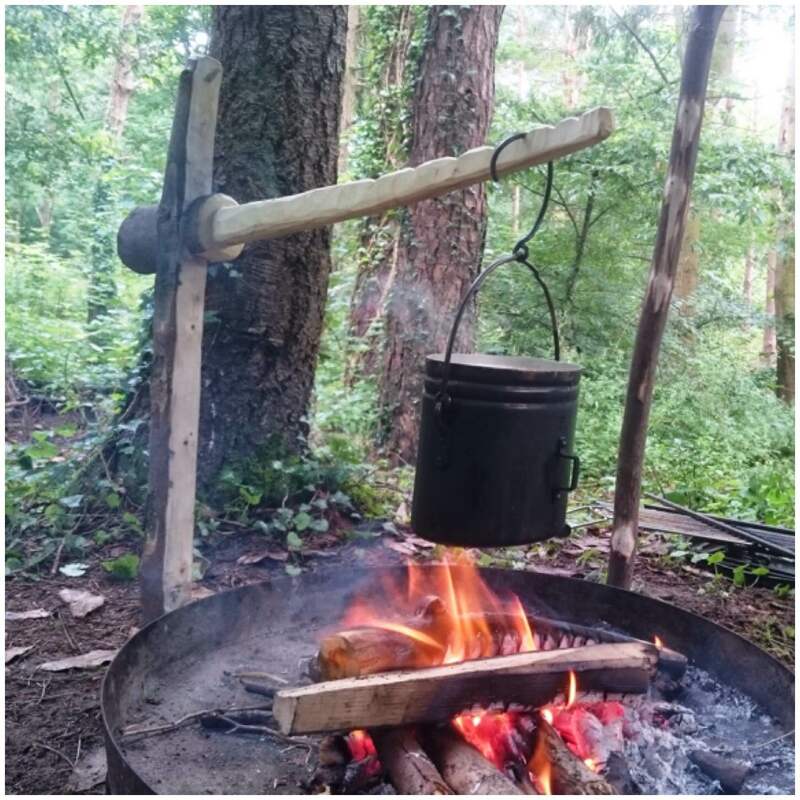 In my previous post on making a Double French Windlass Cooking Rig I explained how to make a pile driver. I used this pile driver to make a hole for the upright to sit in. Once you have created the hole it is just a case of gently tapping the upright into place. 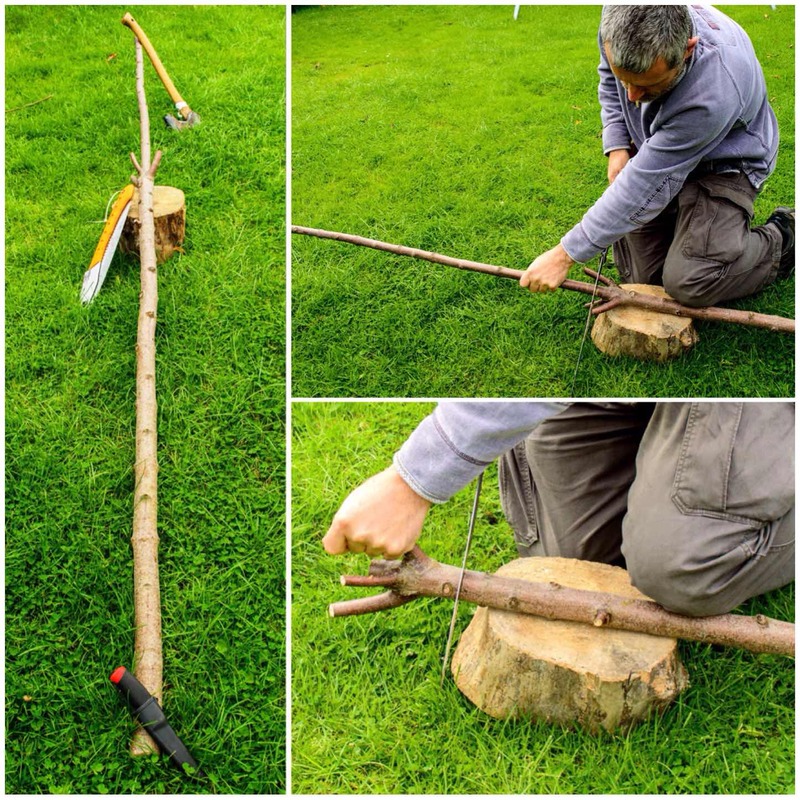 If you did not use the pile driver you would need to hit the upright hard to drive it into the ground and very quickly the wood around the hole would crumple or snap. 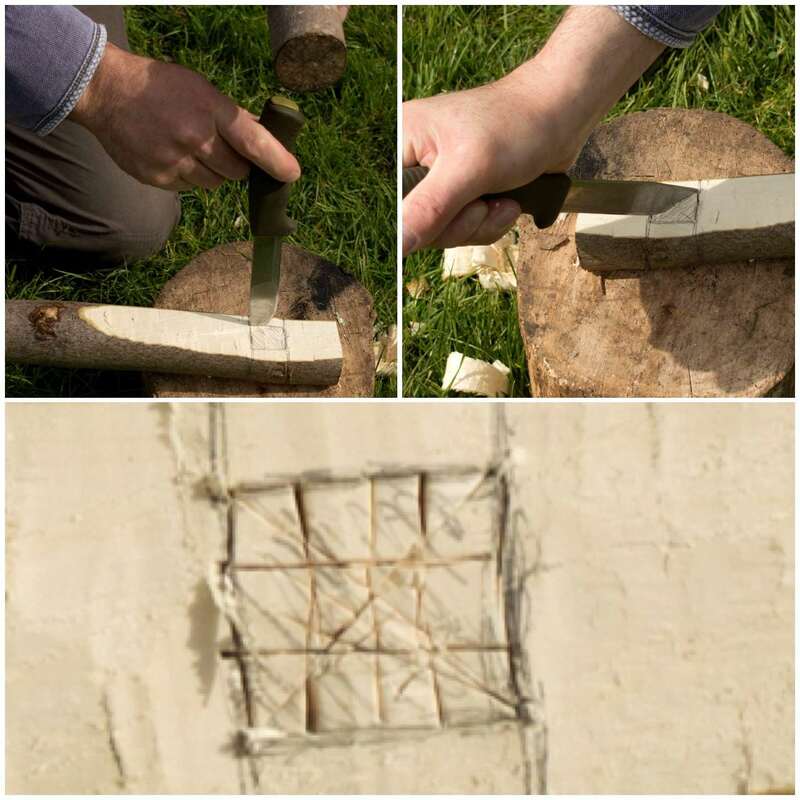 As I had not made the hole at an angle I carved a small wedge to hold the arm securely and also to raise the tip up slightly. When the arm is in place in the hole just tap the wedge into place gently. Do not ram it in as this could cause undue pressure and split the wood. Then it is a simple case of attaching the hanger with your pot or kettle onto the arm. 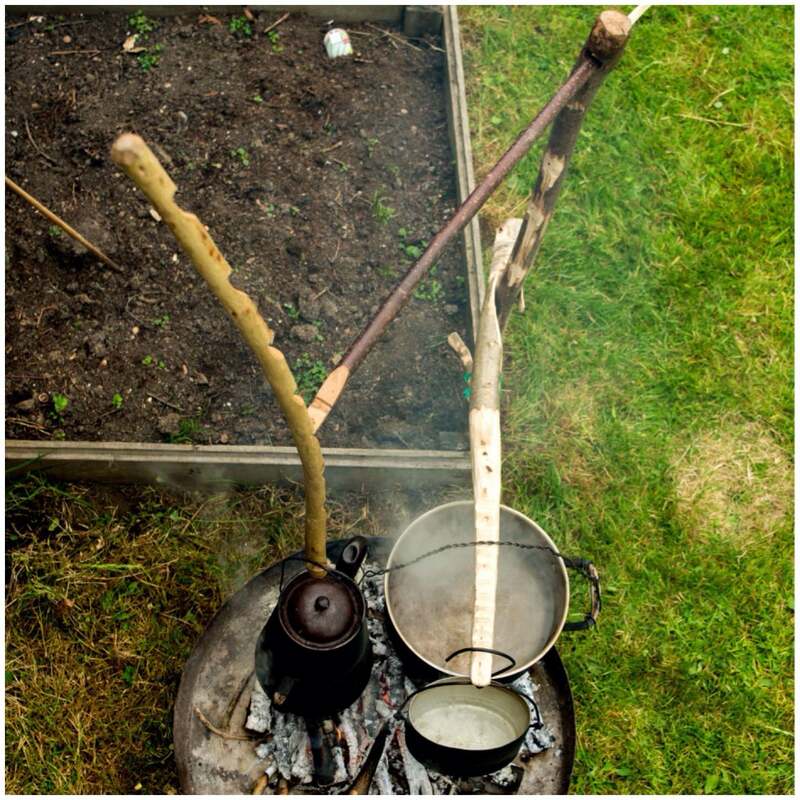 I like this system as it is easy to adjust the height of the pot and the whole crane can be swivelled to move the pot away from the fire easily. In the picture below I have left the back of the arm overly long but I will trim it shorter eventually. As I had made a square hole I got a bigger piece of sycamore and squared it off along its length to fit exactly in the hole. This arm was designed to take bigger pots like a dutch oven. The end was shaped to fit the pot hanger. Then set up exactly as the first arm. This time though I tested it out with a dutch oven half full of water. I have a few of these cranes so I set up another one to put the kettle back on. I had used an auger and a palm gouge to carve this one out so you can see it ended up with a round hole. No wedge was required as the hole was set at a slight angle. After the water in the dutch oven had boiled it was easy to raise it all up off the heat. 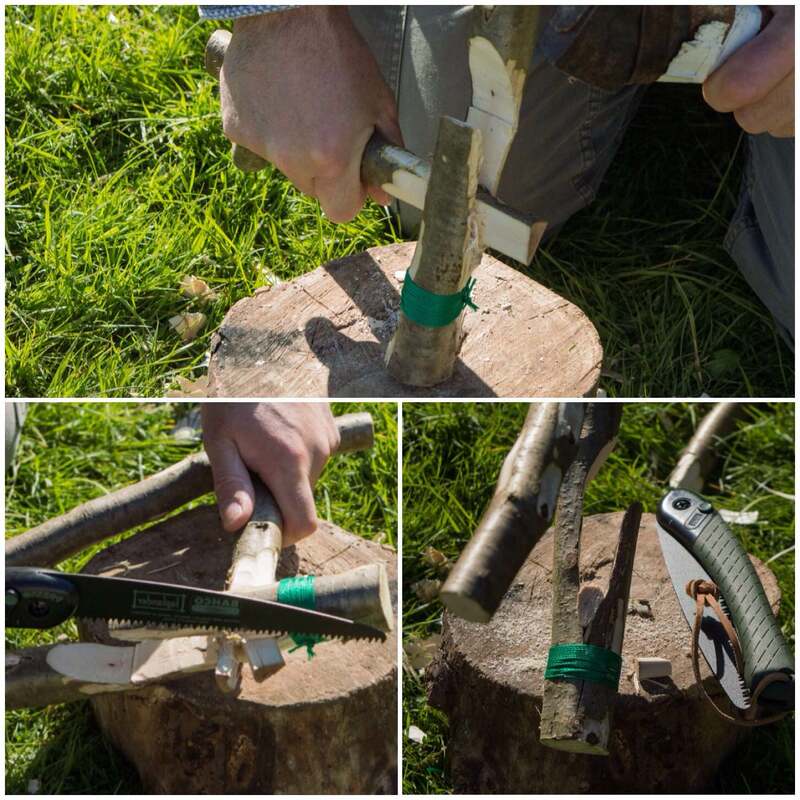 If you plan to use these cranes on a longer term basis they may develop a crack if you are using green wood. This happened to this crane about a week after I made it but I secured it with a bit of whipping. You can do this right at the beginning if you wish or when you see a split start to appear. The whipping will be well clear of the flames so I am not worried that it will be burnt through. If I had not being taking pictures along the way I would have completed this rig in about an hour or so. 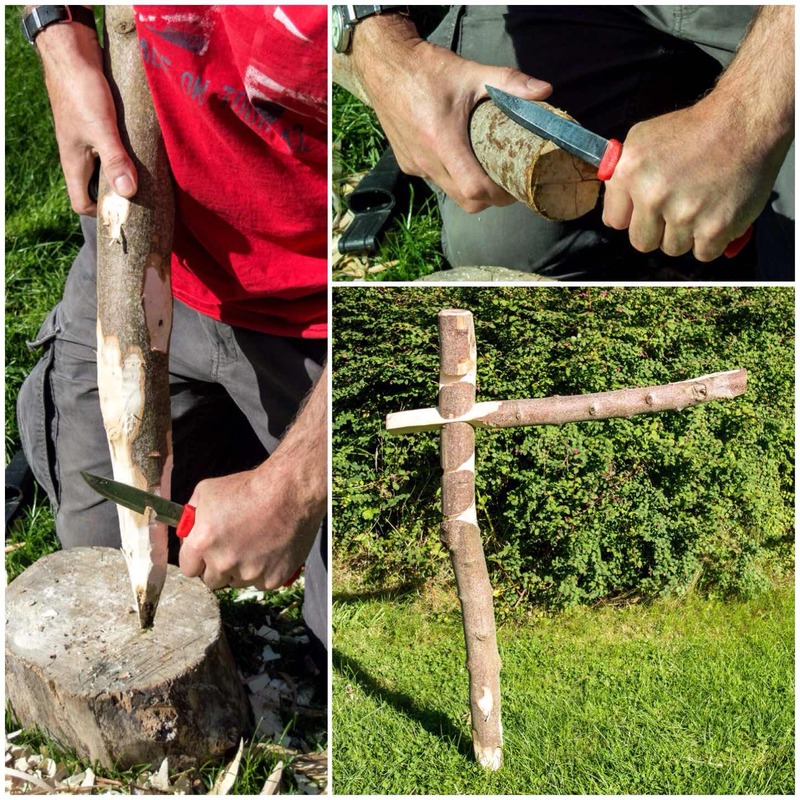 There are other ways of doing this and other tools you can use so I will leave it to your imagination but if you are someone who likes to tinker around the campfire then I would give this one a go.